From March through early September 2016 the Ronald Reagan Presidential Library hosted the exhibit titled Vatican Splendors; one of only two locations in the United States the exhibit was shown in its year away from the Vatican. The exhibit was organized by Texas company Evergreen Exhibitions. All copyrights and trademarks are the property of their owners. TomsFotos only claims copyright to the photos taken, with permission, at the exhibit. If you desire photos of the exhibit for commercial or other use please contact Evergreen Exhibitions. None of the photos here are authorized for use by others. The photos below were taken over the period the exhibit was in place and show, to the extent possible, all the material exhibits on display. There was much more provided as text descriptions; these are not shown here. 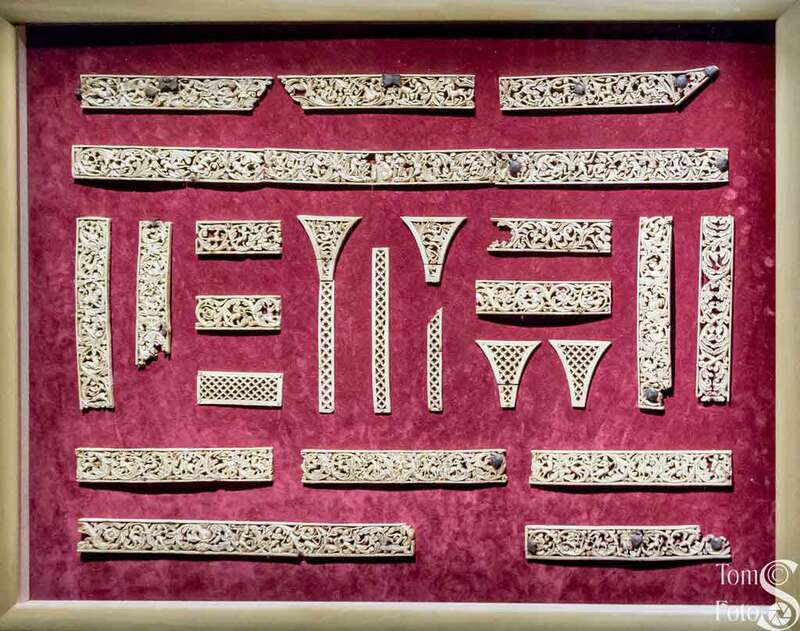 These are pieces of material recovered by archaeologists from the Vatican Necropolis. They are basically decorative marble fragments. 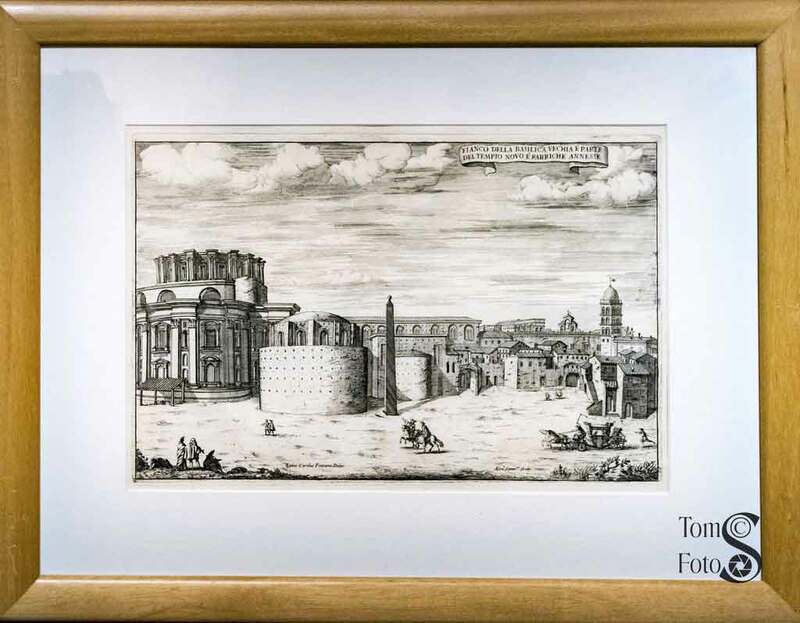 Etching from the work “Il Templo Vaticano e la Sua Origine.” It shows a view of Nero’s Circus, the place where Christians were tortured and killed and the place where Peter was said to have been crucified (upside down). The work is print on paper and dates from 1694. While dating from 1950 these watercolors represent decorations on Mausoleum walls dating from 140-150 C.E. 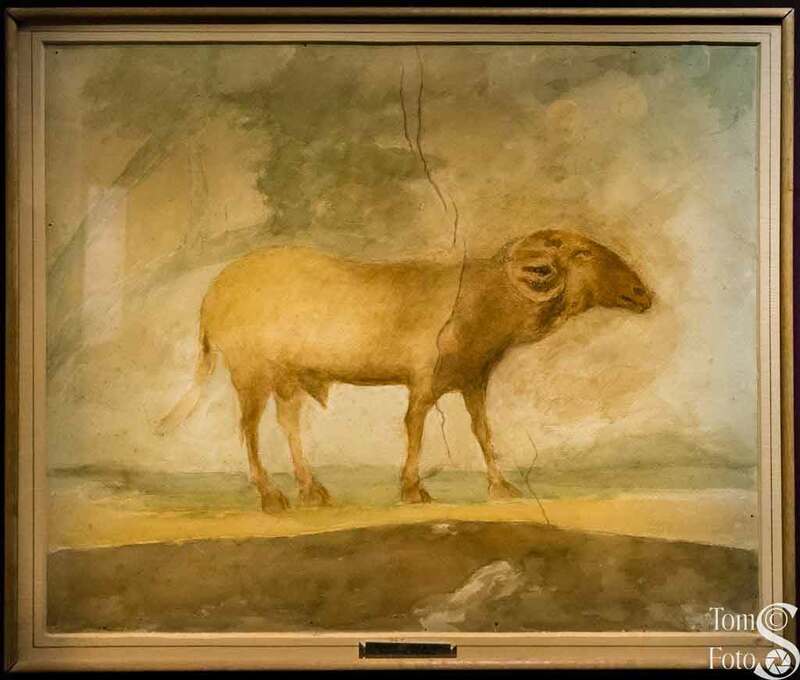 The drawings show a ram and a bull. The main highlight of this gallery is the plaster cast of a fragment from the red wall of Saint Peter’s tomb. The site, covered with graffiti, was discovered in the necropolis in 1941. 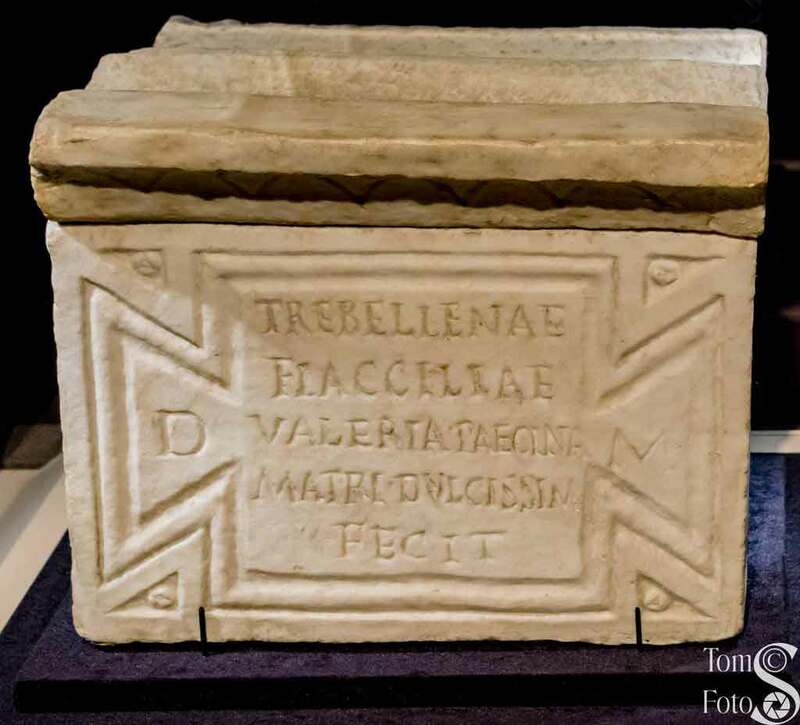 The Greek inscription shown says “Peter is here.” Blessed Paul VI announced in 1968 that the bones of Peter had been identified at the site. 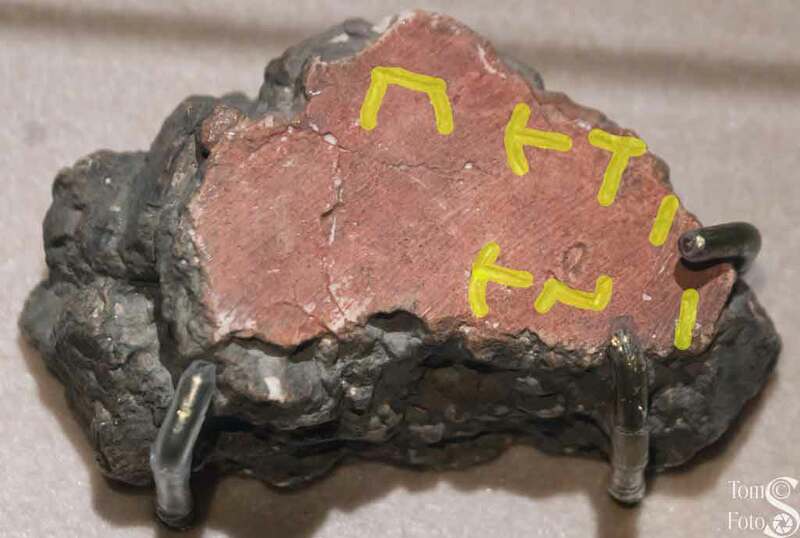 The photo on the left shows the fragment; the photo on the right has the Greek text highlighted in yellow. 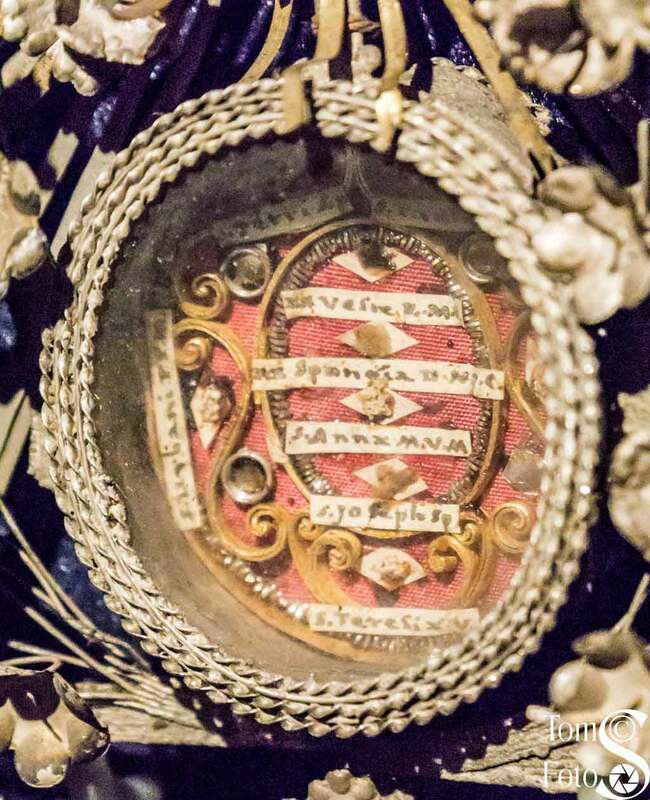 Votive items were often left at holy sites. 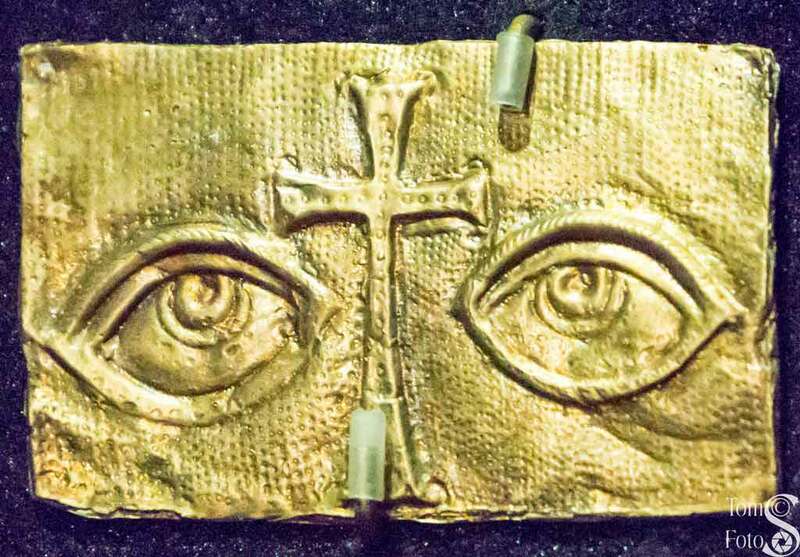 Here we see a reproduction of a gold votive plaque found wedged in the area by Peter’s tomb. The image appears to be a “thank you” to Peter for interceding with Jesus to cure an eye problem. 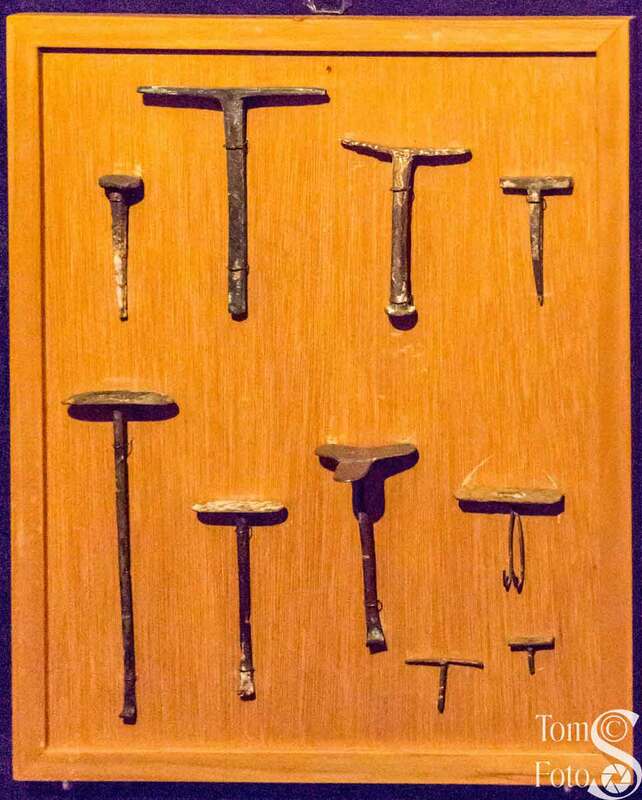 This small pin was found near Peter’s tomb and was used to fasten clothes. The small filigree shows the Chi-Rho (a “P” embedded into an “X”) which represents the first two letters of the Greek word for Christ. It’s interesting that later Constantine adopted the Chi-Rho as an official imperial insignia and the design continues to today. 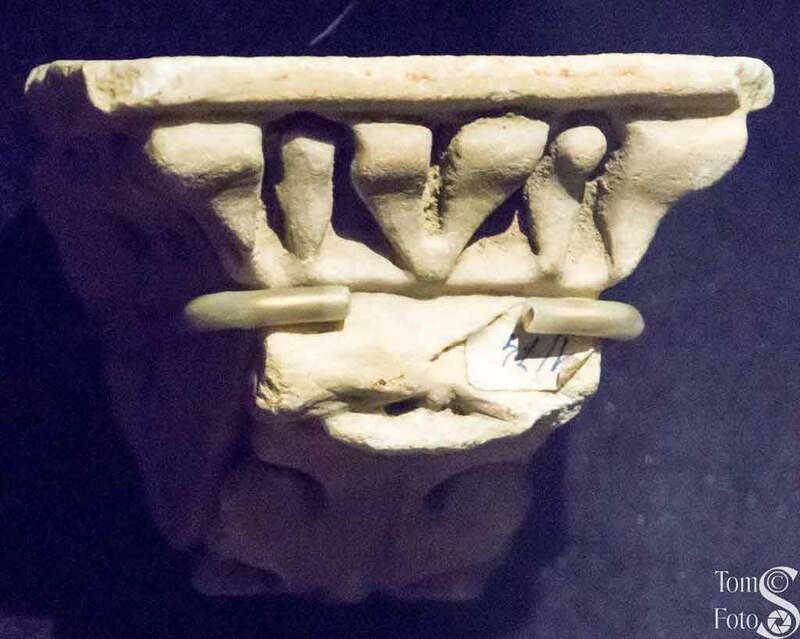 This piece, found in the Roman catacombs, was the base of a goblet. 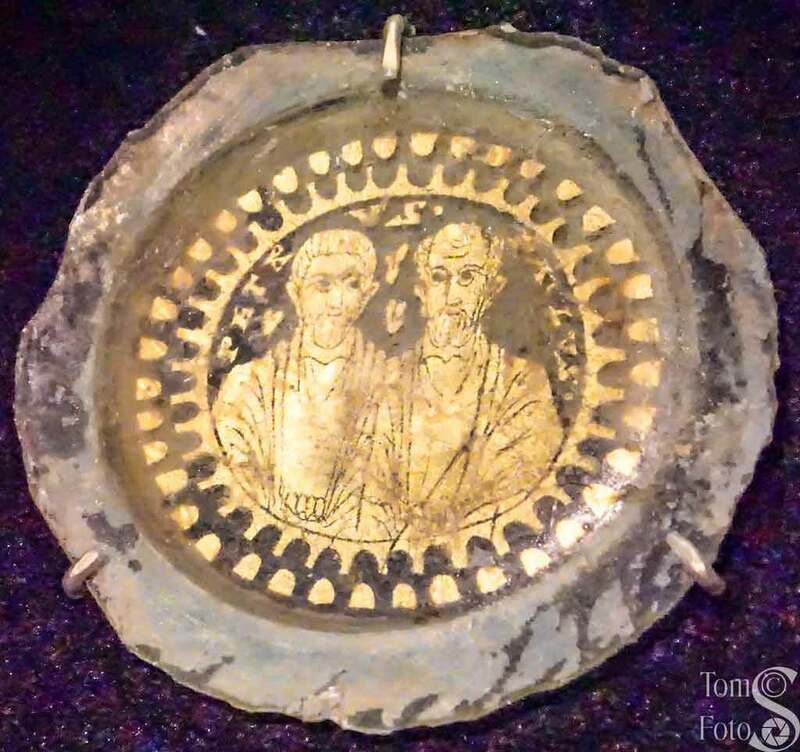 It is three layers, an inner layer of thin gold pressed by glass on both sides and was a common form of portrait in later Roman times. 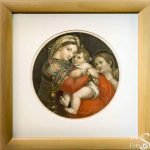 It’s made by pressing a thin layer of gold or gold leaf onto a piece of glass and then using a fine tool etching away the parts of the gold that are not part of the portrait. When done, another layer of glass seals the portrait in place. 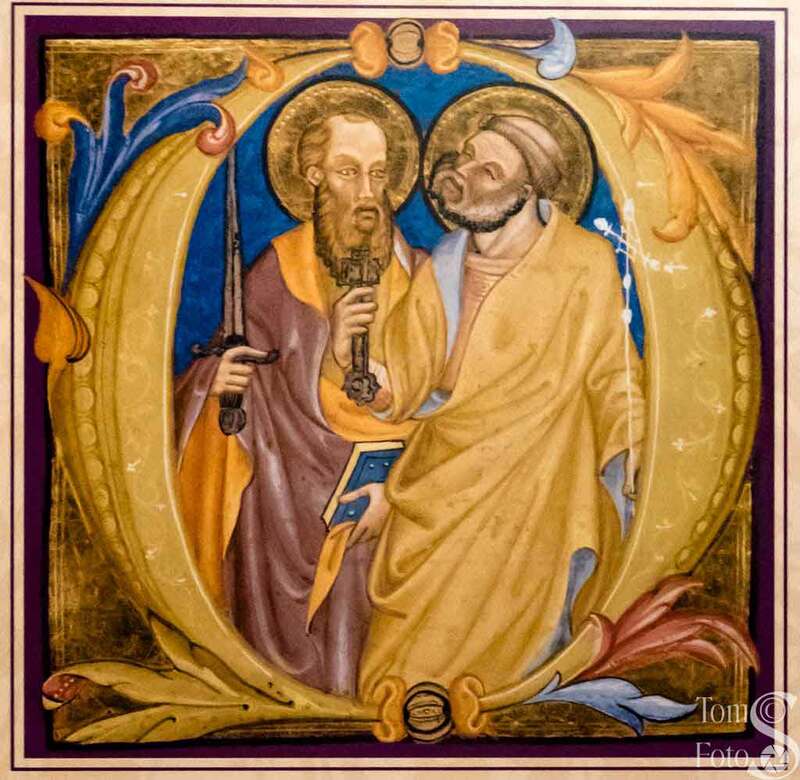 This shows Saints Peter and Paul. Saints Peter and Paul are largely regarded as the pillars of the Church. Peter represents the local bishop’s ministry where Paul is seen as the traveling preacher who gathers others into the flock. This photo is from a reproduction of an Illuminated Manuscript showing the two and ends this presentation of the first gallery. The conversion of Roman Emperor Constantine marked the start of Christians being seen in a much different light. He moved the capital of the empire to Constantinople and Rome became a Christian city. 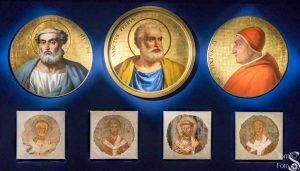 Christian culture thrived under the patronage of popes. 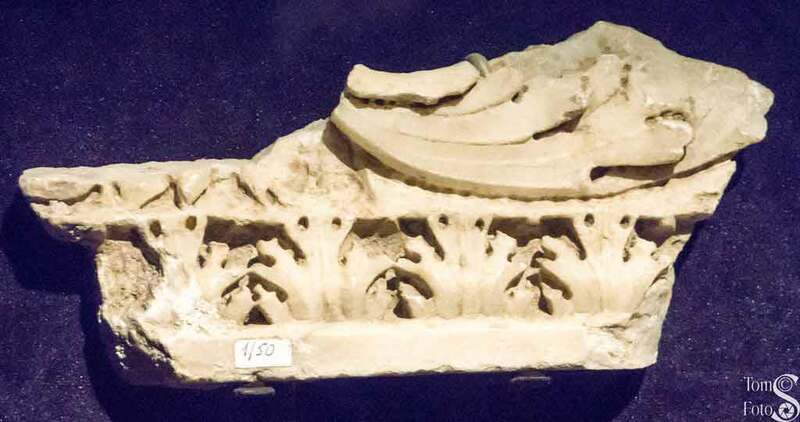 Roman sarcophagi had flat lids with images of the dead; this lid, showing the Adoration of the Magi, is a cast of a lid used in the 4th century and re-used for burial of Pius VI. 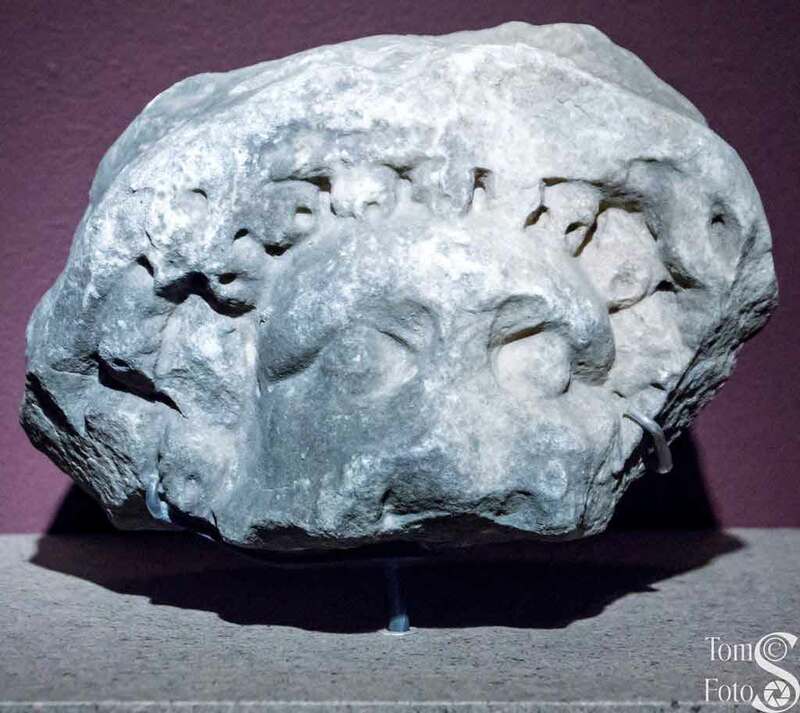 This marble carved image of a male head was found under the Vatican Basilica floor. It dates from the 3rd century. Interestingly, Paul never met Jesus personally but was one of His strongest evangelists. Legend has it Paul was beheaded on order of Emperor Nero. A Basilica sits on the spot where Paul was buried. This is a brick from that tomb; terracotta dating from the 2nd century. 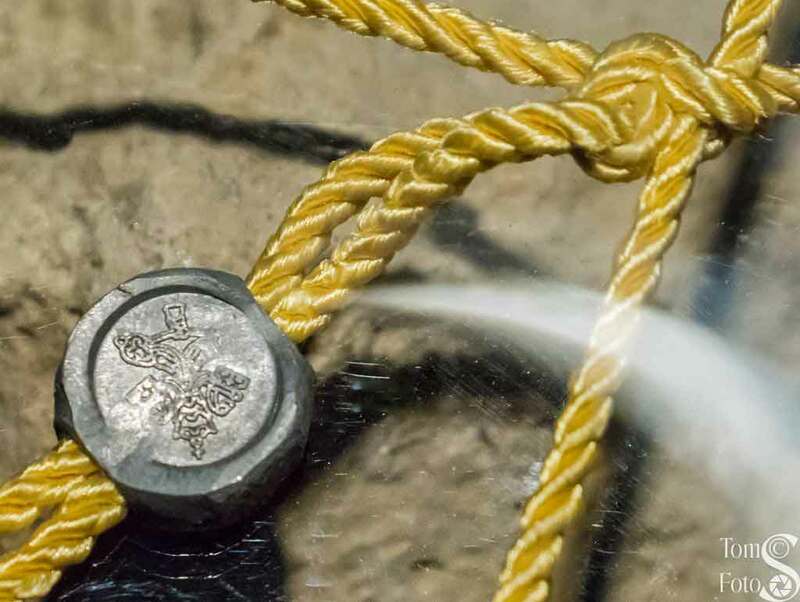 While visiting the exhibit the docent asked if I could tell what was on the lead seal on the cord; the picture on the right shows the Vatican seal used on the lead. Constantine had a Basilica built over the site of Saint Peter’s tomb. It was judged needing be replaced in the 1600s. 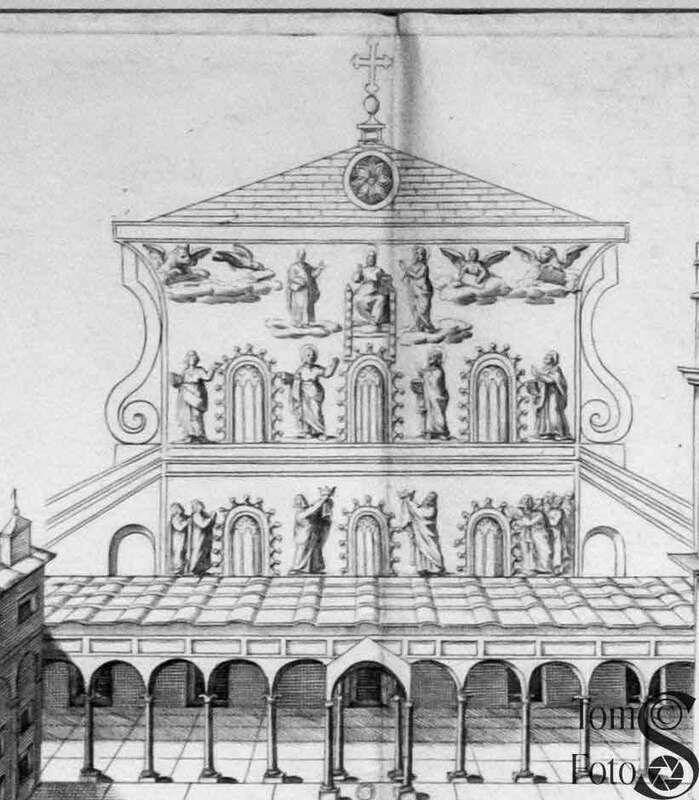 The etching (print on paper) dates from 1684 and shows the atrium of the old Basilica just before it was destroyed. To the right is a larger detail of the 24 elders of the Apocalypse (supposedly–I don’t count that many), the four evangelists (Matthew, Mark, Luke, and John) and at the top, Jesus flanked by the Virgin Mary and Saint Peter. 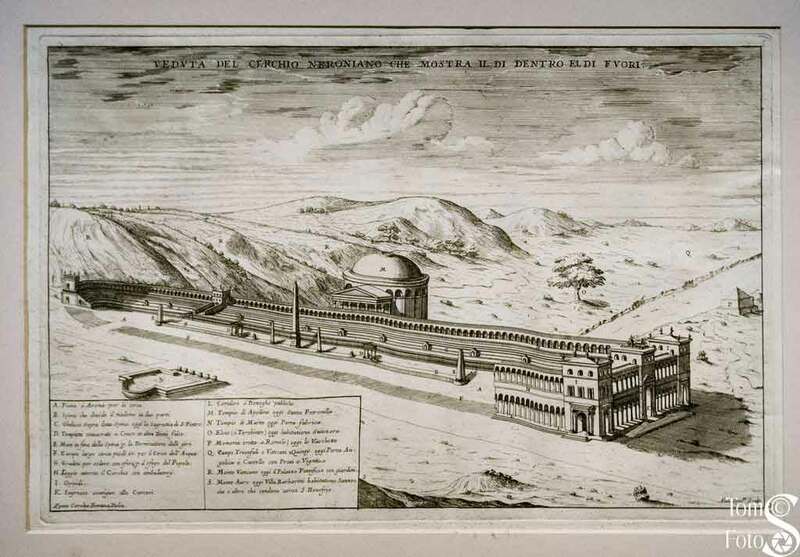 A different section of the Constantinian Basilica is shown in this etching by Carlo Fontana with engraving by Alessandro Specchi dating from 1694. It shows some of the embellishments made by different donors to the Basilica. A Florentine sculptor and architect, Filarete, designed and cast huge doors for the old Basilica between 1433 and 1445. The doors were removed before the old Basilica was demolished and were re-installed on the Renaissance Basilica after it was finished. The photo here is of a cast of the right lower panel of the doors. 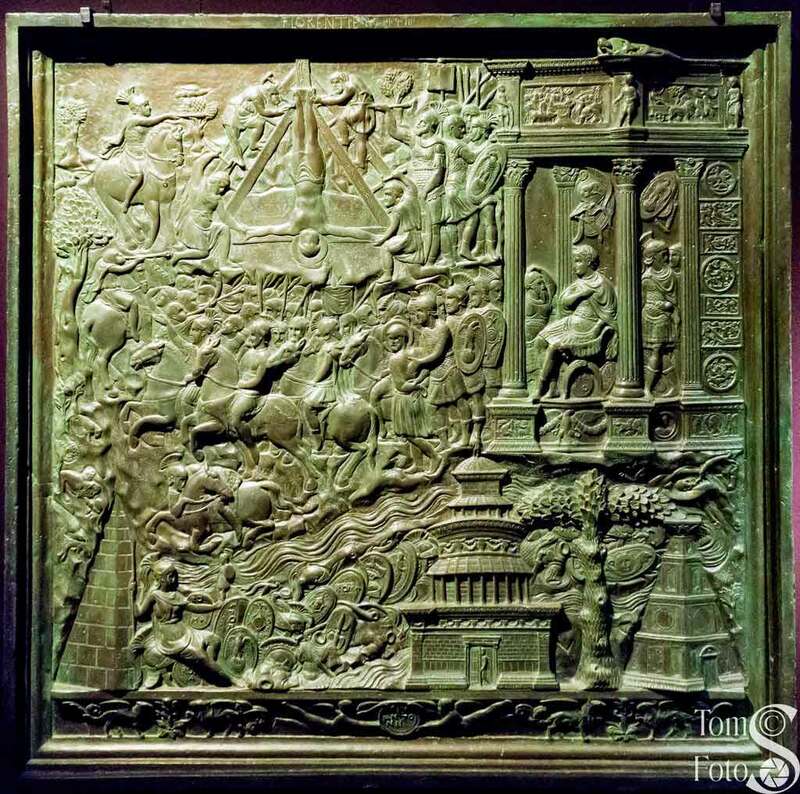 It includes homage to Saint Peter’s martyrdom but, interestingly, also includes some mythological figures (e.g., horse with wings in the lower right). 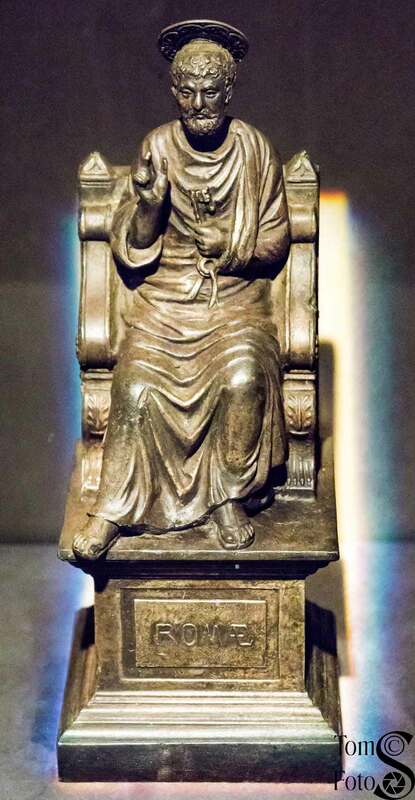 Finally, in this gallery, we see a figurine which is a model of the bronze statue of Saint Peter by Arnolfo di Cambrio standing in the central nave of the Basilica of Saint Peter in Rome today. 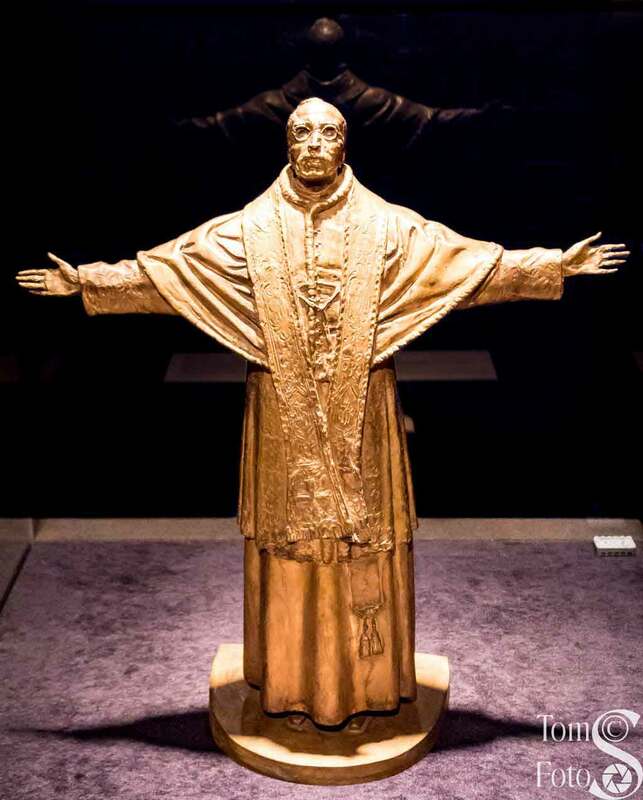 The statue represents the institution of the papacy and the unbroken succession of popes dating back to Saint Peter. 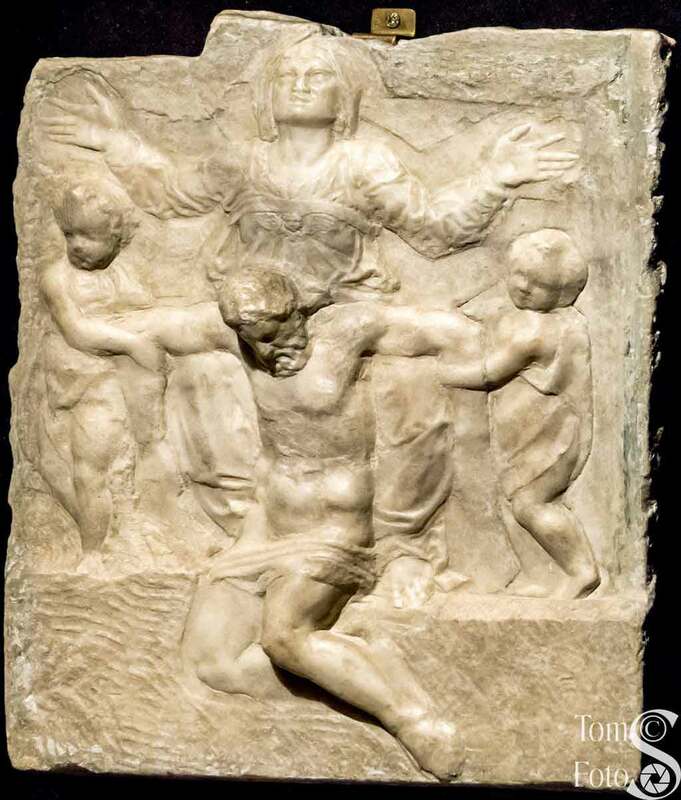 In this gallery we see the evolution of Christian art, influenced by Rome. Also, the Basilica built by Constantine has now fallen into a state of disrepair and must be replaced. You enter through simulated church doors. The Vatican was humid and swarmed with mosquitoes due to its low location so the popes went to higher ground at the Basilica of Saint Mary Major and the nearby Quirinal Palace. 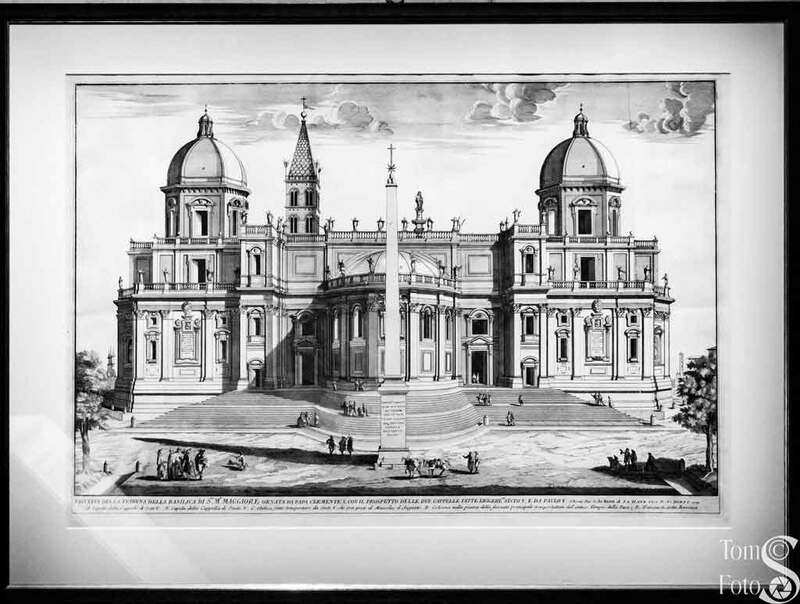 This 1724 print shows the front of Saint Mary Major Basilica. All of the churches needed constant maintenance. 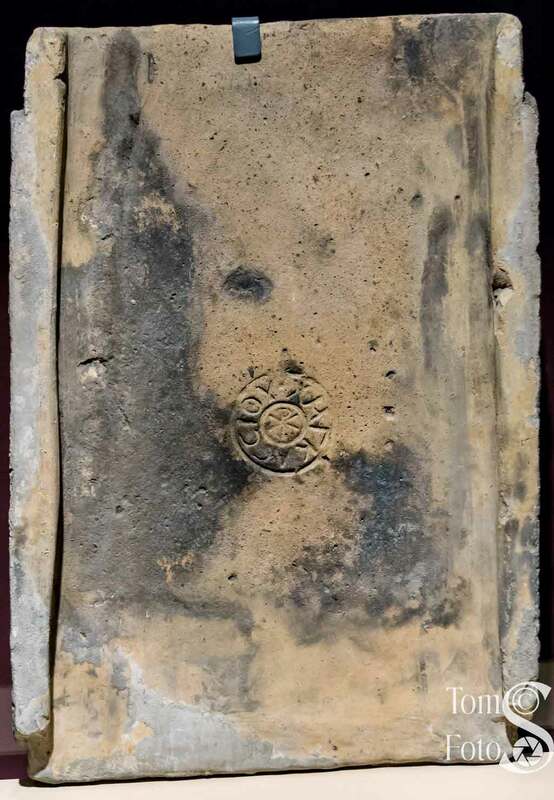 On exhibit is a roof tile from the Saint Mary Major Basilica which dates between 493 and 526. Each tile had a stamp telling where it was made. 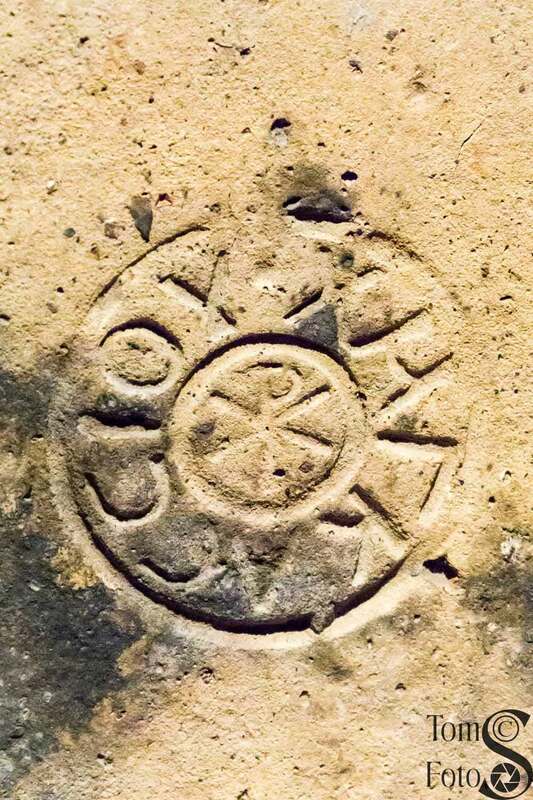 On the right you can see this one was from the Cassio Brickworks and in the center you see the Chi-Rho symbol for Christ. 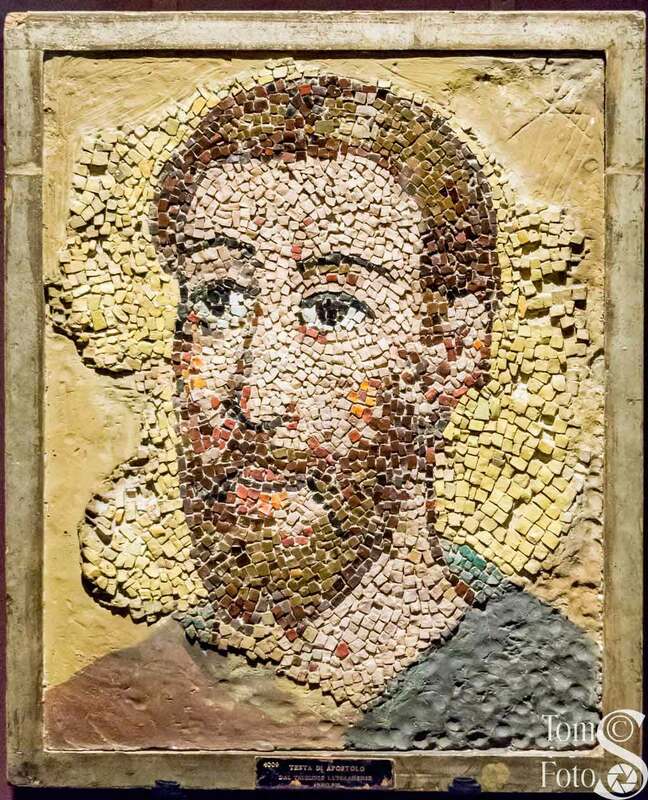 This is a fragment of a mosaic showing Saint Paul made about 799 and restored in 1625. It decorated the apse in the state banquet hall of the Lateran Palace which was used as an official papal residence up to the 14th century. 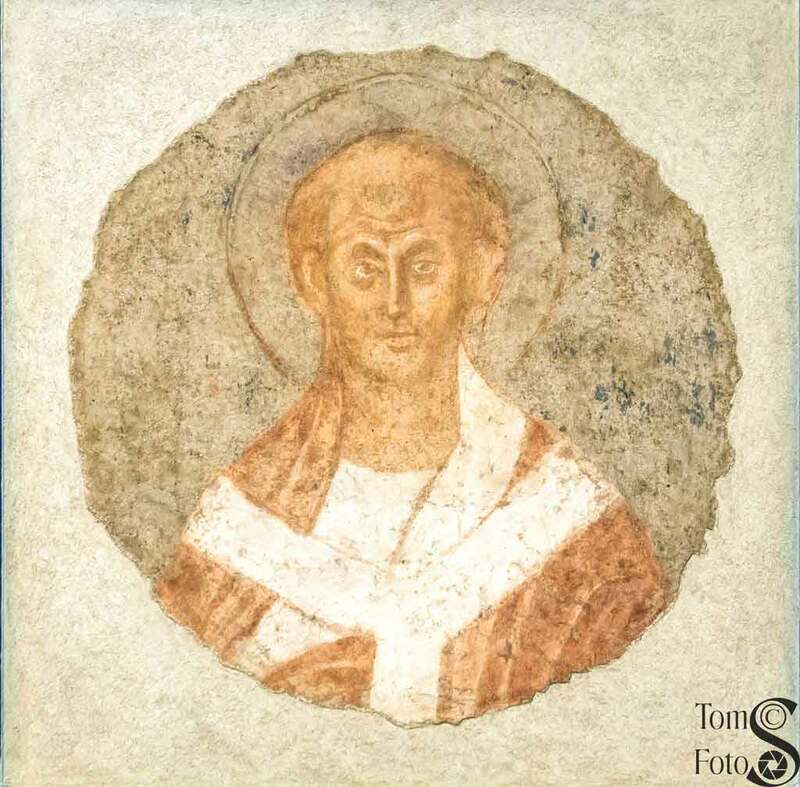 This display is a copy of an 8th century mosaic from the Oratory (small chapel) of Pope John VII. It’s part of a larger mosaic the illustrates the Nativity and shows a woman washing the baby Jesus. This is a plaster cast of a marble statue kept in the Vatican grottoes. It started as a statue of an unknown philosopher. Its head was later replaced by Peter’s and iconic keys added. 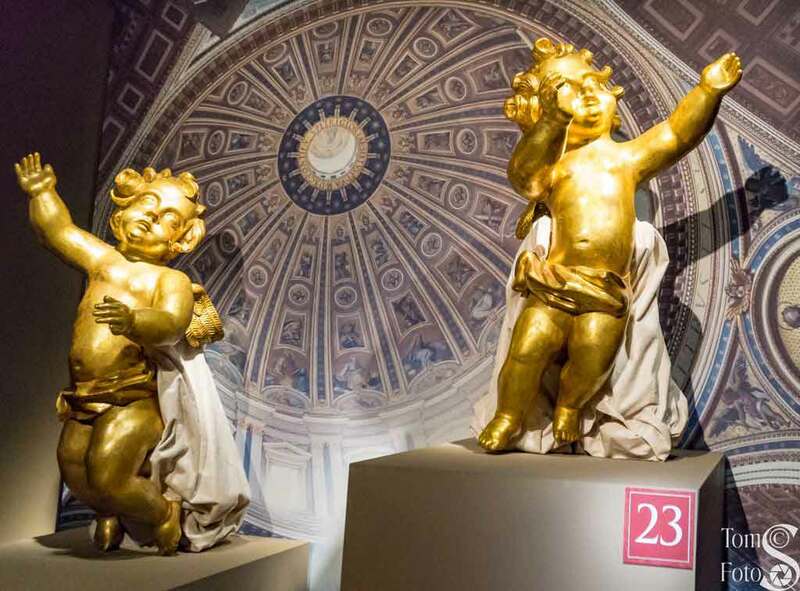 Two resin and marble powder casts from reliefs from the Ciborium (a canopy over an altar in a church, standing on four pillars) of Pope Sixtus IV are a highlight of this gallery. They represent the martyrdom of Saints Paul (above) and Peter (below). The originals date from the 15th century; the casts were made in 2002. Saint Paul is shown above being arrested (left side of the relief), tried and sentenced by Nero (right side) and about to be beheaded (center of the relief). Below we see the martyrdom of Saint Peter; crucified upside down. Witnesses are to each side. This act was said to have taken place in Nero’s Circus. 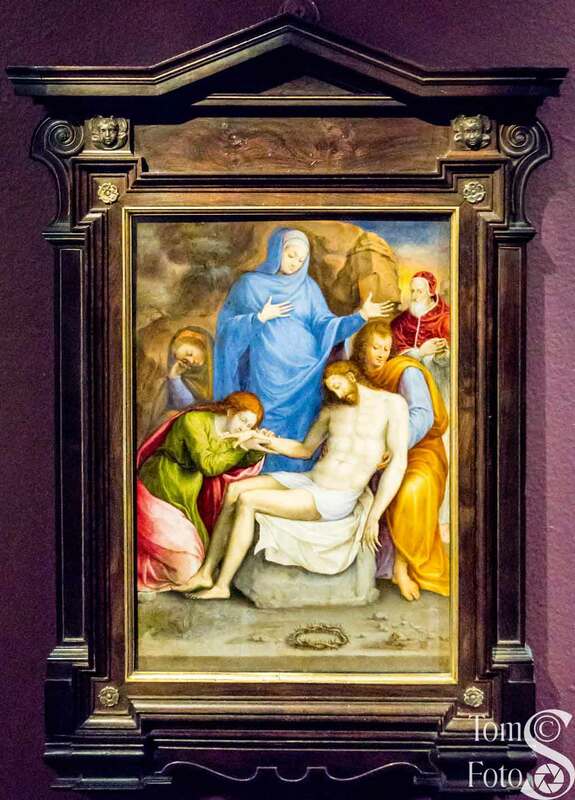 The Deposition in the Sepulcher (Christ being laid in the tomb) is oil on copper and dates from the 16th century. The artist was Giorgio Vasari better known for The Lives of the Artists, an encyclopedia of art in the Italian Renaissance. Note in the upper right that, common to the time, Vasari inserted the representation of a pope. Many works representing the Madonna are modeled on Raphael’s Madonna della seggiola. The Madonna of the Chair here is one of those. 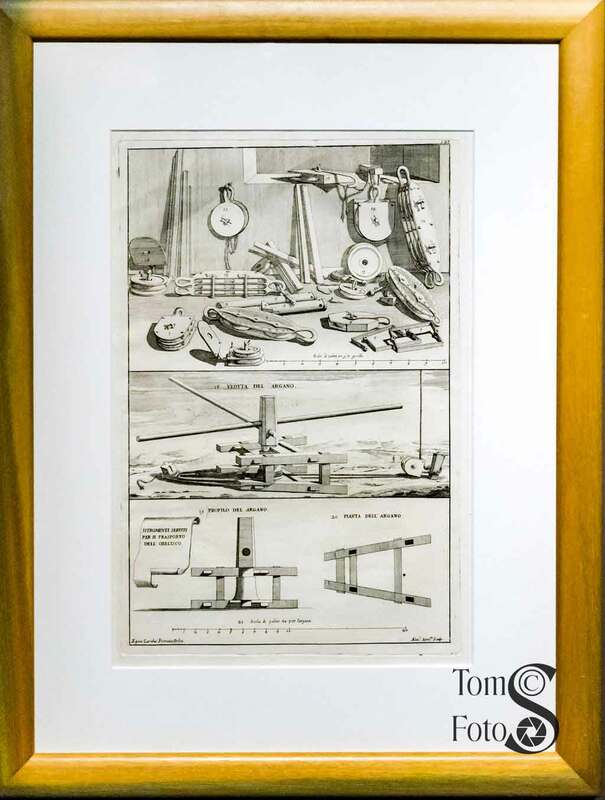 Circa 1800-1804 this etching on paper was created by James Anthony Minardi. 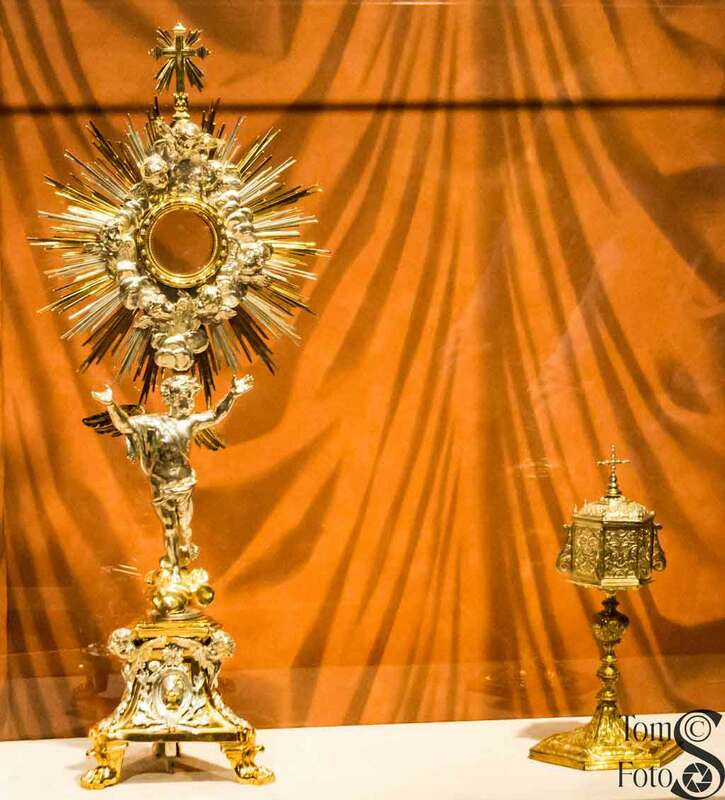 Another highlight of this gallery is a reliquary in the form of a monstrance. 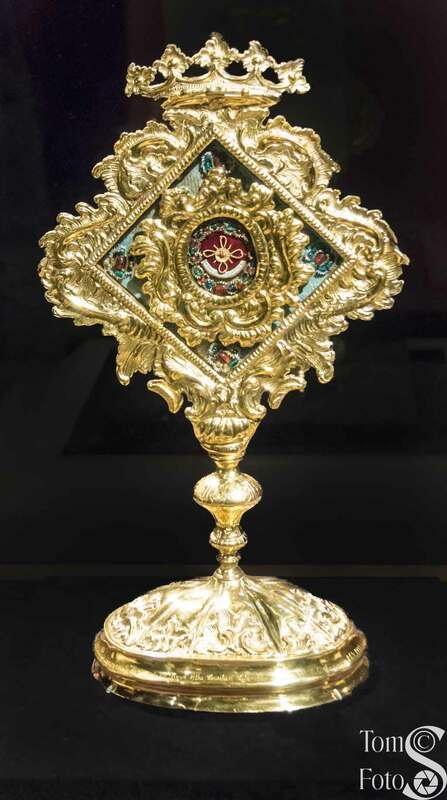 A monstrance normally holds the consecrated Host however this one holds a relic from Polish Saint Hyacinth. 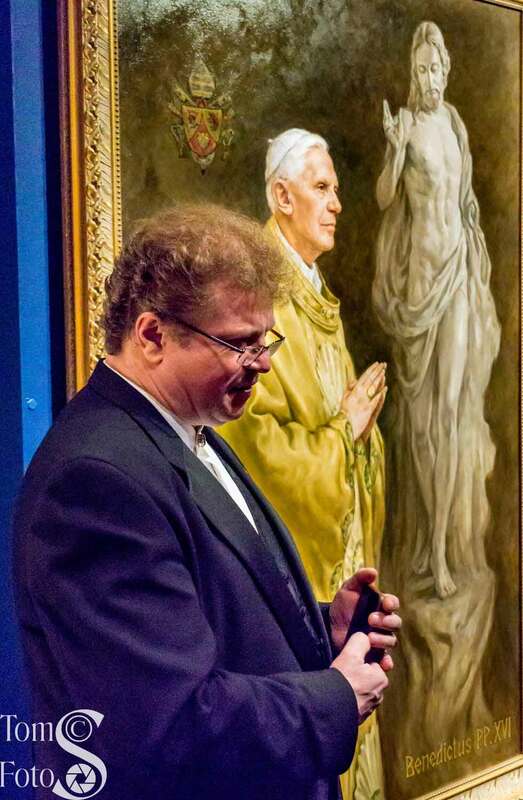 It was authenticated in 1969 by Saint John Paul II. The reliquary (on the left) has been edited to place it against a dark background. As placed, any photos have reflections and distracting backgrounds. 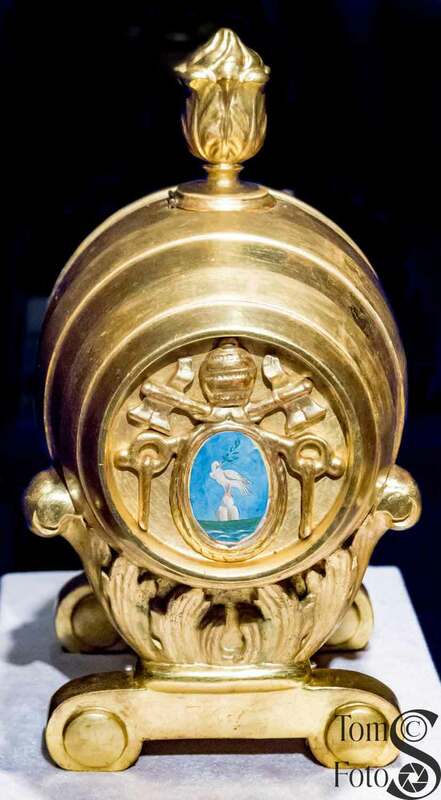 A close-up of the relic is to the right. Another reliquary is found on the back wall of the gallery. 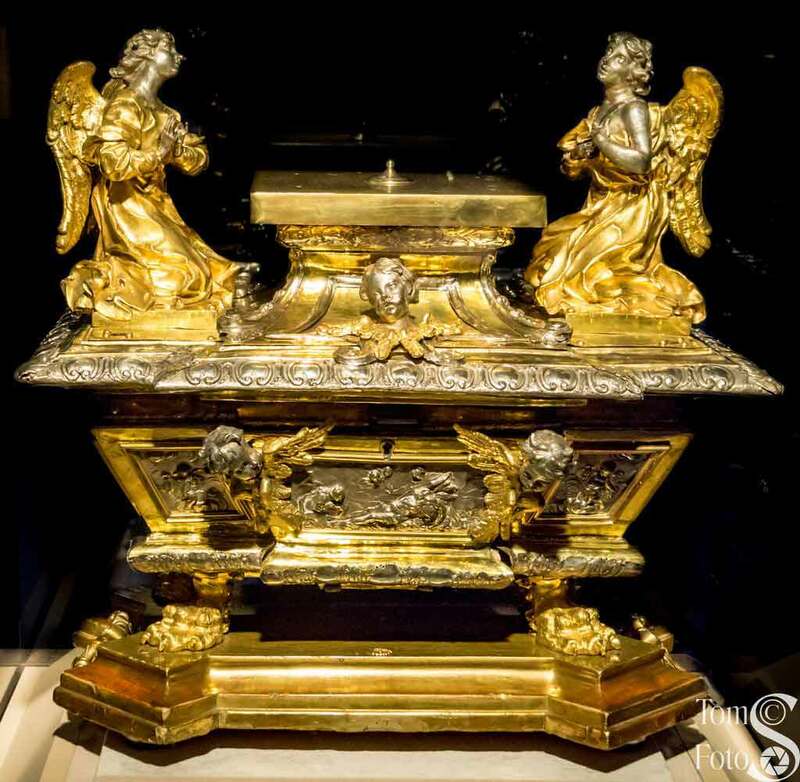 The bones in the reliquary from Saints Peter, Paul, and Theresa have been confirmed but the others have uncertain provenance. The final display in this gallery is a Renaissance tapestry. 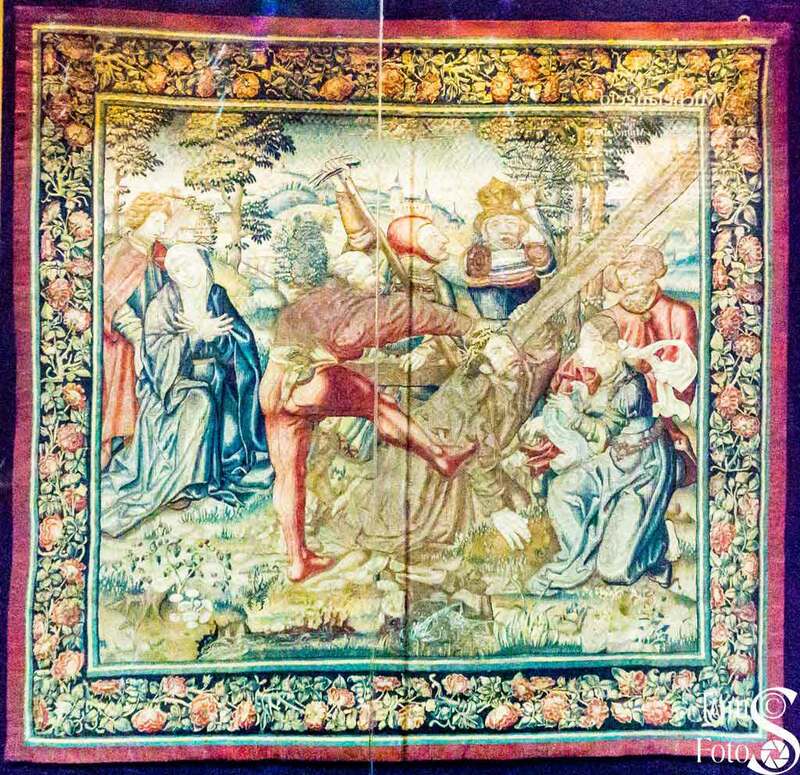 Called Ascending Mount Calvary, this tapestry was designed by Bernard van Orley during the 16th century and manufactured by Flamminga Bruxelles circa 1520-1530. It is made of wool, silk, and silver gilt. Pope Julius II commissioned Michelangelo to work for the Vatican in 1508. The relationship between the Pope and Michelangelo was fiery but resulted in some of the finest art of the time. 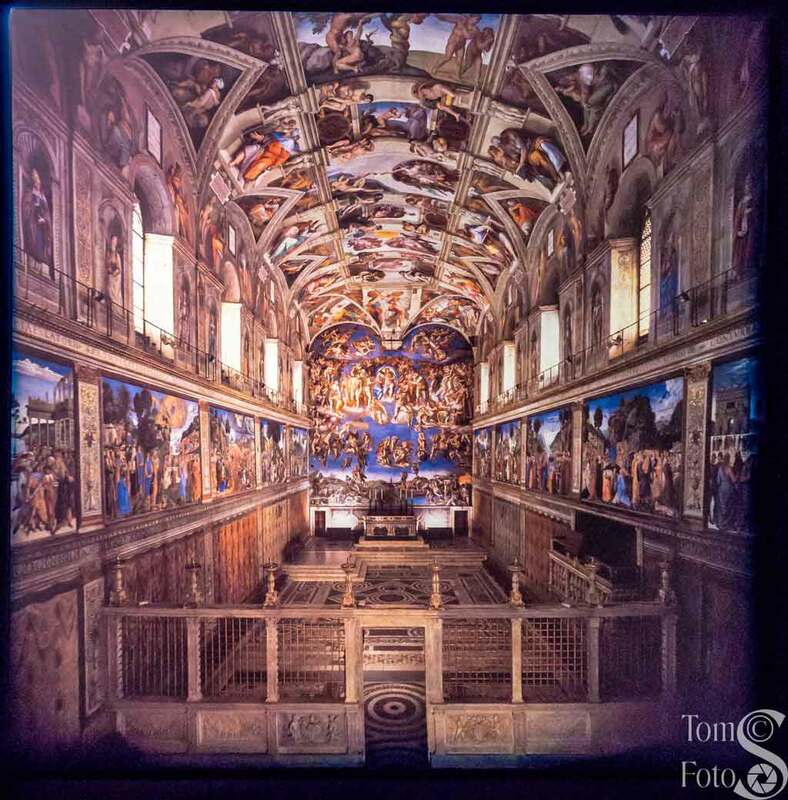 Michelangelo was a sculptor but the Pope commissioned him to do frescos on the ceiling of the Sistine Chapel. That meant he had to design scaffolding and be on his back some 60 feet above the floor for hours at a time over a four year period. The exhibit shows what this workspace might have looked like. 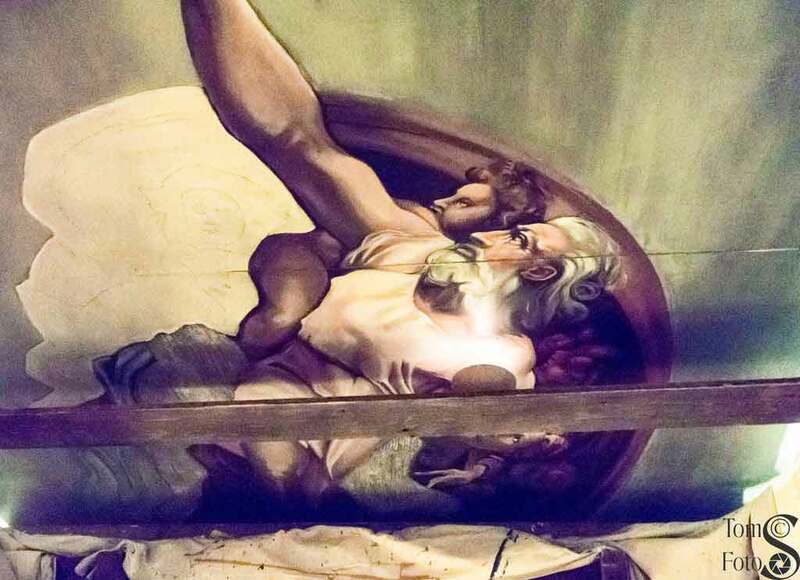 Over time work on the Sistine Chapel has continued. In 1979 these playing card fragments were found mixed in with mortar covering a hole. 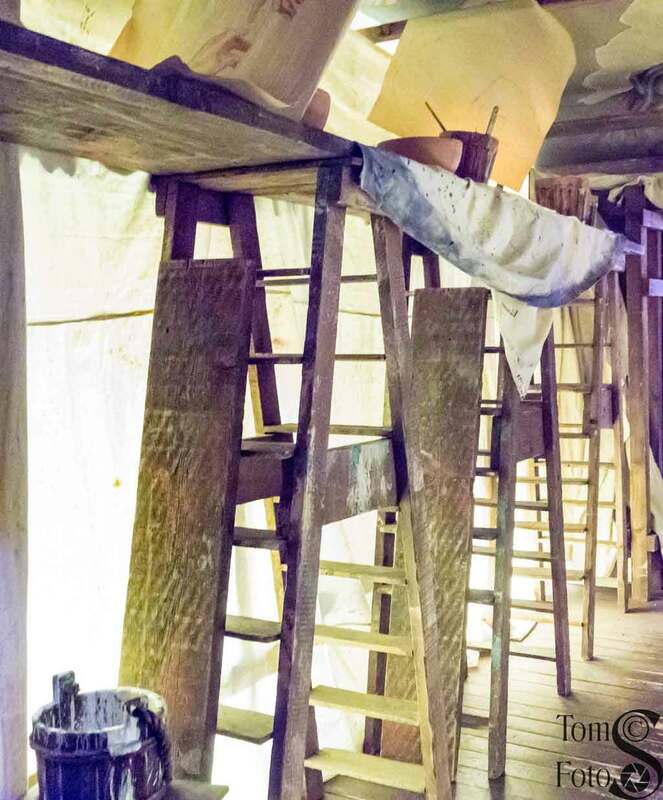 It was later shown they date from repairs in the 1710-1712 time period and were probably used by workers of that time. As repairs were made metal clamps and fasteners had to be used to stabilize the frescos. The nail, for example, dates to a 1570 renovation. Now, lime and fixing agents are injected into the frescos to bind the layers together. A bronze medal of Pope Julius II was buried 18 April 1506 by the foundation stone of the new basilica. This symbolized his being the primary person responsible for ordering the construction. The basilica was finally consecrated in 1626; 120 years later. Displays at the start of this gallery show etchings from a 1694 document. 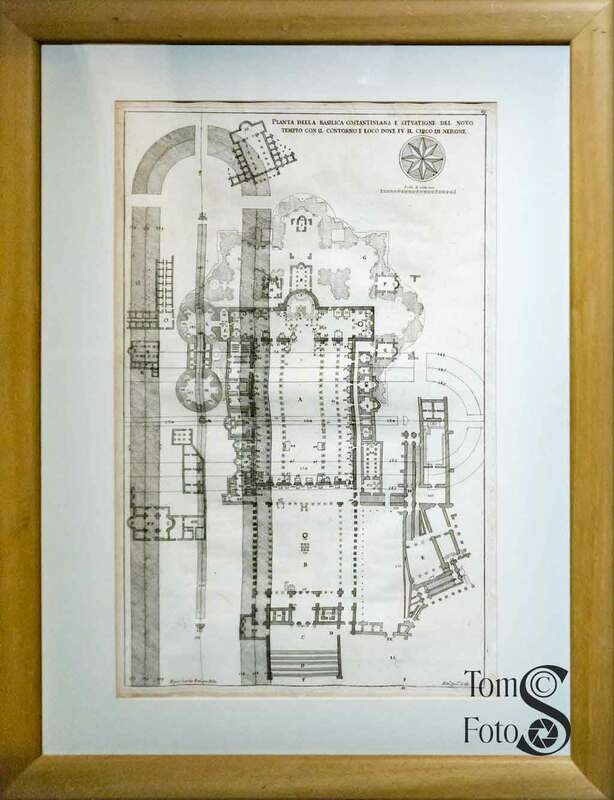 The plan of the Constantinian Basilica with an overlay showing its location relative to Nero’s Circus is shown to the left here. 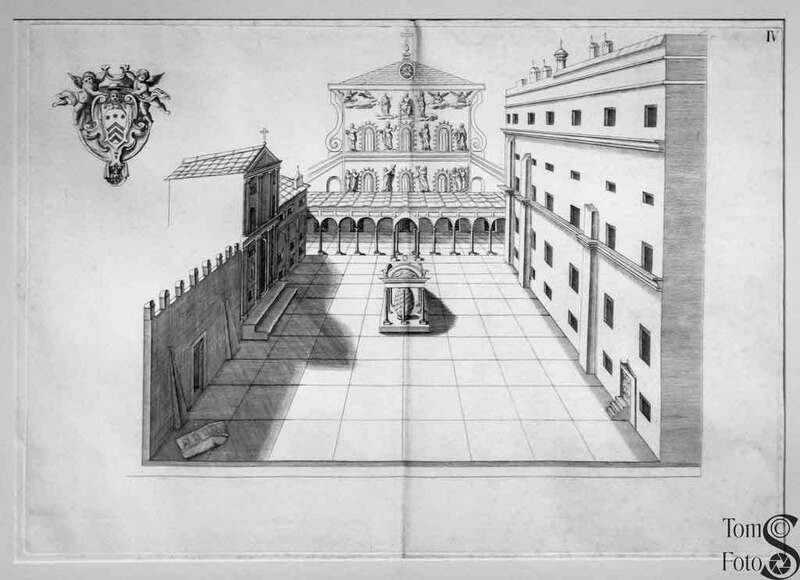 On the right you see an etching from the same work showing the side of the Old Basilica and part of the new one. 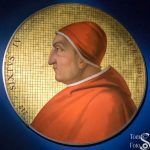 Pope Clement VII, in 1523, charged 60 experts with the task of overseeing the construction and administration of the basilica. They are known as the Reverenda Fabbrica di San Pietro and continue today. Their coat of arms is shown here. 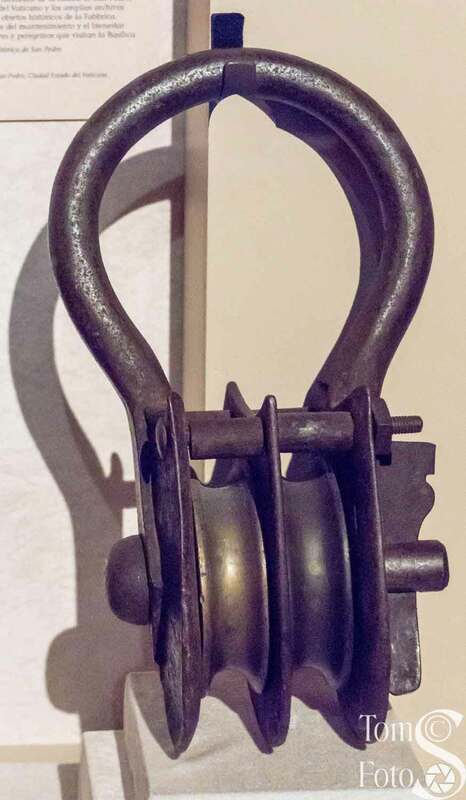 A 19th-century pulley and shackle still used for maintenance are shown here. A display along one wall shows a number of documents and papal seals; all relating to the construction of the basilica under several different architects of the basilica. 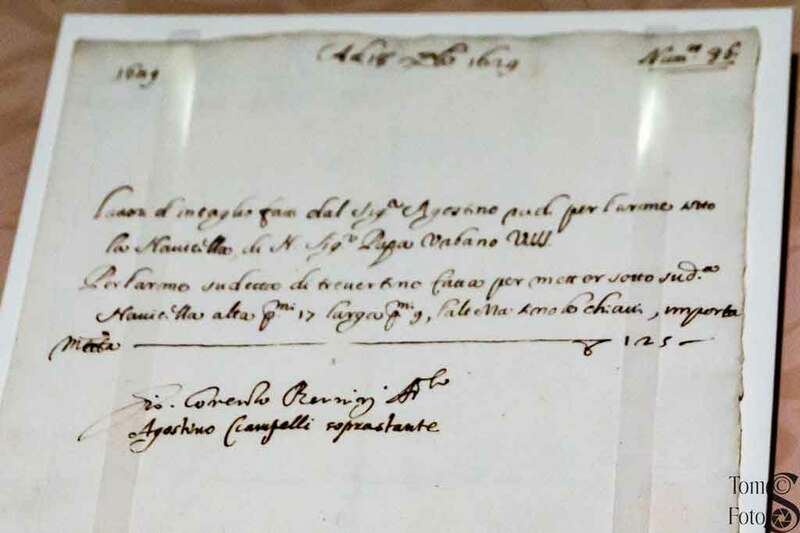 To the left is a document signed by Michelangelo and to the right a bill of payment signed by Giacomo della Porta; both architects of the basilica at different times. 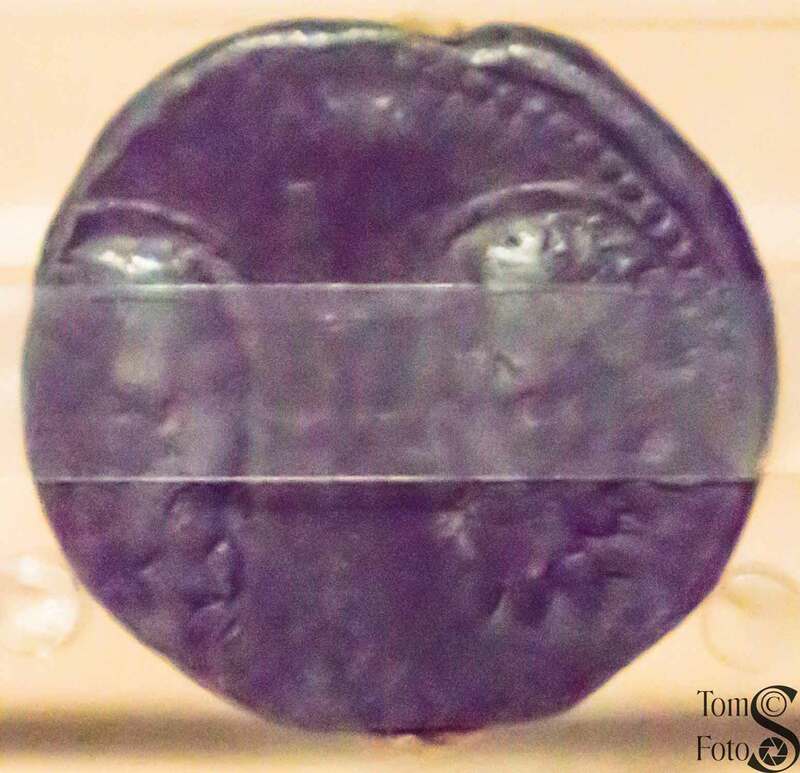 Shown here is the seal of Pope Sixtus V. In general, this sort of lead seal with images of Saints Peter and Paul on the front and (not shown) a cross and name of the pope on the back is called a “papal bull.” It is used to authenticate documents from a pope. 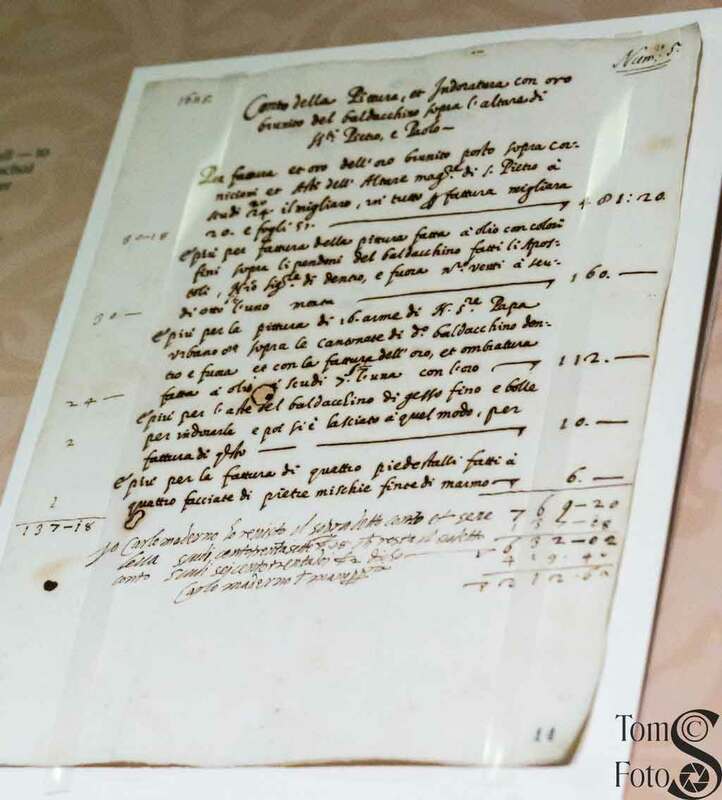 Another pair of documents on display include one signed by Carlo Maderno appointed architect of the basilica by Paul V in 1607. 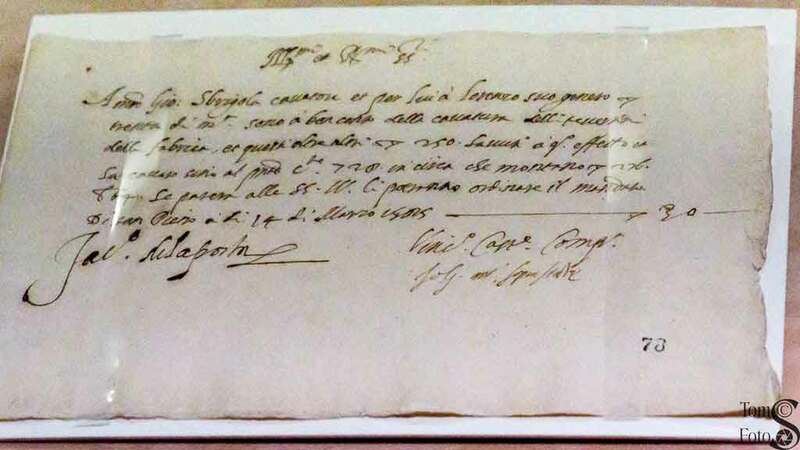 To the right is a payment of 125 scudos dated 18 December 1629 and signed by Gian Lorenzo Bernini. 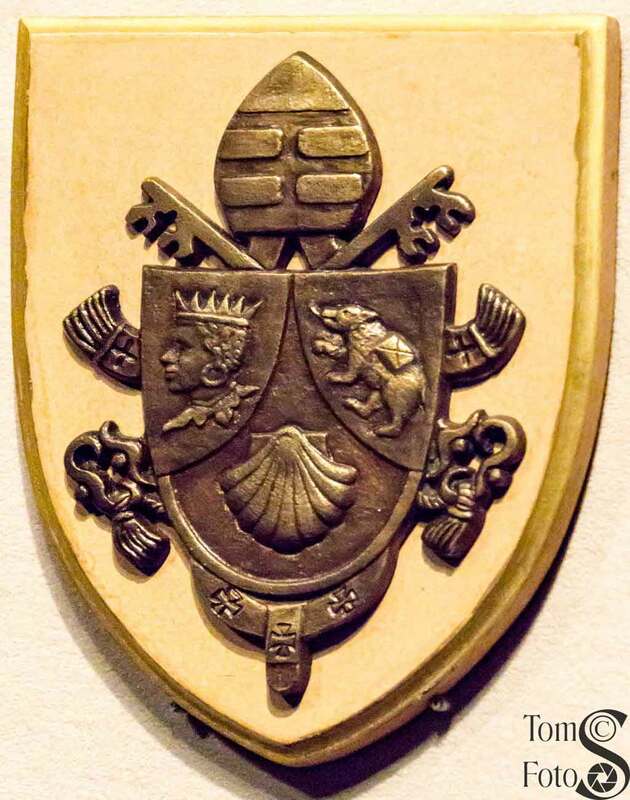 Finally, the seal of Pope Alexander VII is shown. He collaborated with Bernini for the colonnades and plaza of Saint Peter’s Square. Pope Paul III appointed Michelangelo architect of the basilica in 1547. He planned for a large hemispherical dome; the largest ever attempted. He lived only to see the completion of the drum; the section that would support the dome. 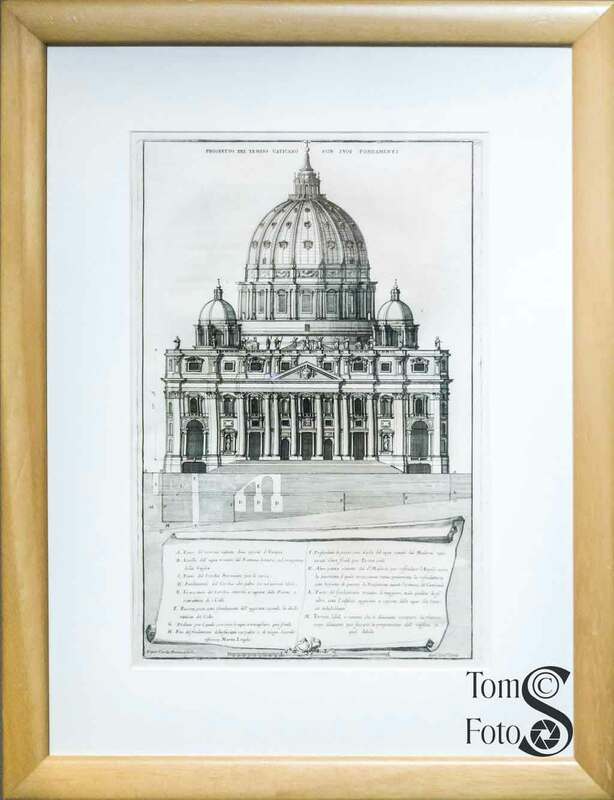 This etching, dating from 1694, shows the completed dome and its foundation. 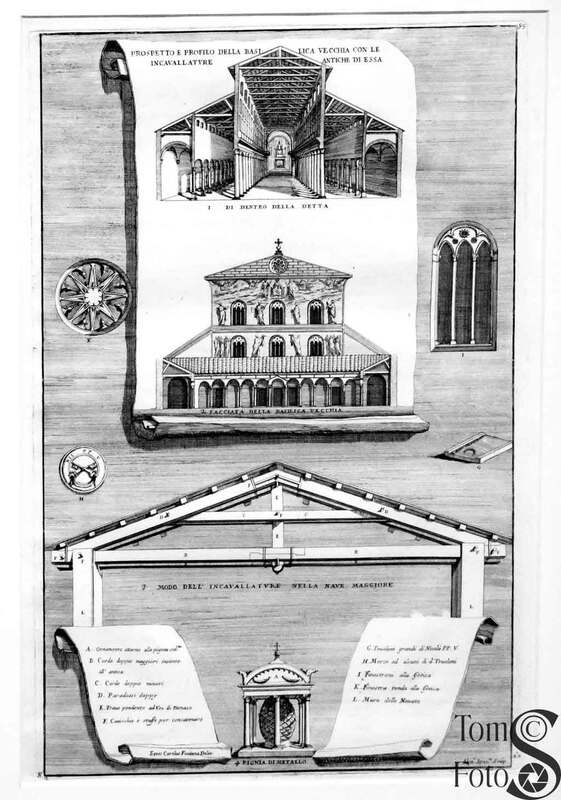 Additional etchings from the same source show some of the tools used in the construction of the basilica. Of particular interest is the moving of the obelisk that stood in Nero’s Circus. 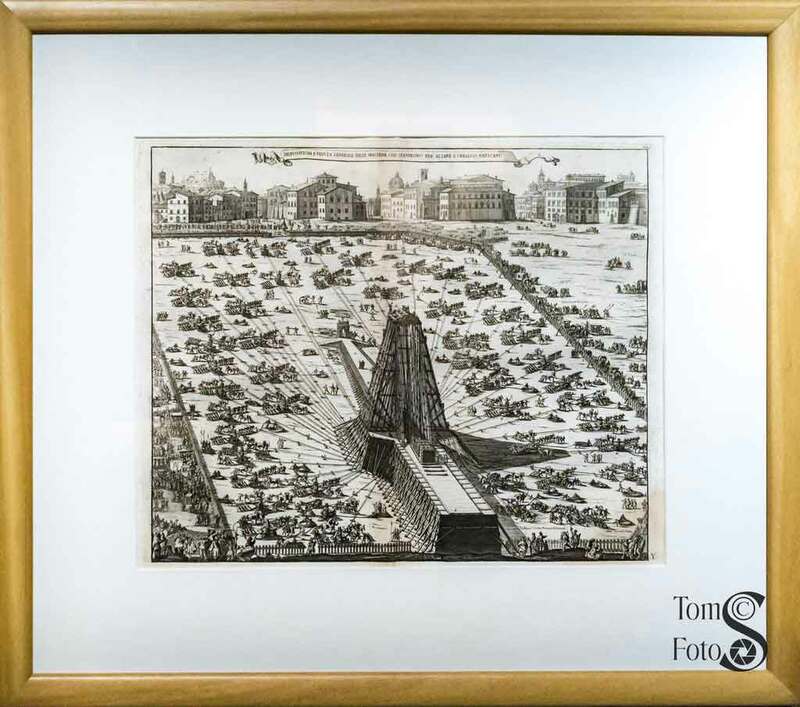 When the Circus was demolished the obelisk was saved and then moved to Saint Peter’s Square. The etching to the right shows how this was done. That obelisk still stands in Saint Peter’s Square today. 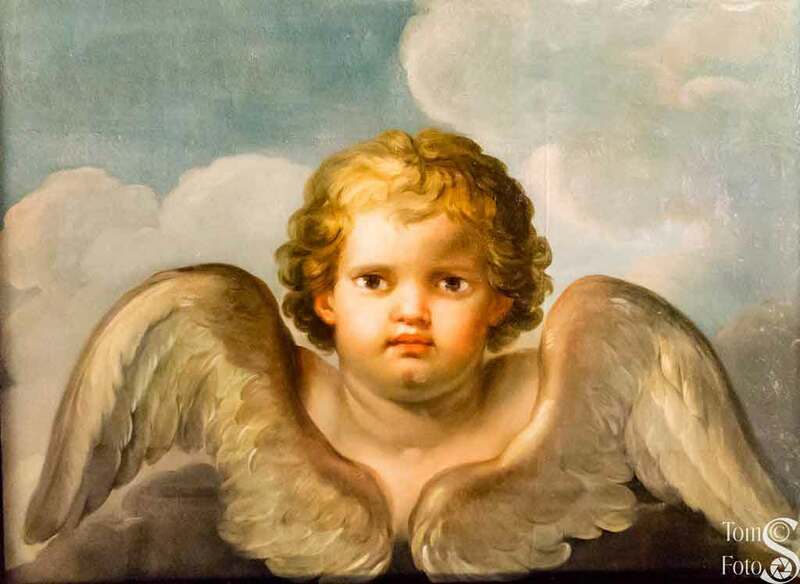 Two angels are on display in this gallery. They are quite large and described as “cartoons.” In 1742 Giacomo Zoboli made these images. In this case, the term cartoon for these paintings means a full-sized painting that is used as a model for a mosaic. These angels are now mosaics decorating the dome of the Madonna della Colonna chapel; one of four smaller domes surrounding the large done of Saint Peter’s. The artist Gian Lorenzo Bernini was involved in later parts of the basilica construction. 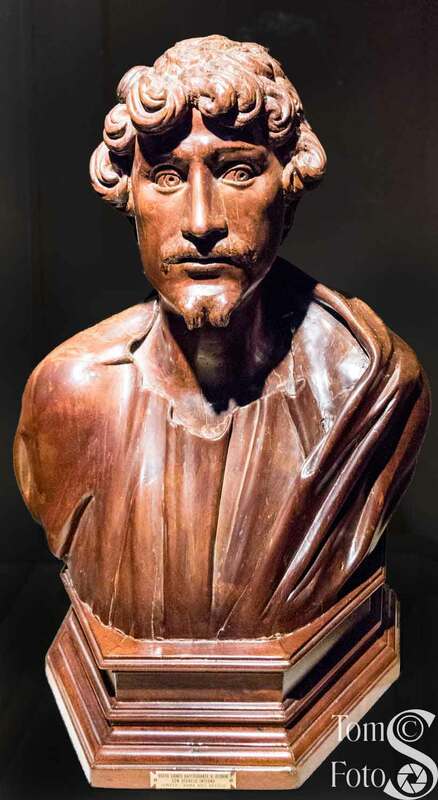 Shown is a wood bust of Bernini by an unknown artist and dating from the 18th or 19th century. In the back of the sculpture is a chamber where objects and papers could be hidden. On the right you can see the cut in the wood that outlines the door and the two small hinges that attach the door to the sculpture. Bernini’s workshop produced many models and artifacts. 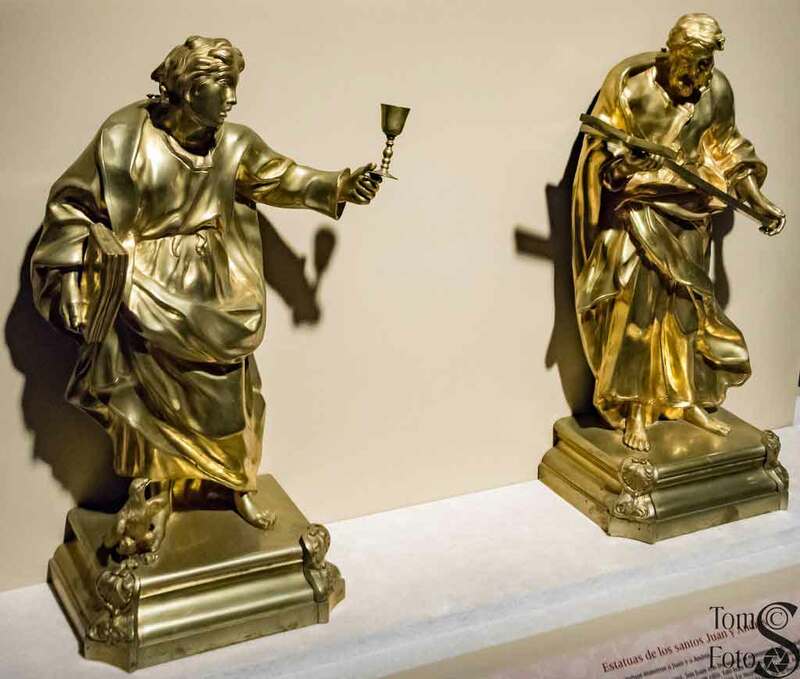 Two angels and a bronze candlestick are shown in the gallery. 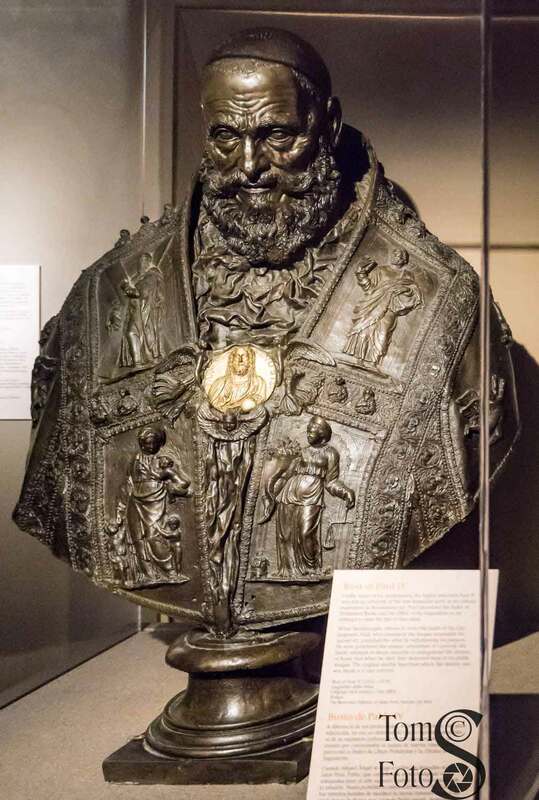 The gallery ends on a somewhat down note with a bust of Pope Paul IV. Pope Paul did not advocate the cultural expression of the humanist spirit of Renaissance art. Indeed, when Michelangelo refused to cover the nudes in his Last Judgment, Paul retaliated by withdrawing his pension. Paul is also responsible for the Index of Prohibited Books and the Office of the Inquisition. When he passed away, the public destroyed most of his public images. 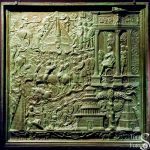 What we see here is a bronze cast made in 2005 from the original marble sculpture made in the 16th century. I was caught by the highly polished breast plate. 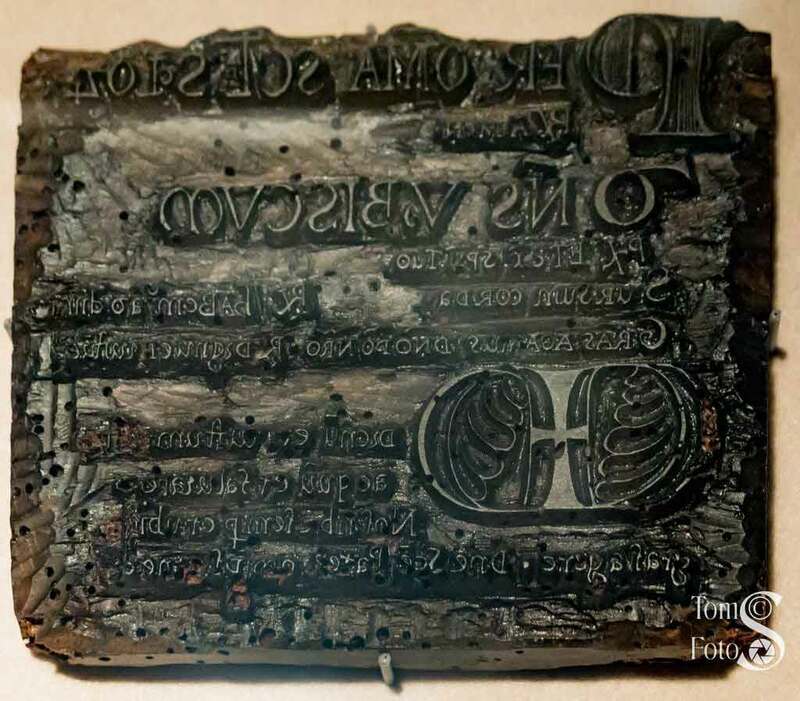 1511 saw a penniless German friar named Martin Luther visiting Rome and, seeing the new Basilica construction partially funded by the selling of indulgences, writing incendiary materials that spread fast and started the Protestant Reformation. In response Pope Paul III convened a meeting in Trent, Italy to determine Church doctrine and practice. 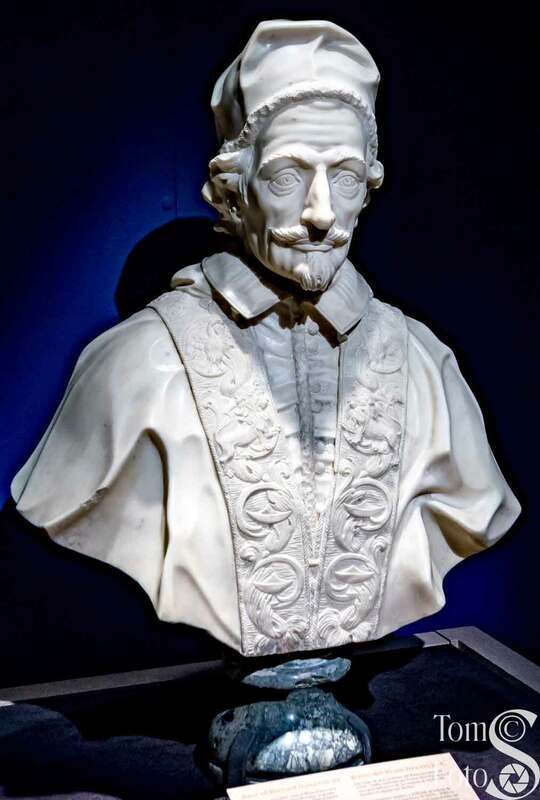 The Council of Trent met from 1545 to 1563 and established guidelines for art which should serve the faith. Examples of art that fits these guidelines populate this gallery. The Announcement to the Shepherds. By a Roman follower of Peter Mulier, well-known as the Cavalier Tempesta in the last quarter of the 17th century. Oil on canvas. Virgin Mary with Infant Jesus between Saints Peter and Paul. The Madonna and Child is in the Byzantine tradition but the smaller halos and portraits as real people signal early Renaissance. The Nativity. 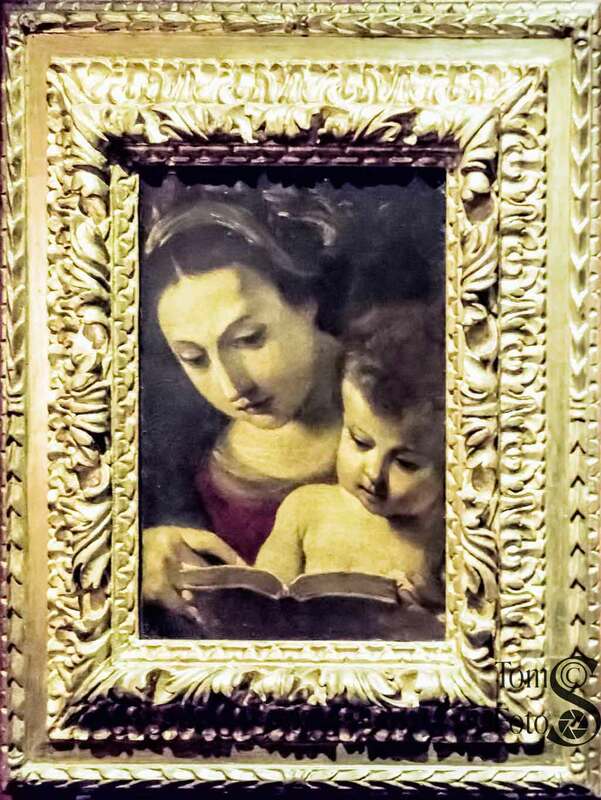 Oil on canvas in the style of painter Giovanni Lanfranco from the 17th century. 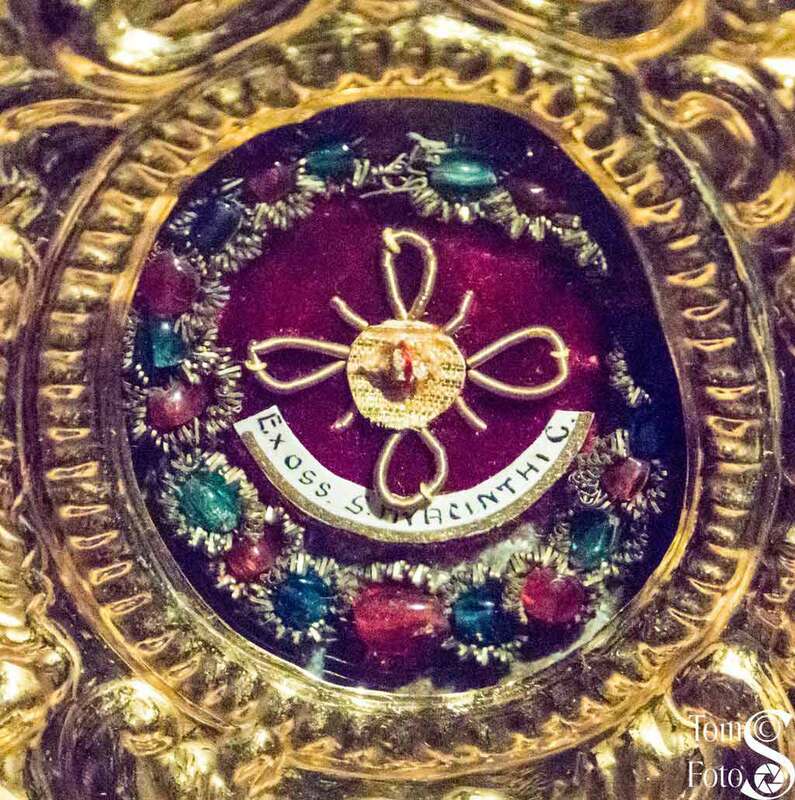 Cope of Saint Charles Borromeo. A cloak made from damask and yellow and pink brocade; usually worn in ceremonial processions. This cope was of Florentine manufacture in the second half of the 16th century. There is a tie-in here to the California missions. Saint Charles Borromeo is the patron saint of the Carmel Mission. Madonna with Child. 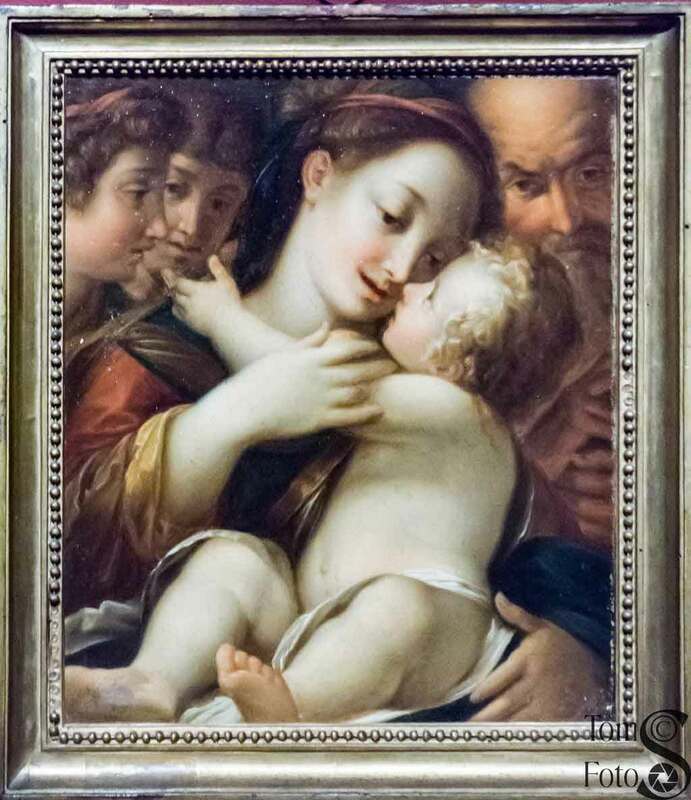 This piece is attributed to Francesco Maria Mazzola, also known as Parmigianino. It is from the 16th century and made with black chalk, brown ink, and watercolor on white paper. The Holy Family with Two Angels. This oil on canvas represents the Bolognese School. It is a late 16th century piece from Bologna, Italy. Madonna. This 17th century Madonna is an oil on canvas by the Italian artist Giovanni Battista Salvi, also known as Il Sassoferrato. He painted many such works to meet the demand created by the Counter-Reformation. 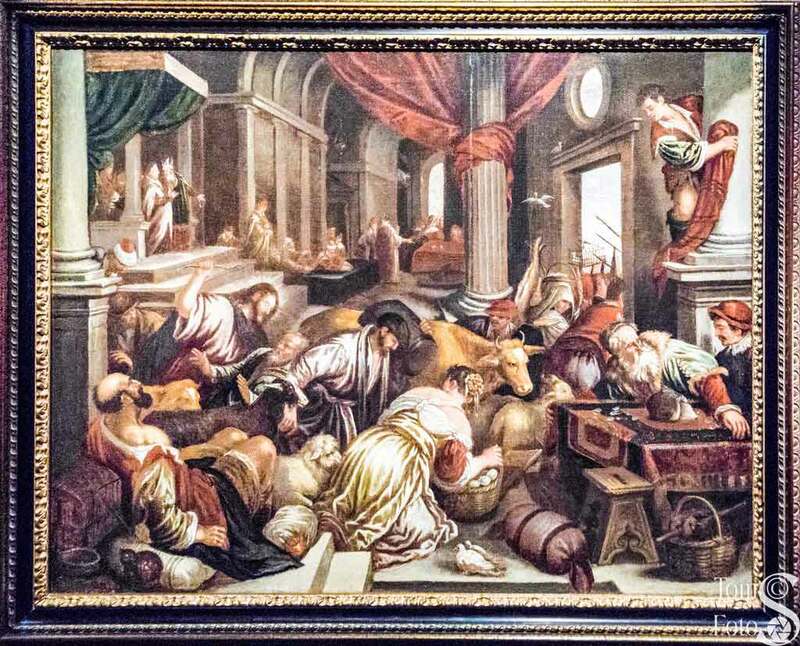 The Expulsion of the Merchants from the Temple. 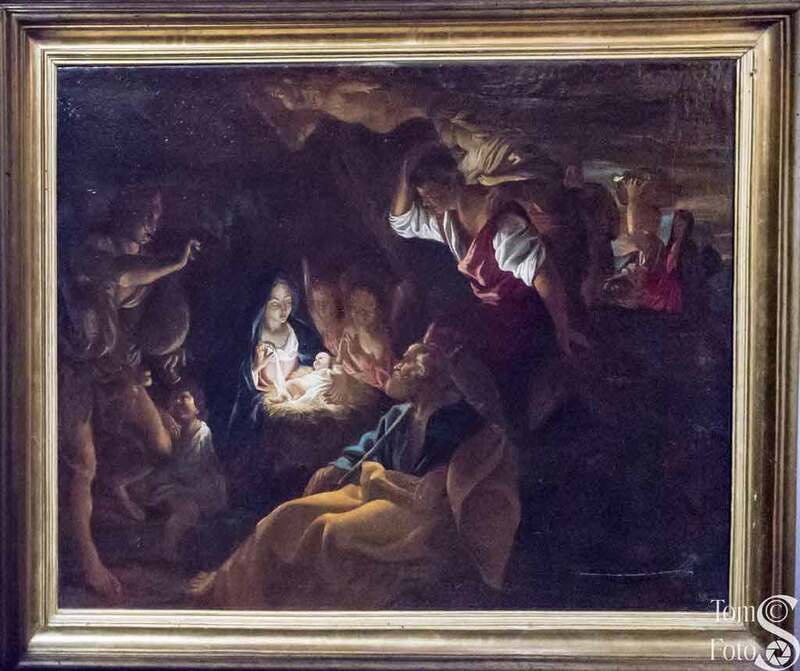 This oil on canvas is from the late 16th or 17th century and painted in the workshop of Francesco or Leandro Bassano. The Flagellation of Christ. In the 1570s and 1580s Pope Gregory XIII sponsored Girolamo Muziano who became a famous religions artist. 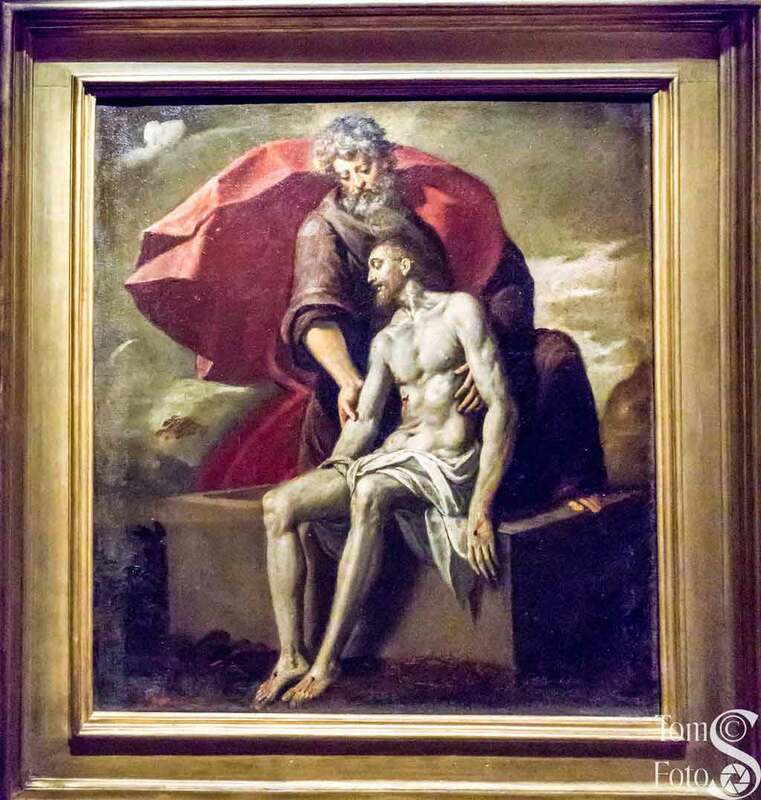 This oil on canvas is part of a cycle of paintings showing the passion of Christ. The cycle, in the sacristy of the canons in the Basilica of Saint Peter could be mediated on as a priest prepared for Mass. Portrait of a Prophet. 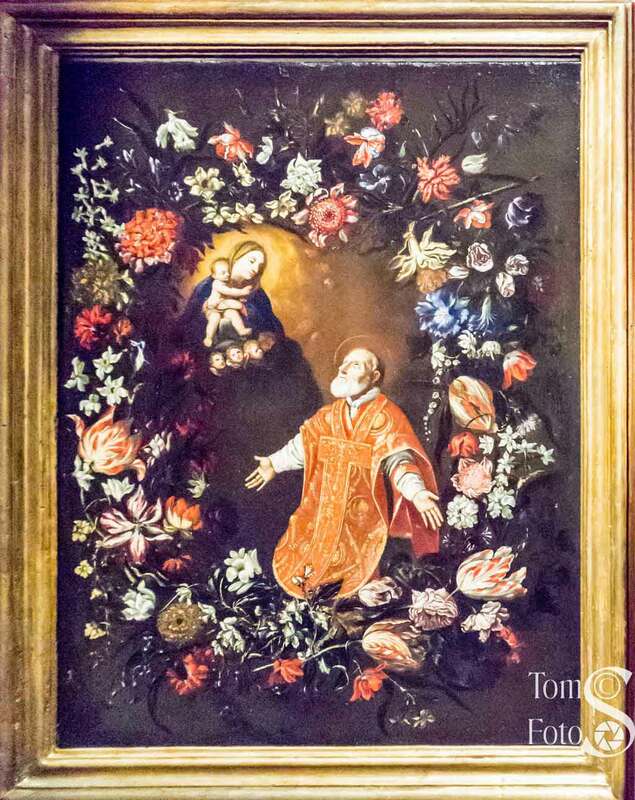 This 17th century oil on canvas hung in the Floreria, the papal wardrobe and storeroom established by Pope Boniface IX at the end of the 14th century. Peter Saved from the Water. This oil on canvas shows the Gospel episode were Jesus appeared walking on water and invited Peter to join Him. Jesus saves him when his faith wavers and starts to sink. It is from the school of Giuseppe Ghezzi circa 1715-1725. 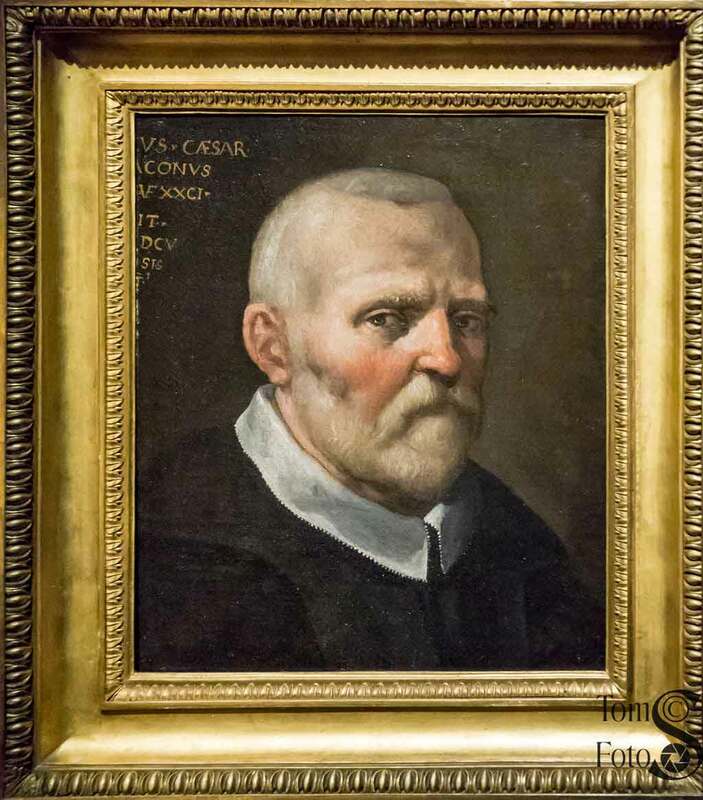 Portrait of Saint Philip Neri. 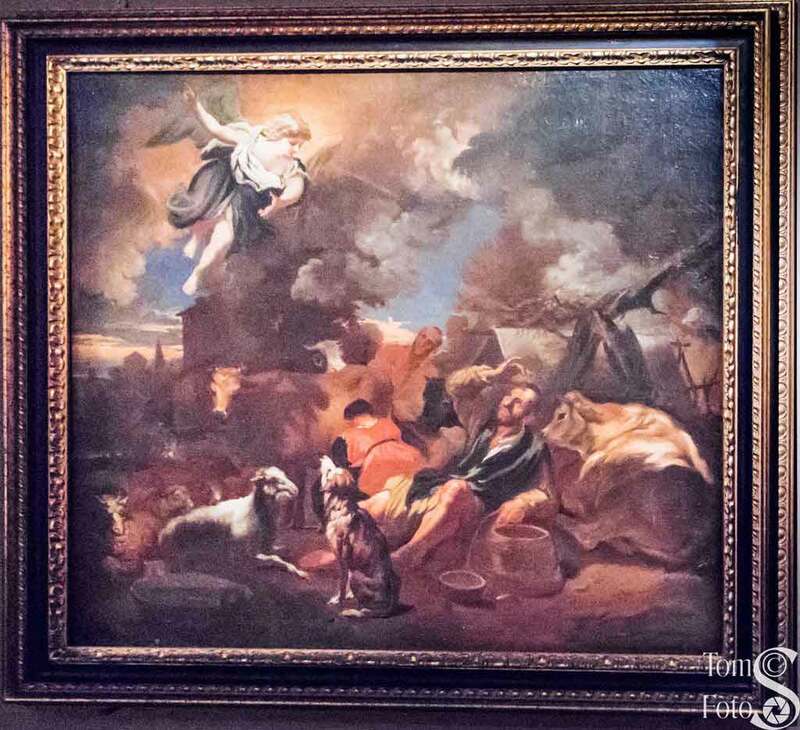 A Roman painter made this oil on canvas in the 17th century. 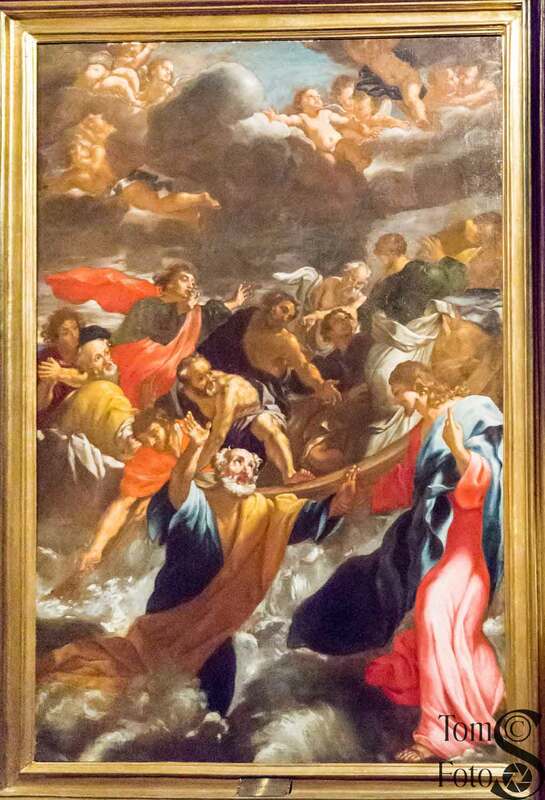 To the right is The Vision of Saint Philip Neri. 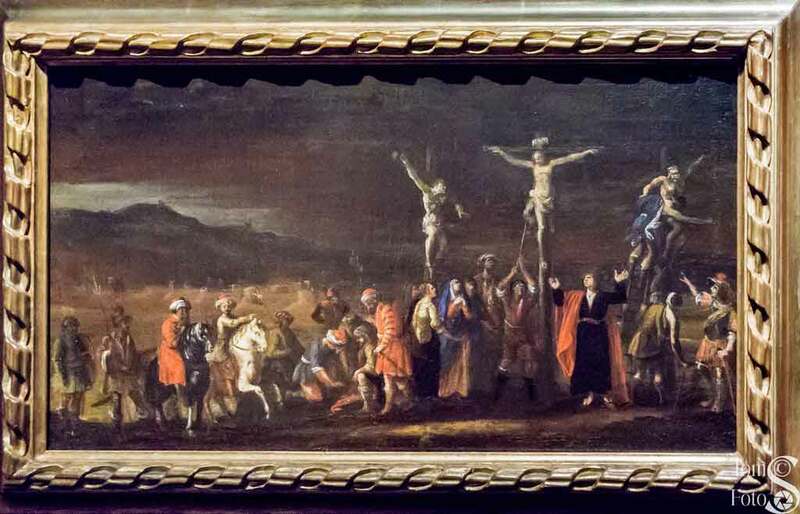 The artist for this 17th century oil on canvas was the Jesuit brother and Flemish baroque painter Daniel Seghers. It shows a famous episode in the saint’s life where the Virgin Mary restored him to life as he was close to death. Portrait of Cardinal Niccolò Oddi, Legate of Romagne. 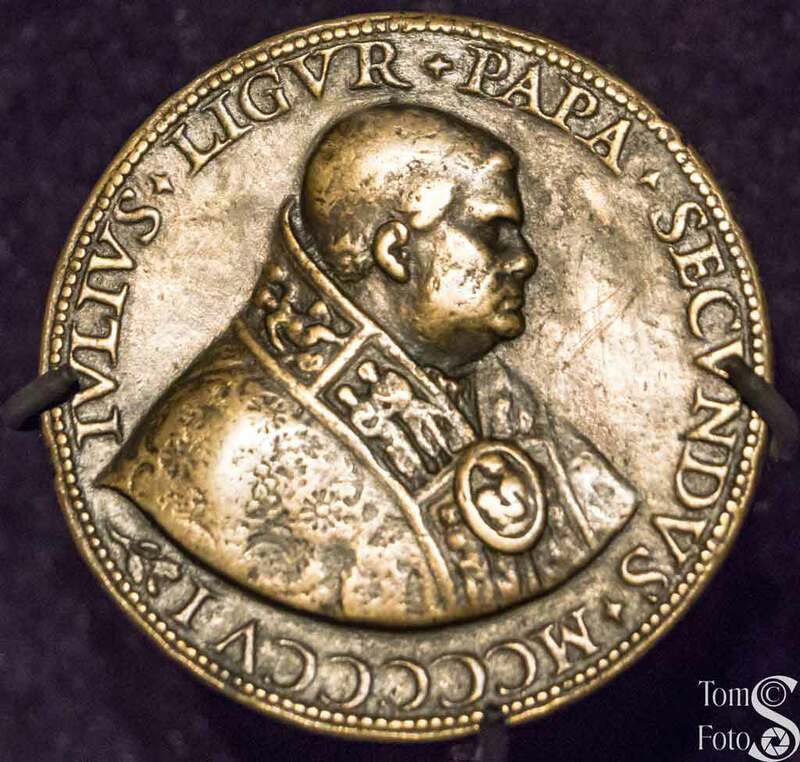 In the Middle Ages popes established Papal States which they ruled as monarchs. A region around the city of Ravenna in northeast Italy became one in 756. The region’s name changed to Romagna in 1540. 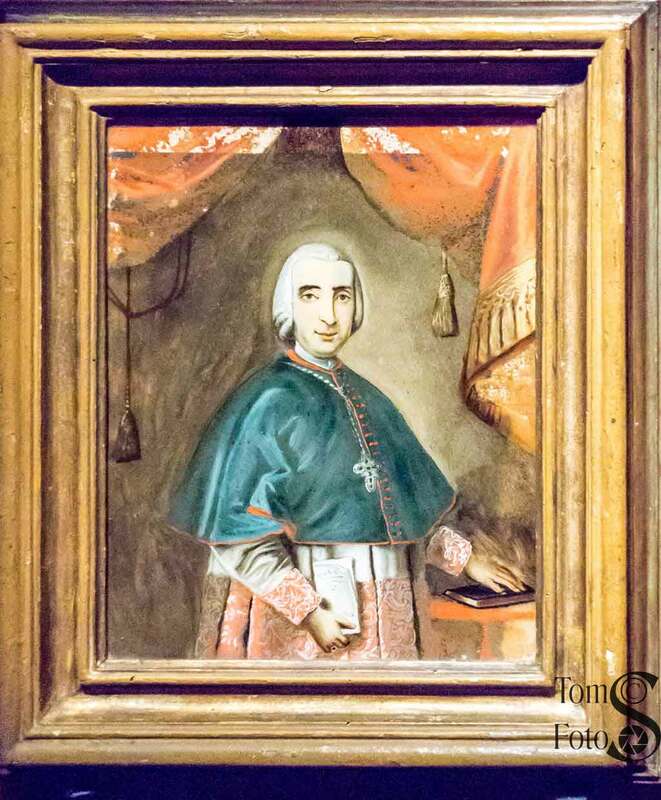 Cardinal Oddi (term: 1766-1767) was the last papal legate of Romagna as Napoleon’s invasion of Italy and the 1797 Treaty of Tolentino ended Romagna as a Papal State. Statues of Saints John and Andrew. 19th century gilt metal statues. Saint John was often depicted with an eagle but here shown with a chalice representing the legend he drank poison and survived. Saint Andrew is shown with the X-shaped cross used as the method of his martyrdom. 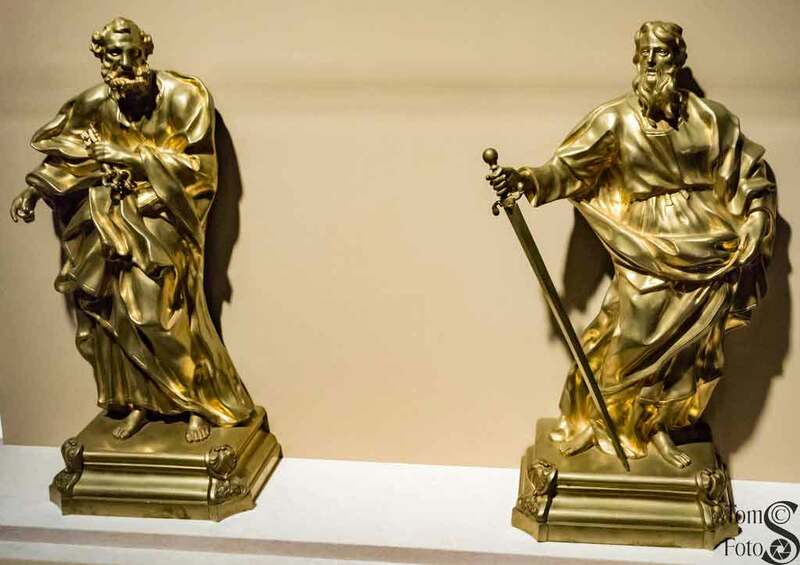 Statues of Saints Peter and Paul. 19th century gilt statues. Saint Peter is shown with the keys to the kingdom while Saint Paul of usually shown with a sword representing his life prior to conversion and the method of his martyrdom (beheading). The Crucifixion with Darkened Skies. An oil on canvas by the School of Leonard Bramer and dating to the 17th century. Christ Raised from the Grave by God the Father. By the Italian Mannerist painter Domenico Mona dating to the late 16th century. Oil on canvas. The Supper of Emmaus. 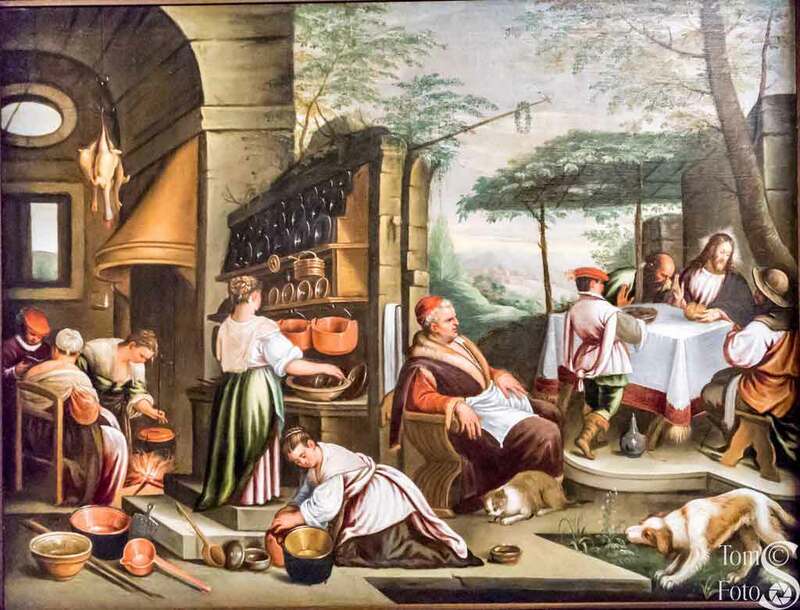 An oil on canvas from the workshop of Francsesco or Leandro Bassano dating from 1590-1620. Portrait of Pius VII. This oil on canvas by Vincenzo Camuccini dates to 1814. 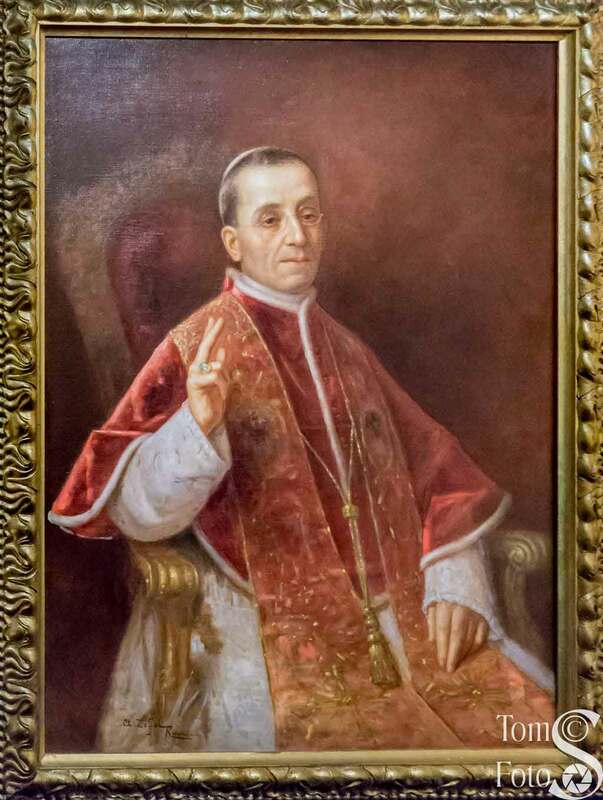 Pope Pius VII’s term starts in the middle of the French occupation of Rome and six months after the death of Pius VI in a French prison. 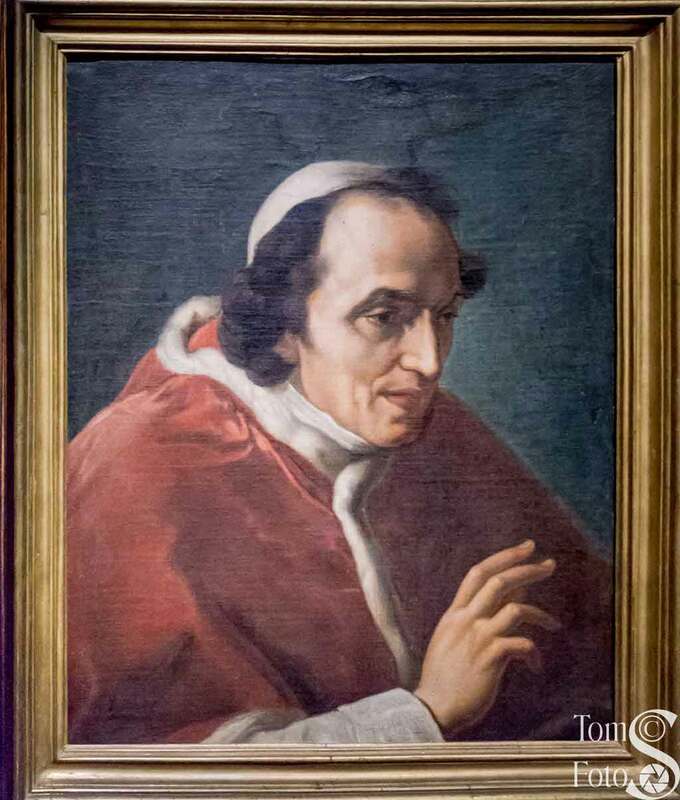 He was elected pope in 1800 in Venice, not under French control but returned to Rome in 1814 after the fall of Napoleon. This portrait ends this gallery. By the flat light of day, gold is crude, heavy, useless, but by the tremulous light of a lamp or candle it springs to life and glitters in sparks beyond counting — now here, now there, evoking the sense of other lights, not of this earth, which fill the space of heaven. The Crozier is a symbol of the authority of the pope as the shepherd of the Catholic flock. 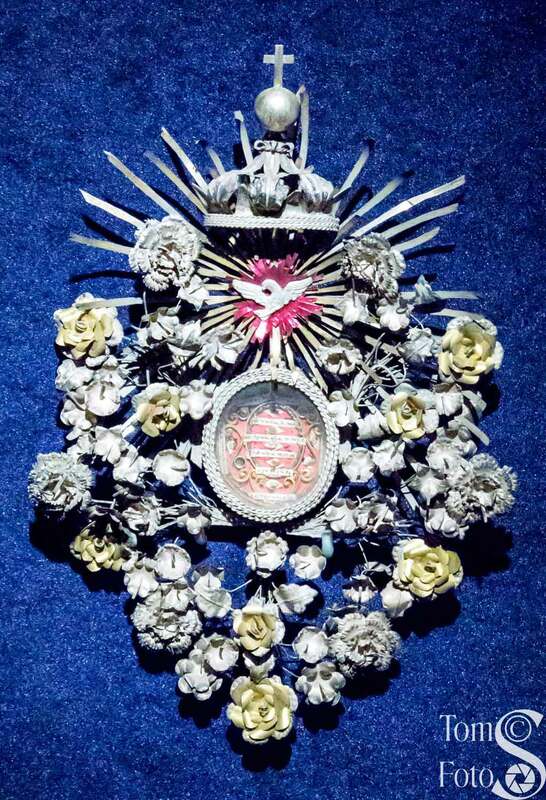 The Crozier on display was used by Pope Leo XIII; a long-serving pope and, at 93, the oldest at his death. 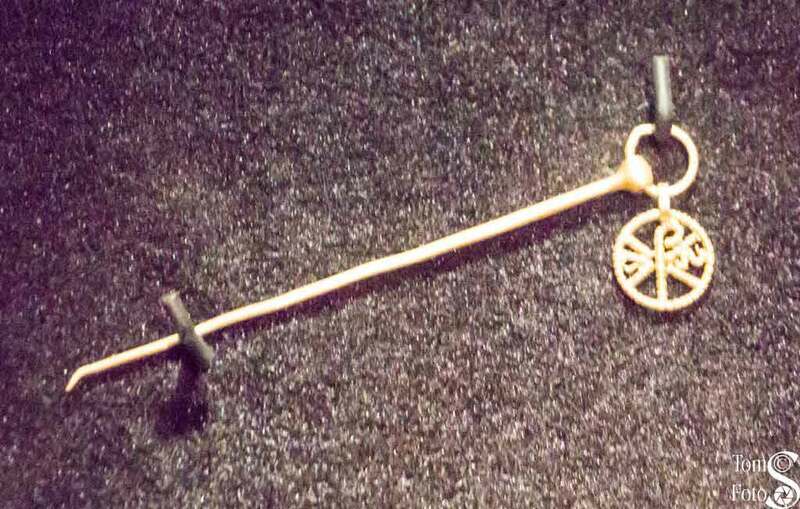 This Crozier, with the double-edged sword, reminds us of Saint Paul’s ability as a preacher. Hanging on the wall is an antependium; a decorative object hanging from the front of an altar, pulpit, or any liturgical table. This is detail of an antependium of the Vatican Basilica depicting Saint Catherine of Bologna dating from 1712 made with gold thread. A wide display of objects used by some of the popes. Before going on we’ll take a closer look at these items. At the far left is a papal table for the adoration of the Holy Sacrament. This table and cushion was used in the papal apartment while the pope knelt for private devotion. This is a 20th century object. 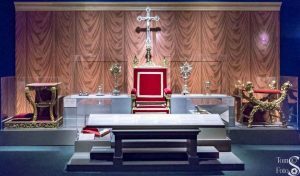 At the far right is the faldstool of Blessed Pius IX and dates from the late 19th century made from gilt wood and red velvet. 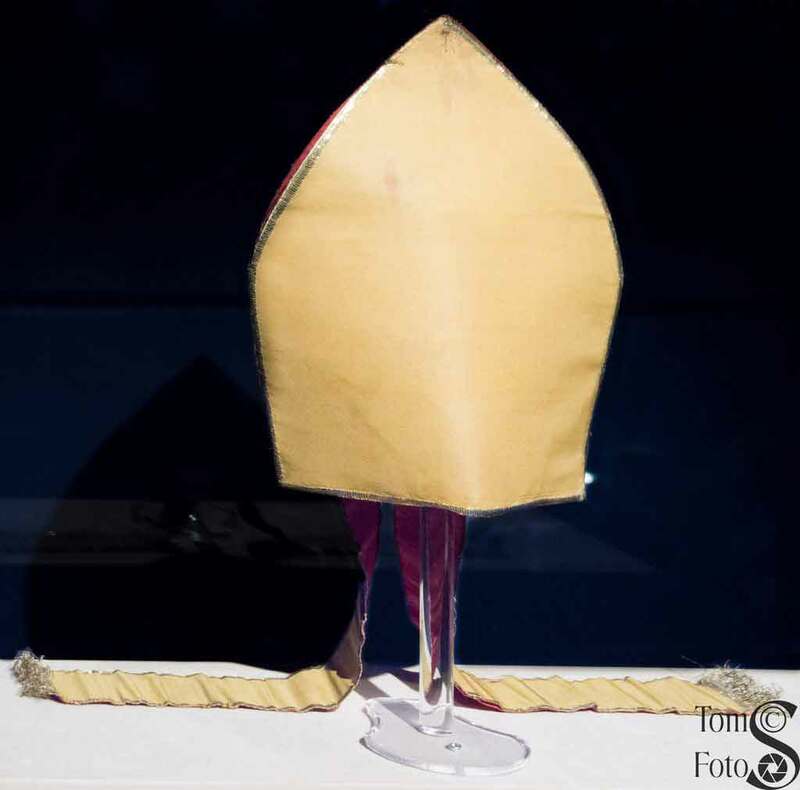 A faldstool is a backless cushioned seat used by high-ranking clergy during the liturgy or as an armrest for kneeling. 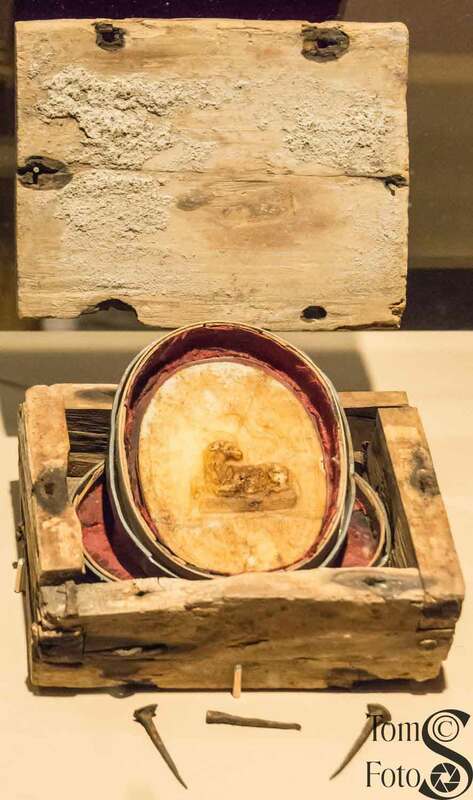 Back to the left and a bit hidden in the above photo, is a foot warmer used by Pope Benedict XV. He had frail health during the World War I period and suffered when cold. At his desk he could slip his feet into the ermine-lined compartment hidden in the footrest. 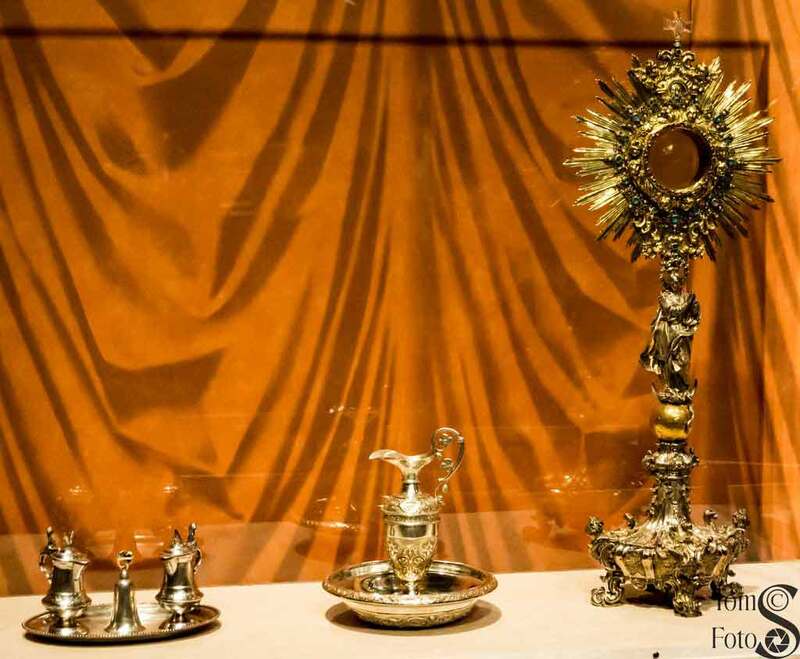 On the table above and to the left we see a cruet set and bell donated by Pope Gregory XVI (circa 1840); a silver ewer and basin that dates from 1983; and a monstrance that dates from the first half of the 19th century and is silver and gilt silver. To the right is a second monstrance of silver and gilt silver dating from 1820. The pyx shown is used to hold consecrated hosts and/or take them to the sick. This pyx is copper and silver from 1975. In the middle is an altar cross, the supreme symbol of Jesus’ sacrifice, that is placed in the center of the altar during services. 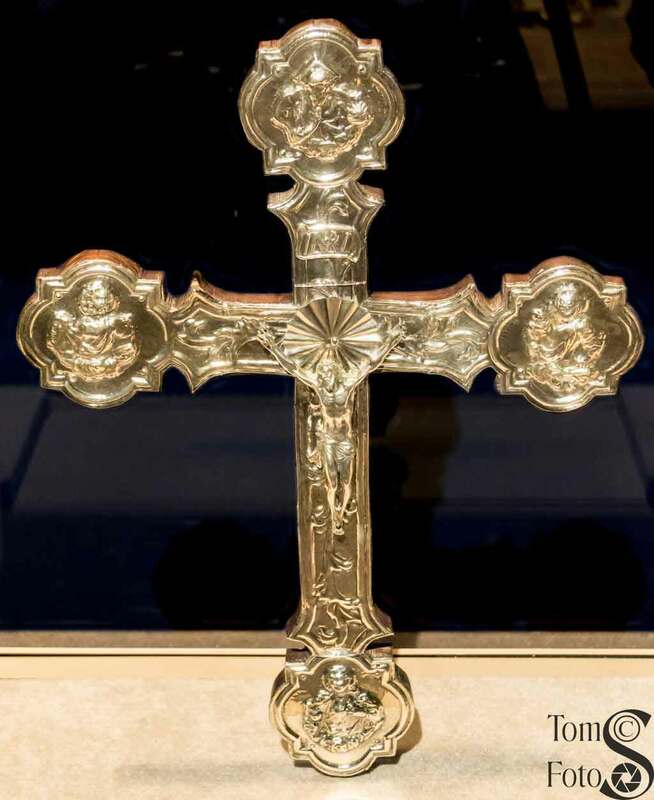 This cross dates from the first half of the 19th century and is gold, silver, and gems. 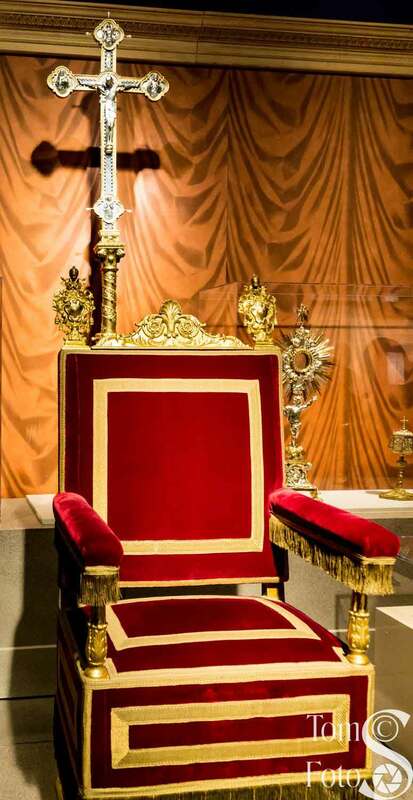 In front of the cross is the papal throne of Pope Pius XI dating from the 19th century and is wood, velvet, gold-plated metal, and golden thread. 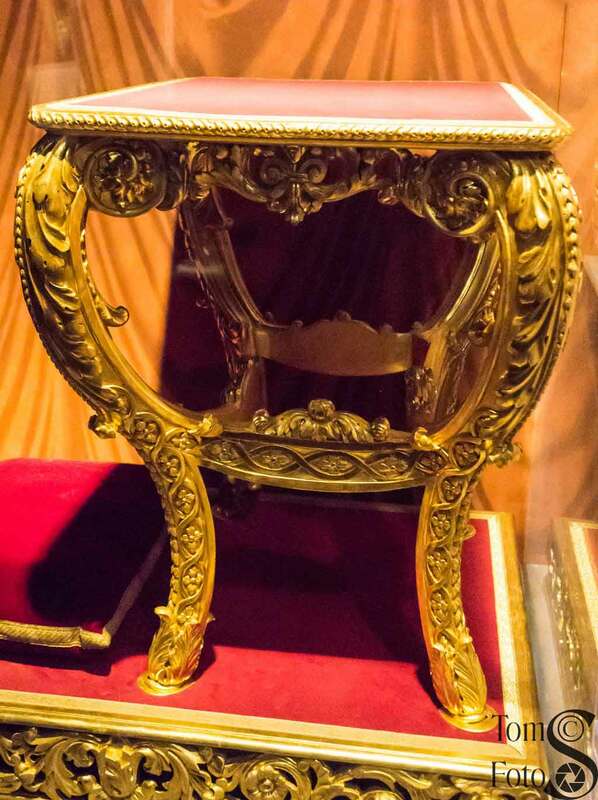 The chair was a symbol of authority throughout the ancient world and in the Jewish tradition is a symbol of teaching authority. 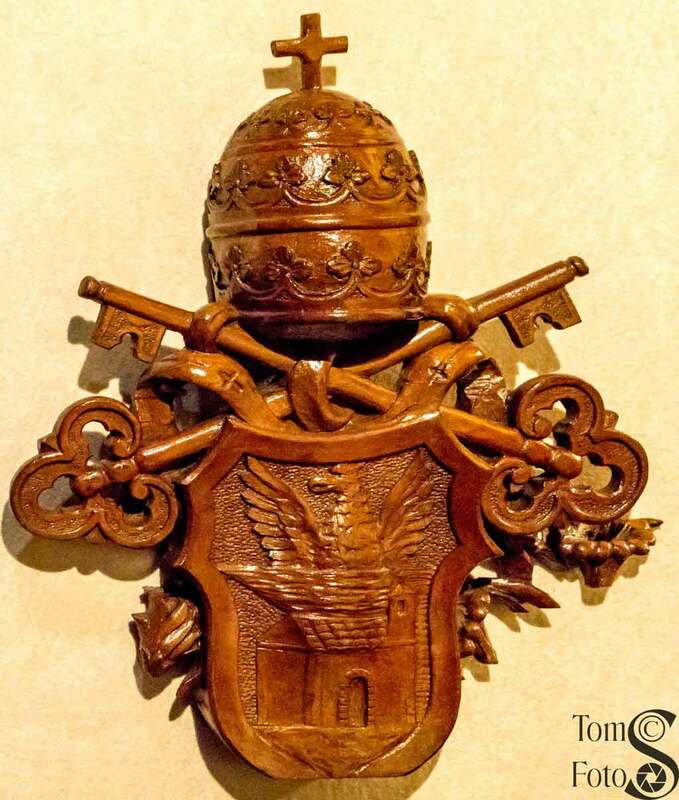 The pope’s throne is the “chair of Peter” as all popes descend from Saint Peter. 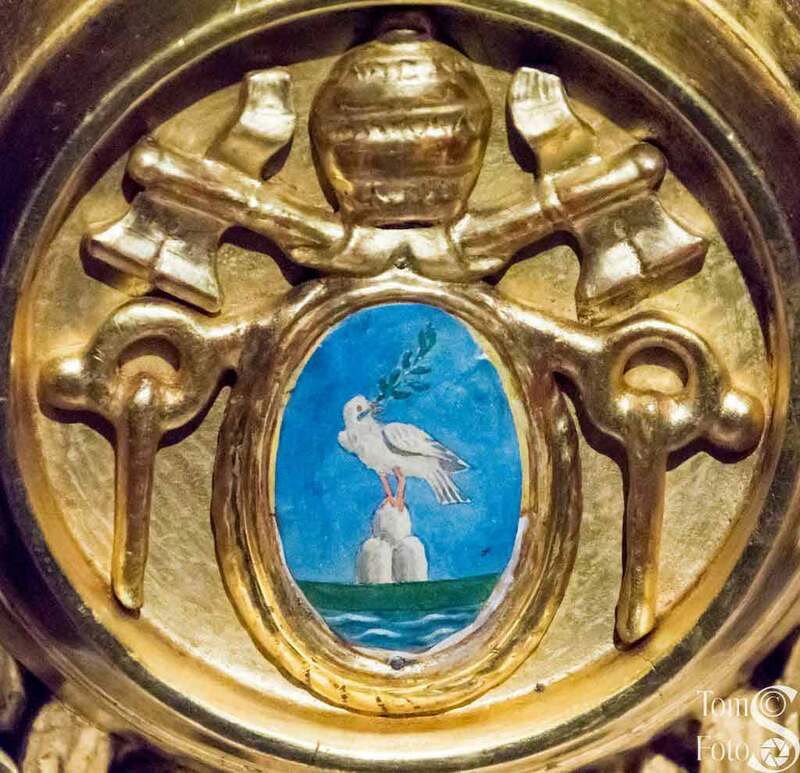 Two items just to the right of the throne and an Agnus Dei and cartagloria. 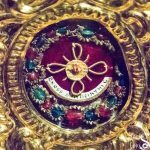 An Agnus Dei is a wax seal imprinted with the image of Christ, Lamb of God, and blessed by a pope. They were often used as gifts to distinguished persons. The one shown to the left is from 1619 and Pope Paul V. A cartagloria (right) is an altar mass card. Cartaglorias were put on the altar to remind the celebrant of the various mass prayers. 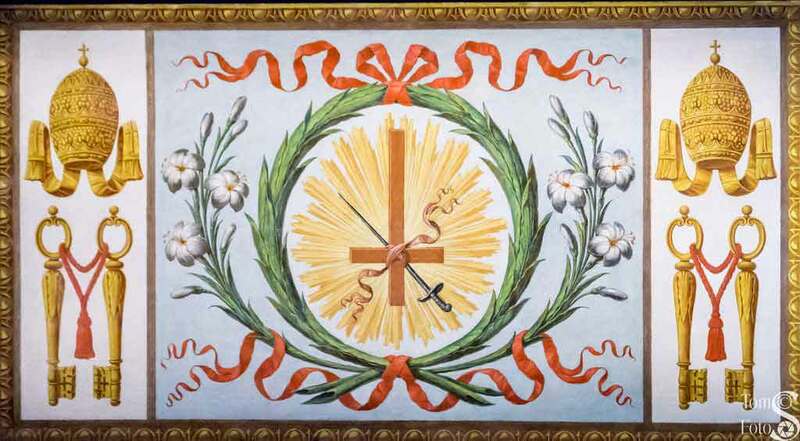 This one came from Blessed Pius IX and dates from 1867. 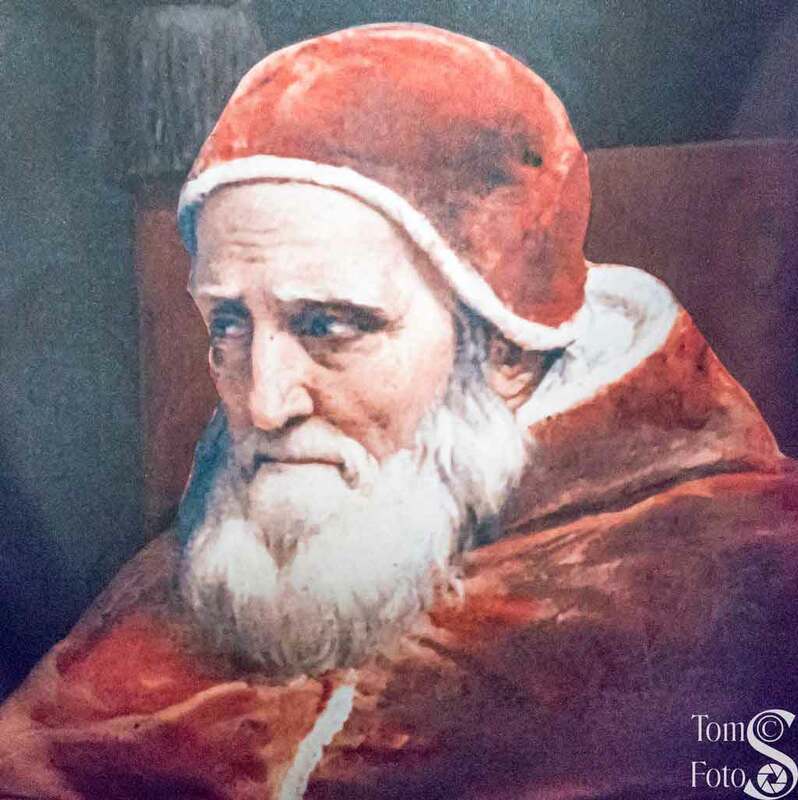 Moving on now, we see the dalmatic of Saint Pius V. Pius V implemented the reforms of the Council of Trent. 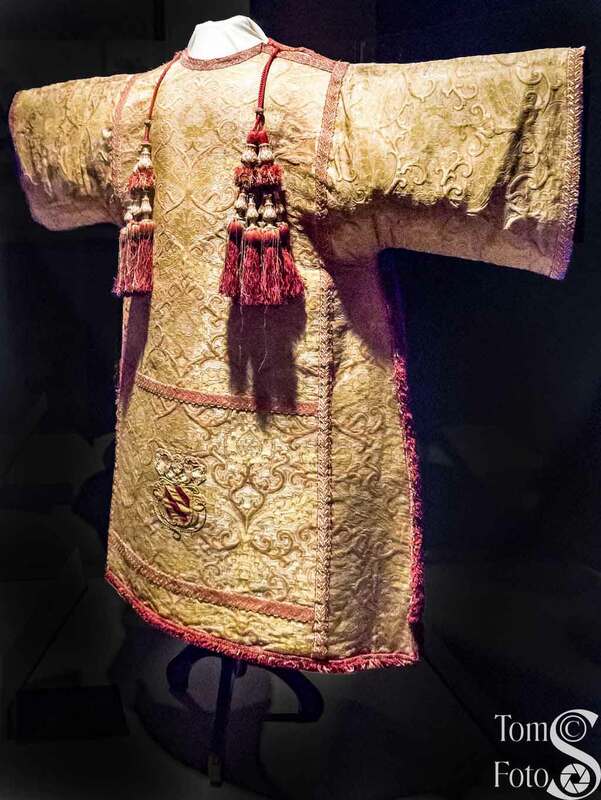 He would have worn this garment under his chasuble when saying Mass. 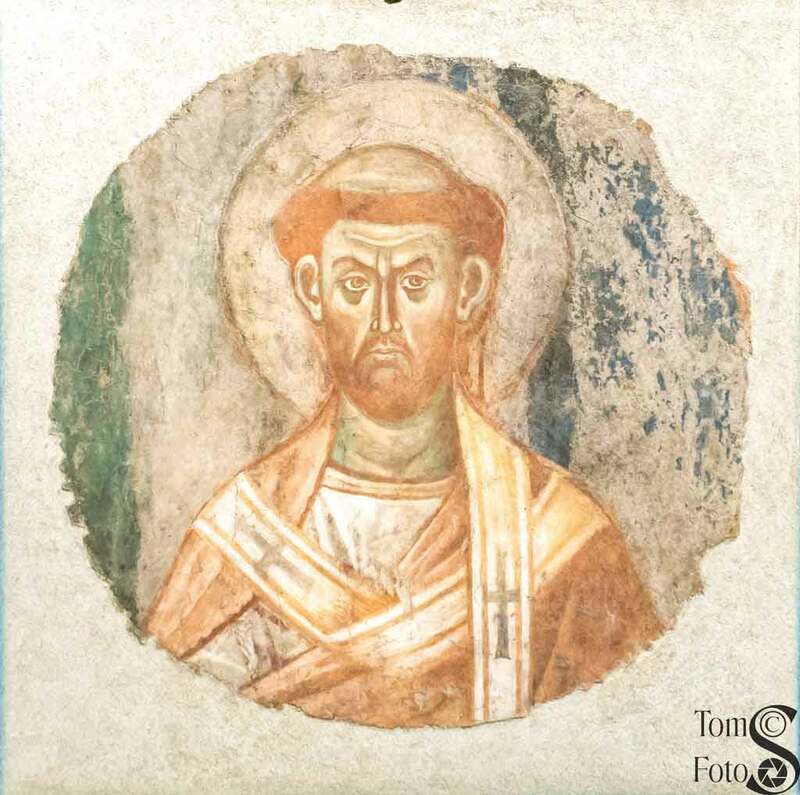 Today, dalmatics are usually worn by deacons as outer garments. This one dates from 1566-1572 and is made from brocade silk, silver threads, chevrons, red silk, and gold. 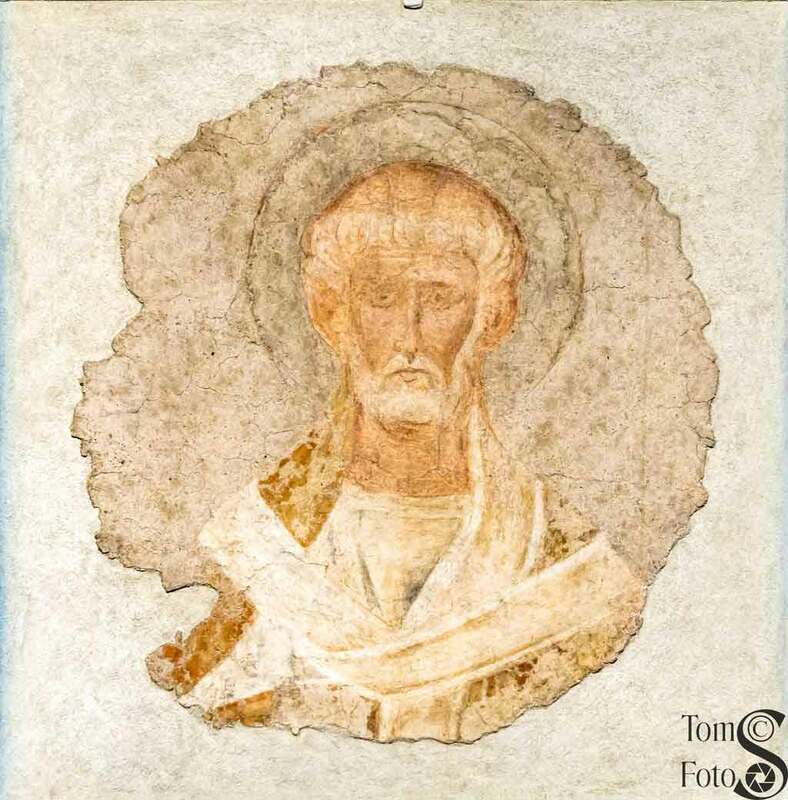 On the wall we see a cartoon for the Mosaic of the Altar Frontal “The Head of Saint Peter.” Recall that a cartoon is a full-sized image that is used to create a mosaic. This cartoon is oil on canvas and dates from the 19th century. 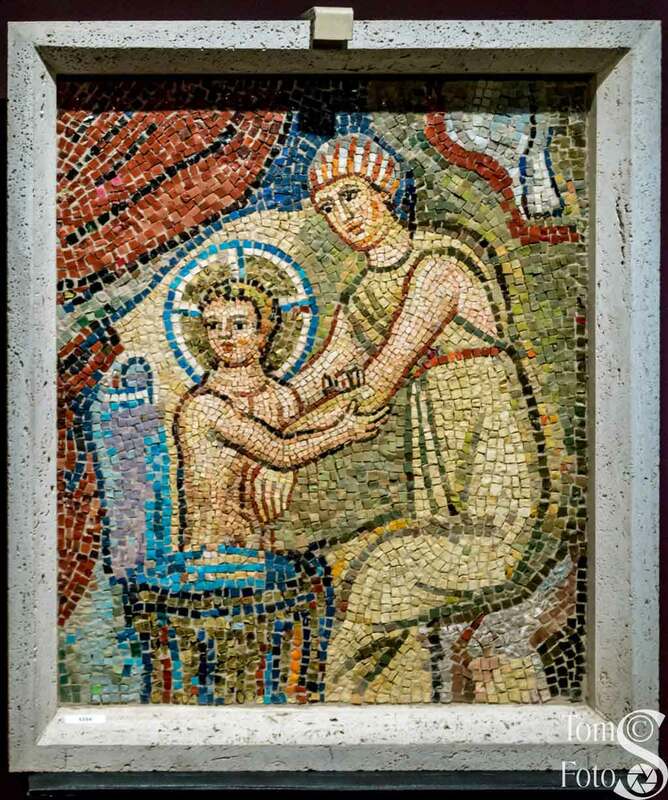 The mosaic is in the Chapel of Clementine in the Vatican Grottoes. A chasuble is worn when officiating at Mass. 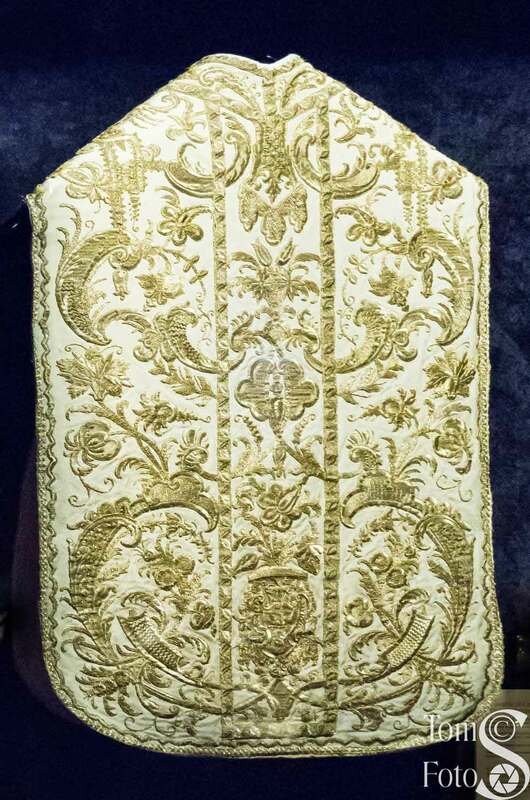 This chasuble belonged to Cardinal Scipione Borghese (1734-1782) and is white lamina and gold embroidery. 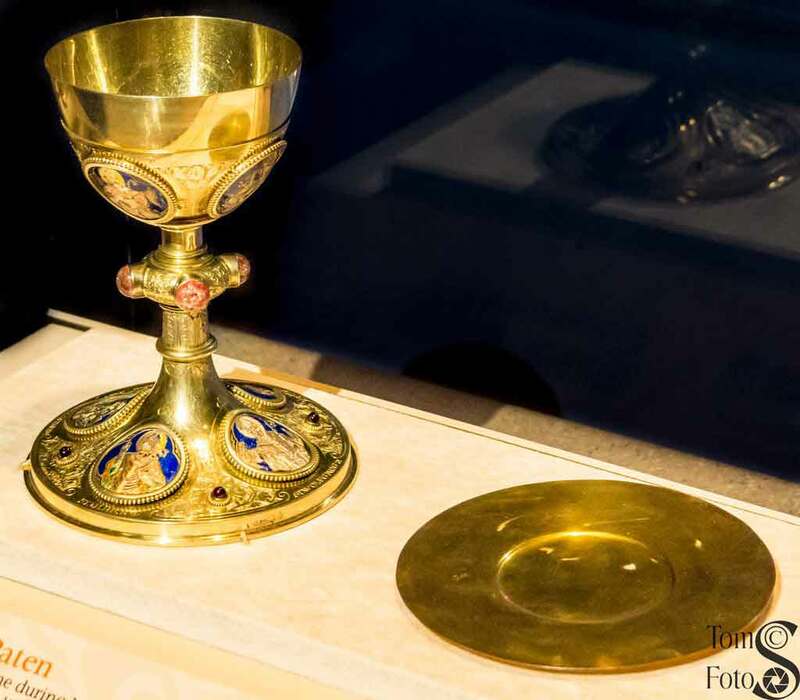 In the center of this gallery is a beautiful display of a Chalice, Paten, and Ciborium from Saint John Paul II. These date from 2001 and the Private Collection, Vatican City State. This is one of the items you would not see if you went to Rome. Along the wall is a collection of Chalice and Paten sets. 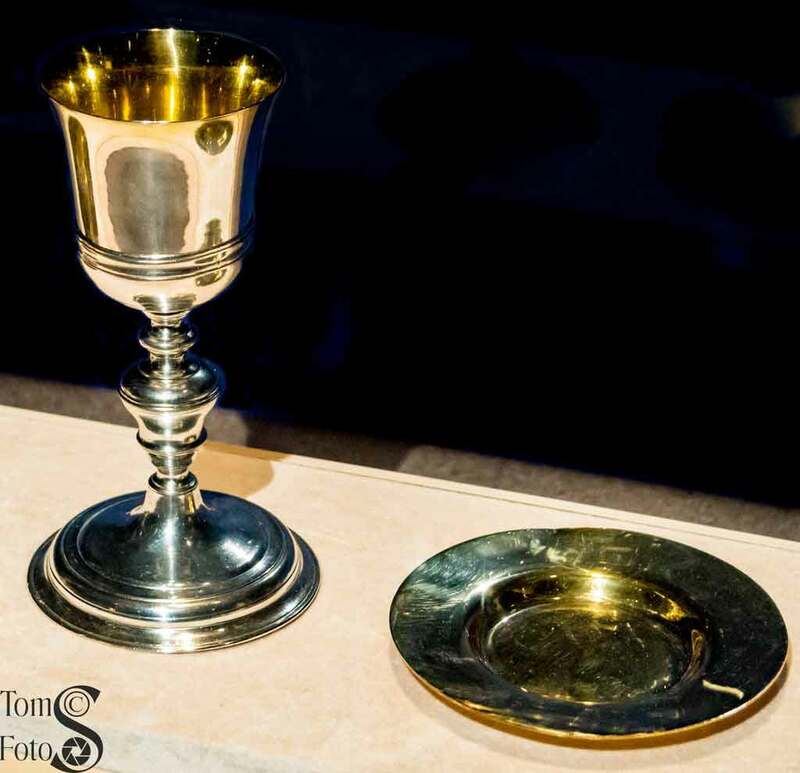 The chalice is used for wine during Mass and represents the cup used during the Last Supper. Bread to be consecrated is placed on the paten. 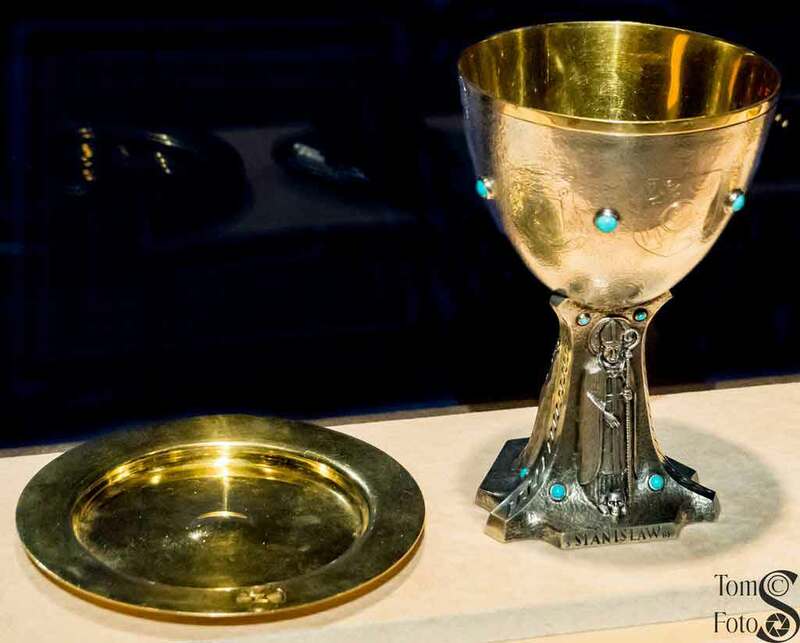 On the left is the chalice and paten of Pope Pius XI dating from 1925. 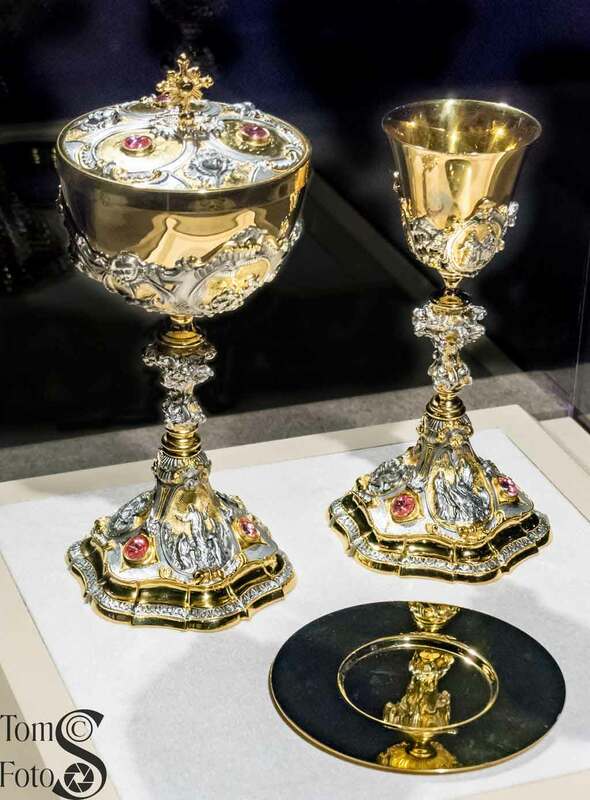 To the right is a set blessed by Pope Pius VII in 1806 and again by Pope Paul VI on 24 October 1975. On the left is a set given by then Blessed John Paul II in 1983. On the right is an ornate set with the coat of arms of the Basilica of Saint Paul Outside the Walls and a scene of the Last Supper. It dates from the first half of the 19th century. 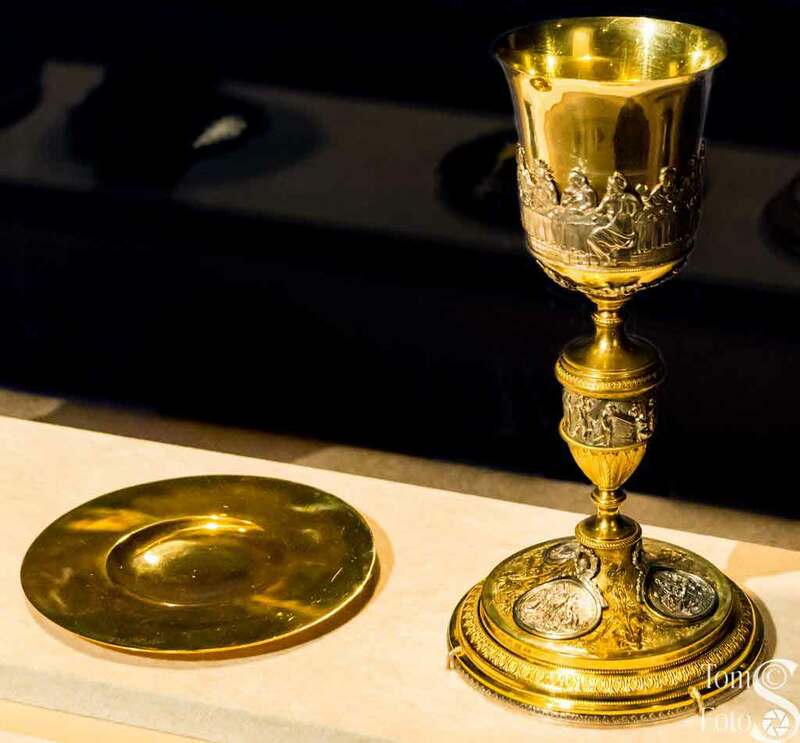 In the center of the table with the chalice and paten display is a silver crucifix over wooden support dating from the end of the 18th century. 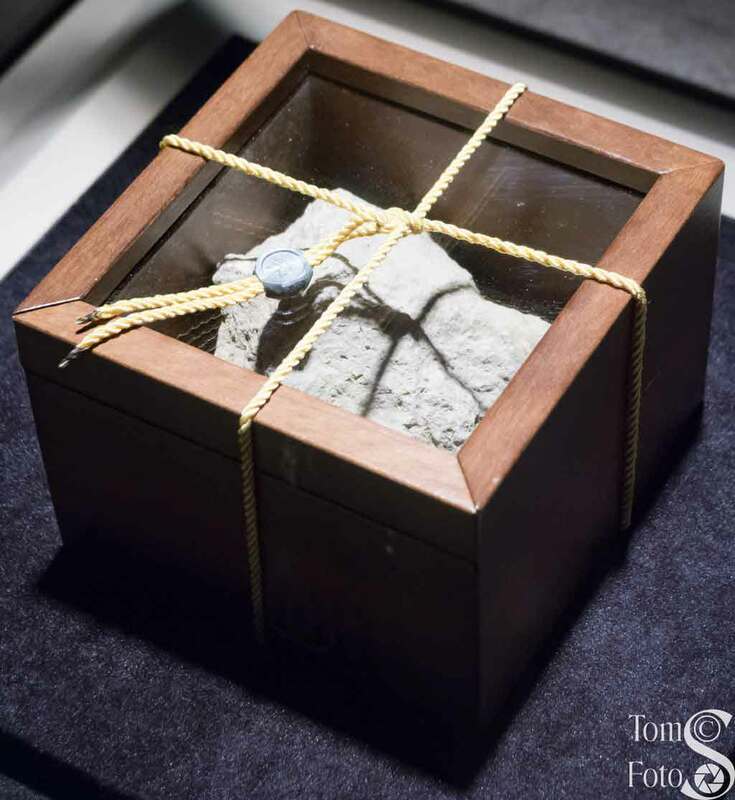 This is another private collection item that is not on public display in Rome. 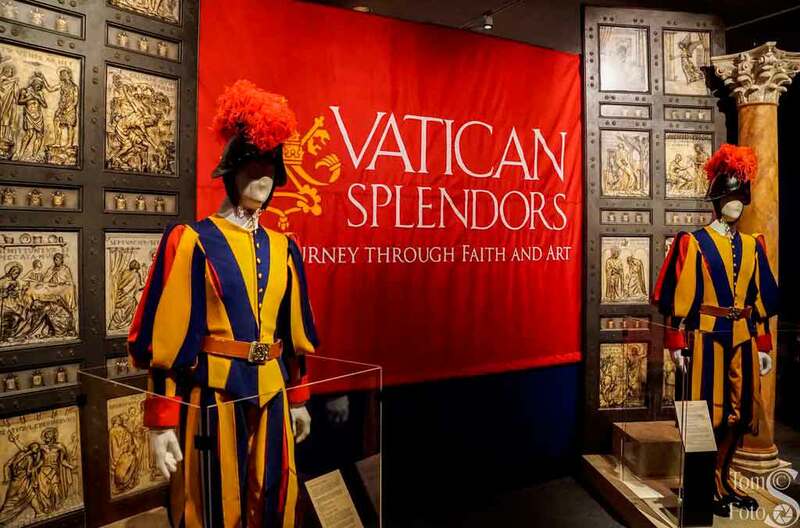 Perhaps the most curious exhibit is a display of two papal barrels. It turns out that when a saint is canonized it is the custom to present the pope with wax candles (representing the divinity of Jesus in the flame), loaves of bread (Jesus provides saints of their only nourishment), a silver barrel (holding water symbolizing the ills of the world), a gold barrel (holding wine, the symbol of sanctifying grace), and three cages of birds (showing saints, like birds, only have a short time on Earth). 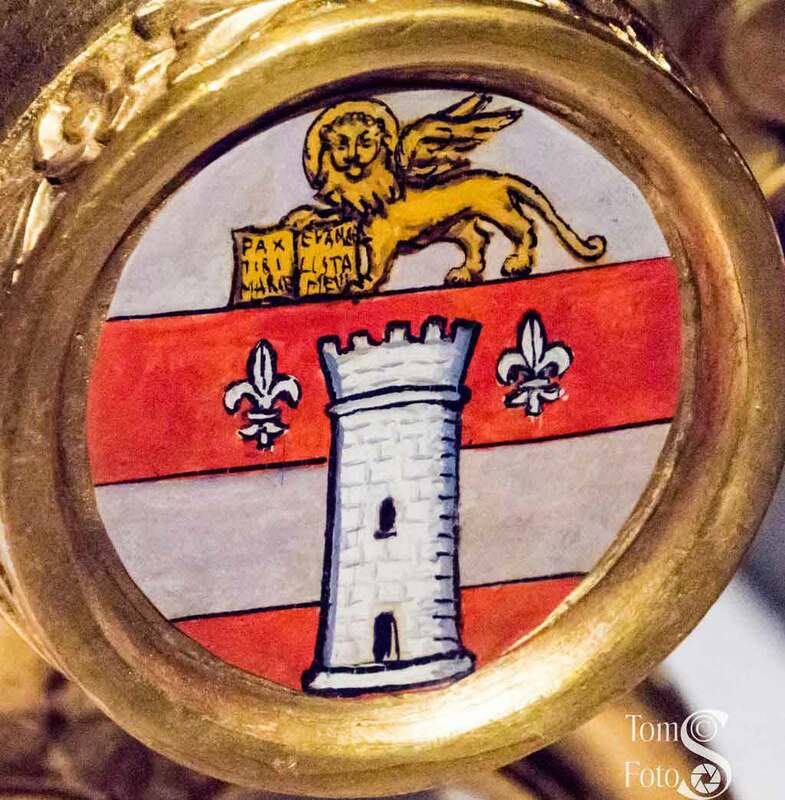 The first is a barrel with the coat of arms of Pope Pius XII (1939-1958) and is gilt wood and painted wood. 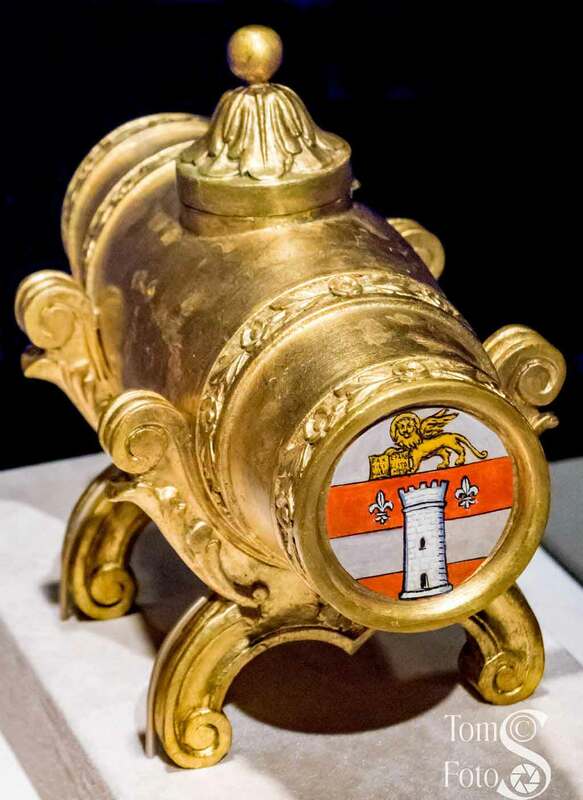 The second is a barrel with the coat of arms of Saint John XXIII (1958-1963) and is also gilt wood and painted wood. The pope’s comment to the artist was “Please don’t make my lion look so cross.” Look closely and you’ll see the lion close to smiling. 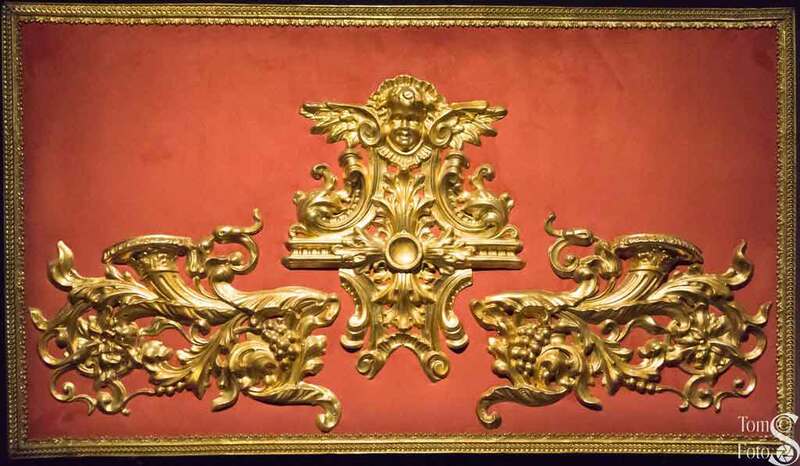 In the corner toward the exit of the gallery sits a baroque stand dating to the second half of the 17th century made of silver, gilt copper, gilt bronze, and wood. The stand is designed to support a monstrance. 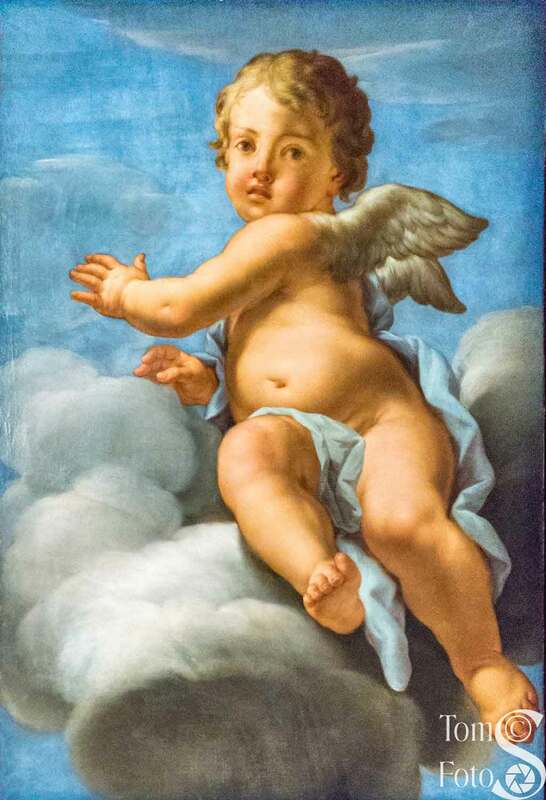 The angels in the upper part were inspired by Bernini. Scenes from the Last Supper and Deposition from the Cross are on the base. 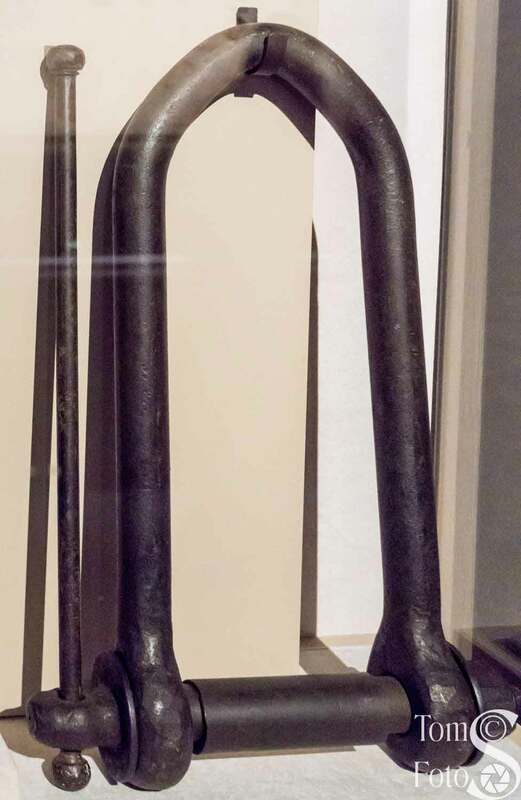 There are handles on the sides for carrying. 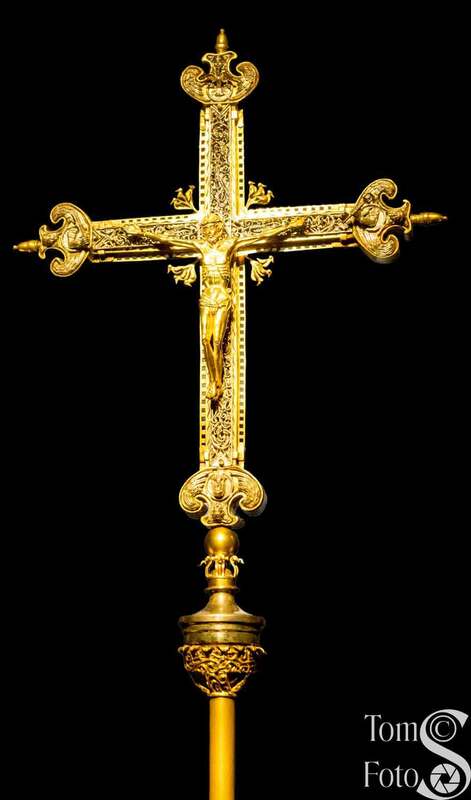 Across from the stand is a processional cross of gold and silver dating to the first half of the 19th century. Here you see a liturgical plate in service for the Mass. Liturgical plate is the term used for all metal objects used at the altar during celebration of the Mass. 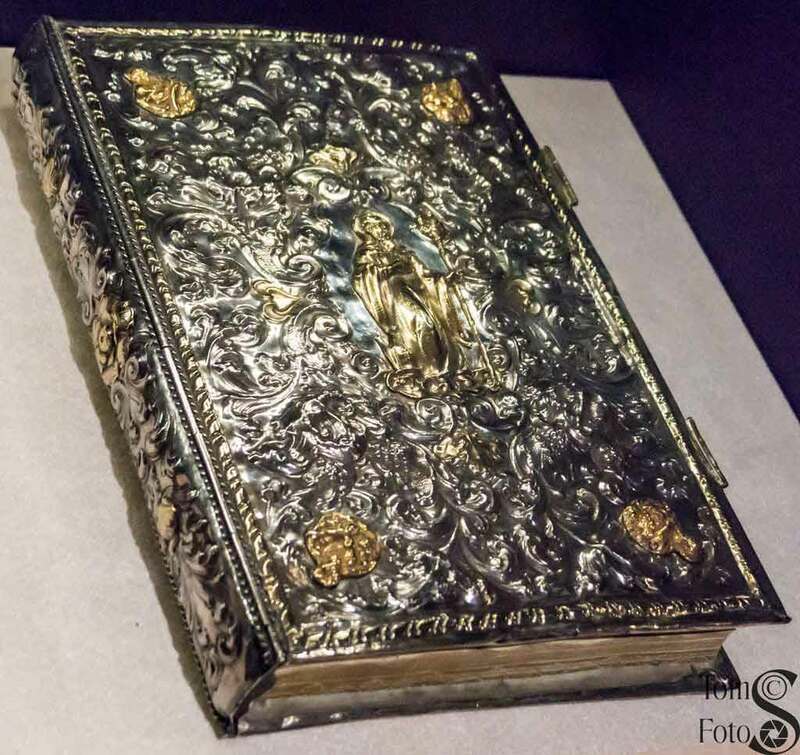 This was a gift of the Prince Paolo Borghese and is gilt silver dating from 1874. 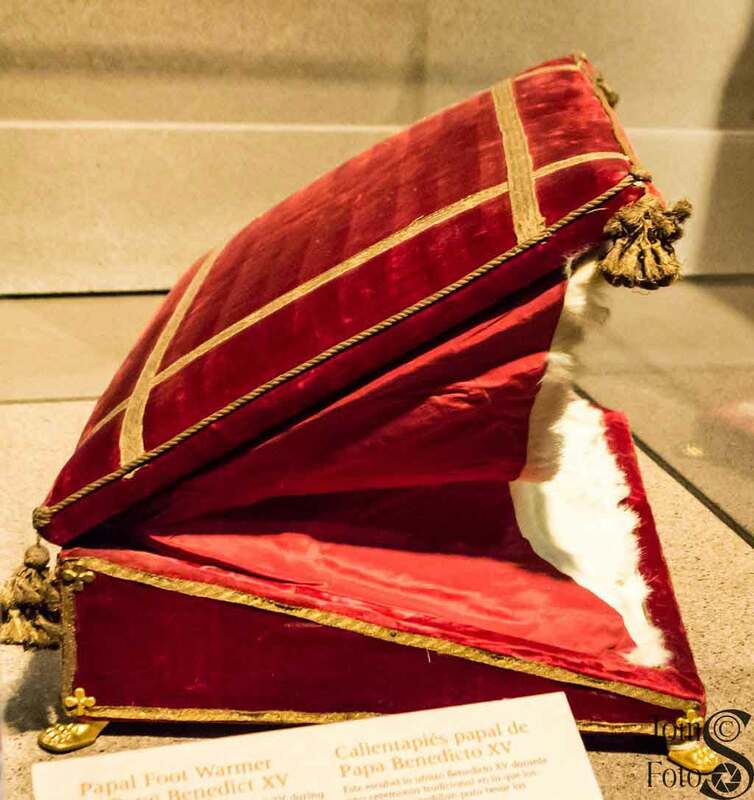 The gold miter of Saint Pius V is on display. 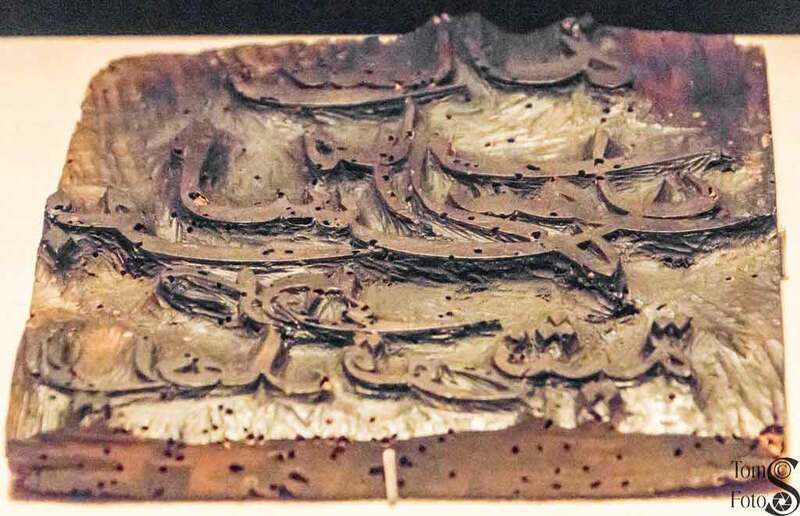 It is cloth with gold thread and dates to 1566. 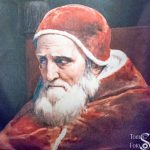 Pius V made compulsory the use of the 1570 Roman Missal, standardizing the Latin Mass for 400 years. 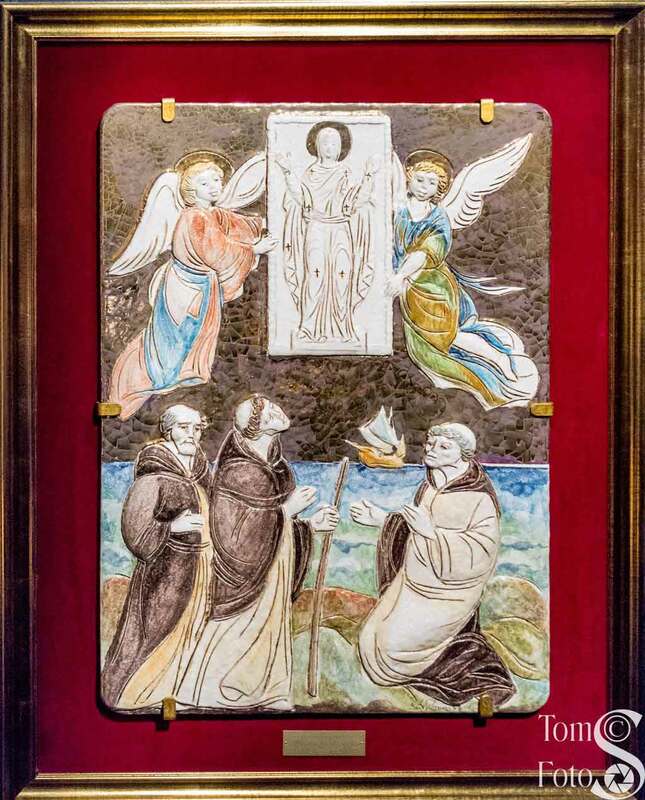 A gift to Benedict XVI, this is a 19th century wooden panel with embossed copper ornament. Missals are used to hold the prayers used by the Mass celebrant. 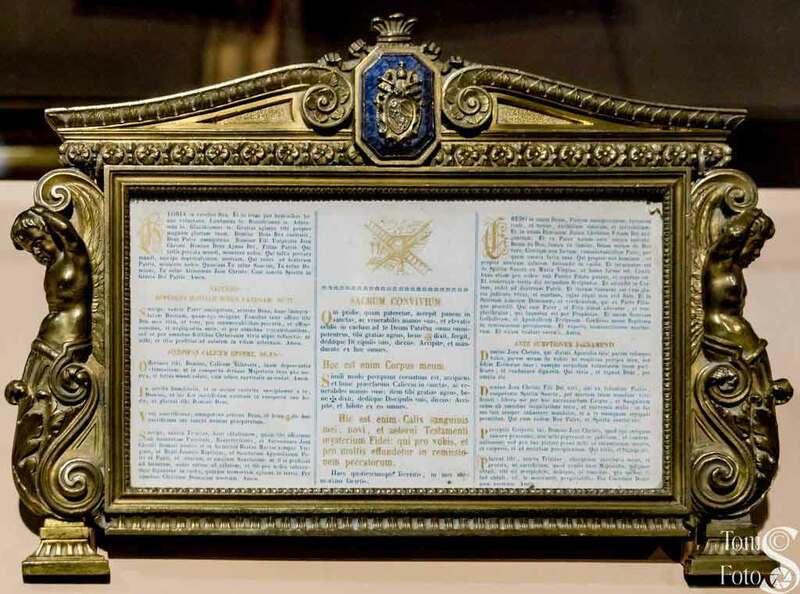 On the left is one that was presented to the Basilica of Saint Paul by Saint John XXIII on 25 January 1959 when he announced he was calling the Second Vatican Council. The missal itself dates to the second half of the 18th century. To the right is a second that illustrates one of the ornate covers the documents often had. This one dates to 1700. 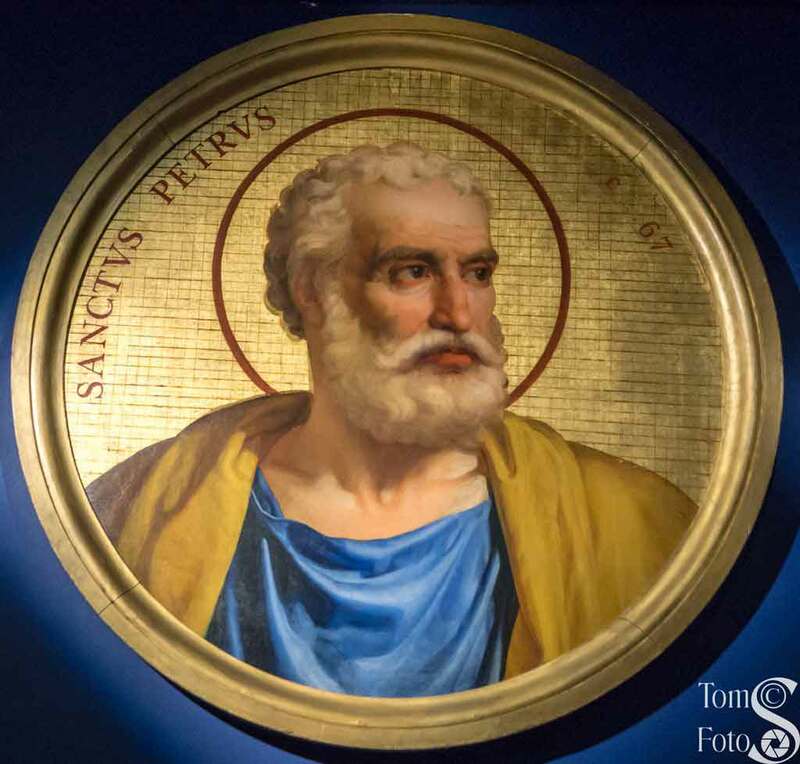 Finally, don’t miss the display of resin casts of ivory friezes that decorate the wooden Chair of Saint Peter at the base of the stairs before going up to the remaining galleries. 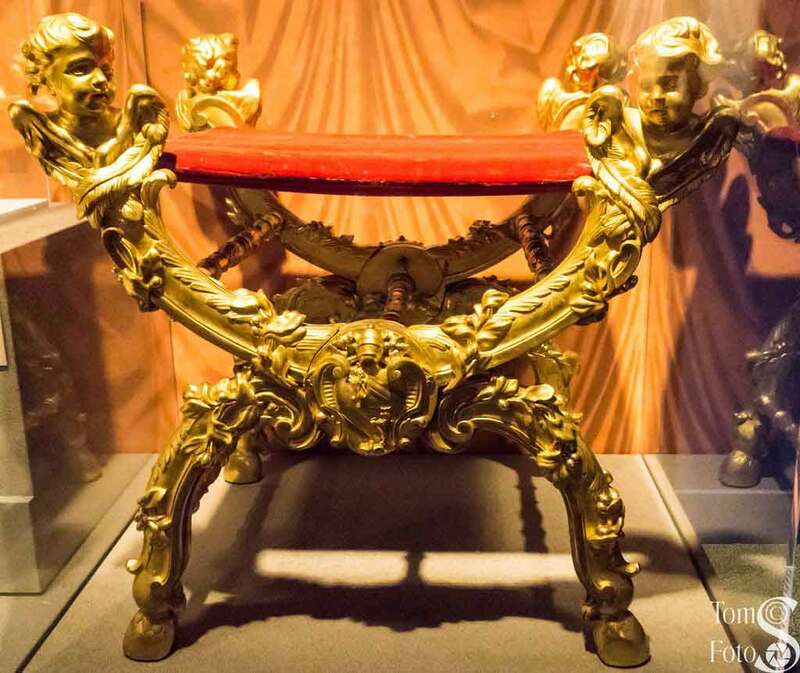 Bernini incorporated the chair into the gilded bronze throne in the Basilica’s apse. Look at the details. None of the small figures in the friezes repeat. 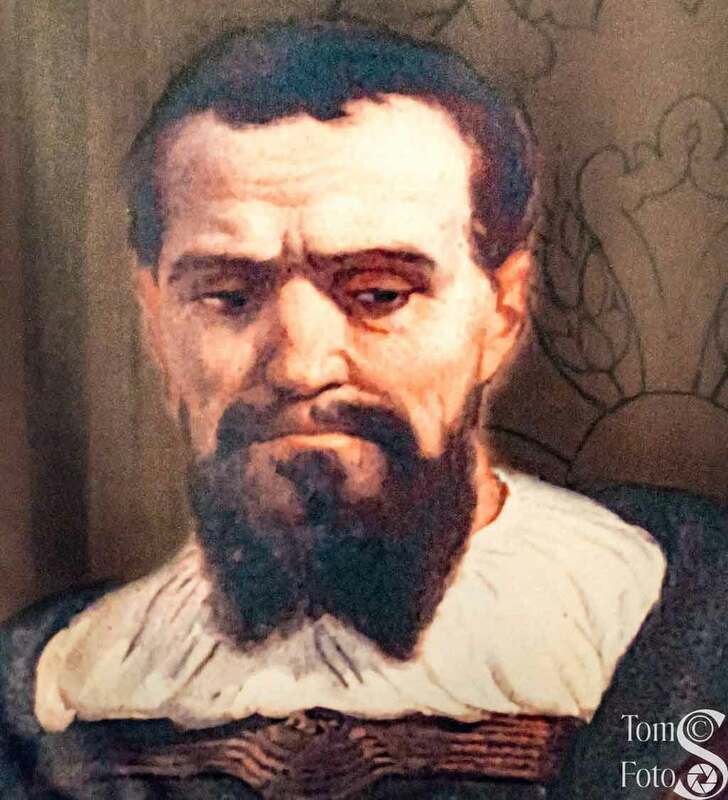 In 1627, as countries started to explore the world and discovered more countries and people to convert Pope Urban VIII founded Urban College of the Propaganda Fide (the propagation of the faith). The parchment you see here, is the Solemn Letter Immortalis Dei Filius which he used to found the college. With the missionary outreach, the Congregationis de Propaganda Fide became one of the best foreign-language publishers in Europe. 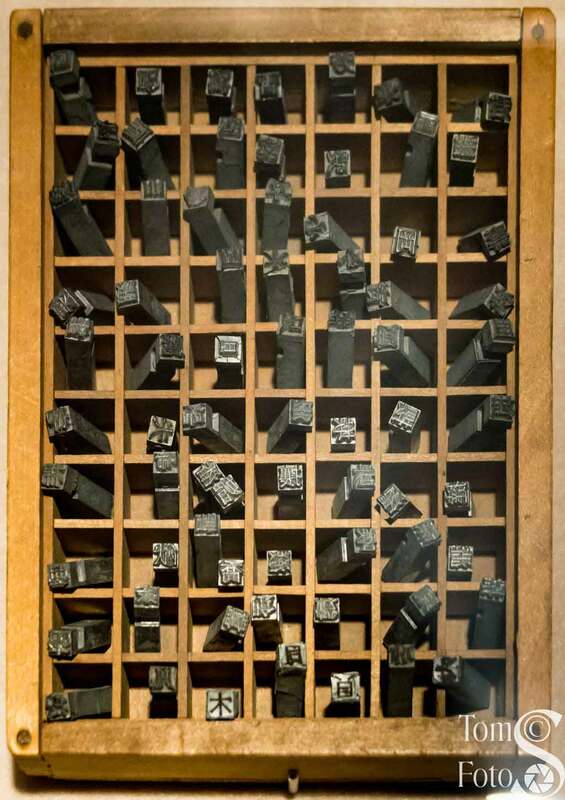 What you see here is a test print showing characters from 21 alphabets used by the Congregation’s Polyglot Printing Press. It dates from 1648. Four different sterotypes and lead characters are on display here. To the left are lead Japanese type characters (20th century) and on the right is a Georgian wood stereotype from the 18th century. And, on the left here is an 18th century wood Arabic stereotype and on the right a similar stereotype for Latin. In addition to writing, exploration involved mapping. 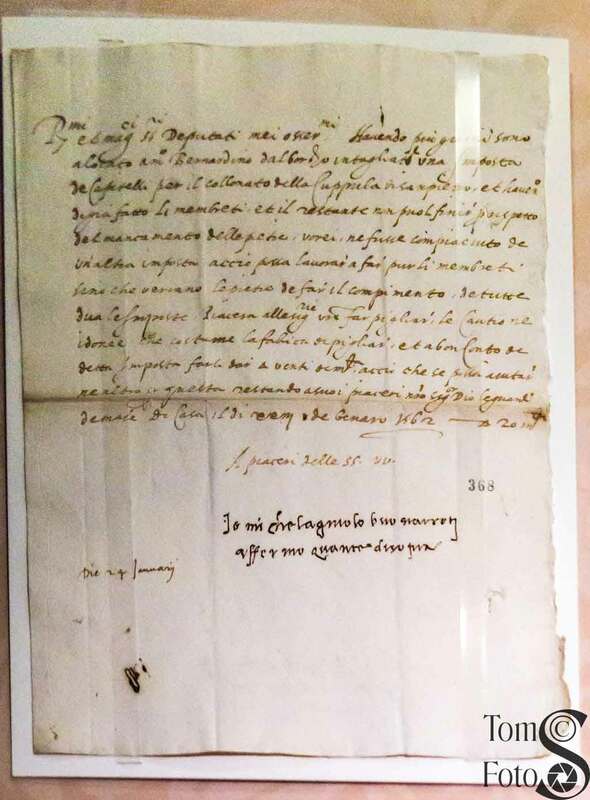 On the left you see a 1676 drawing from Dominican priest, Friar Vittorio Riccio who was serving in Manila. 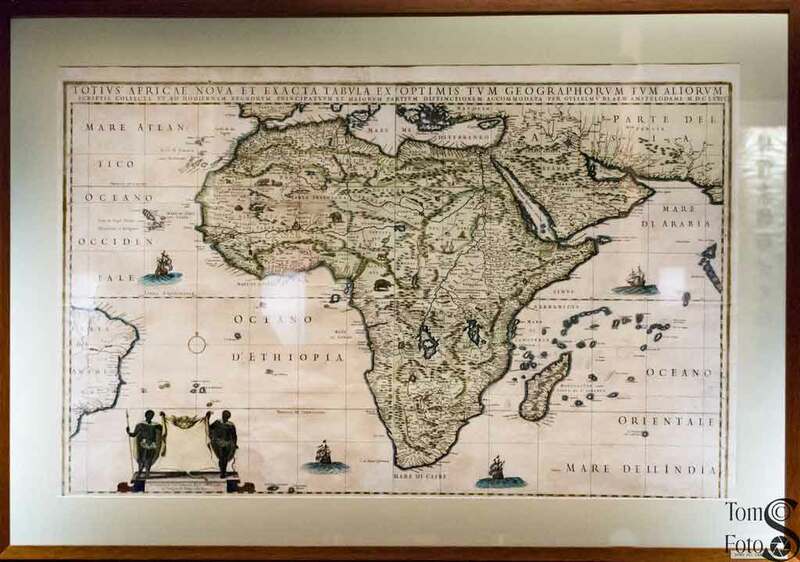 It is the first known geographic map of Australia. 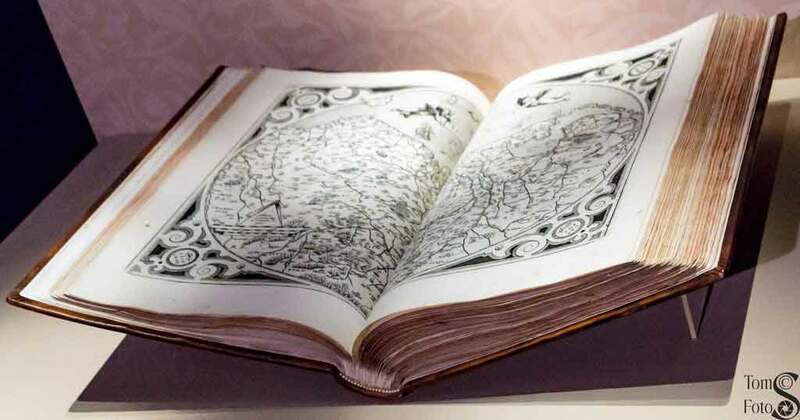 On the right is a book consisting of maps using the Mercator Projection as published by Gerardus Mercator (1512-1594). The book dates from 1623. The Mercator Projection is still used for many maps today even though it does distort the proportions of land masses. 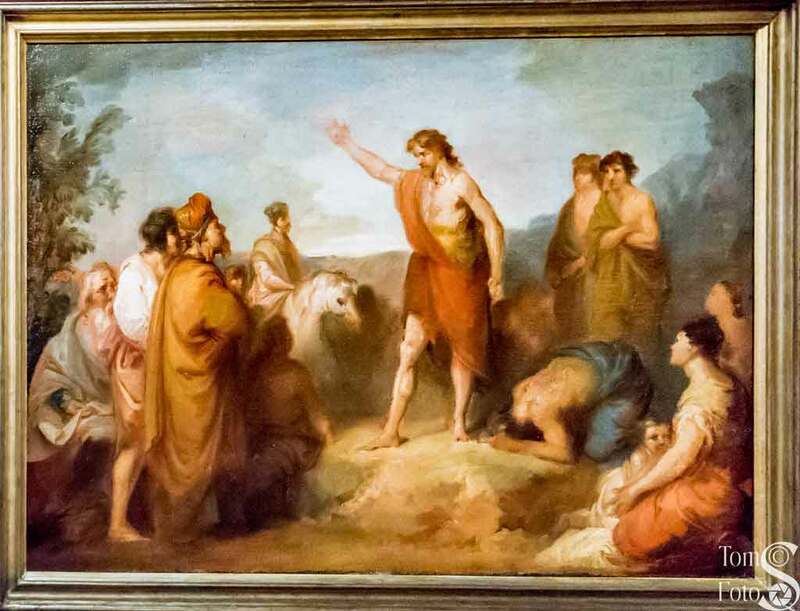 In line with the gallery’s purpose, this oil on canvas dating from the 17th-18th century by an unknown Roman painter following Berini’s iconography shows Saint John the Baptist Preaching. A Christian faith based on Western culture did not always match the beliefs of other cultures and the early missionary history is both complex and often violent. 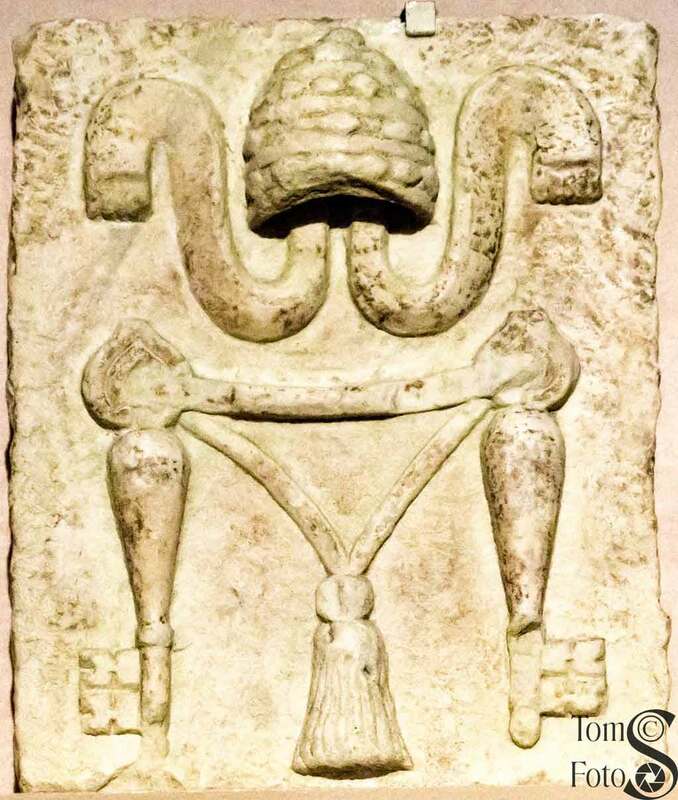 We can see one such on the left in the tablet of ancestors to the left. 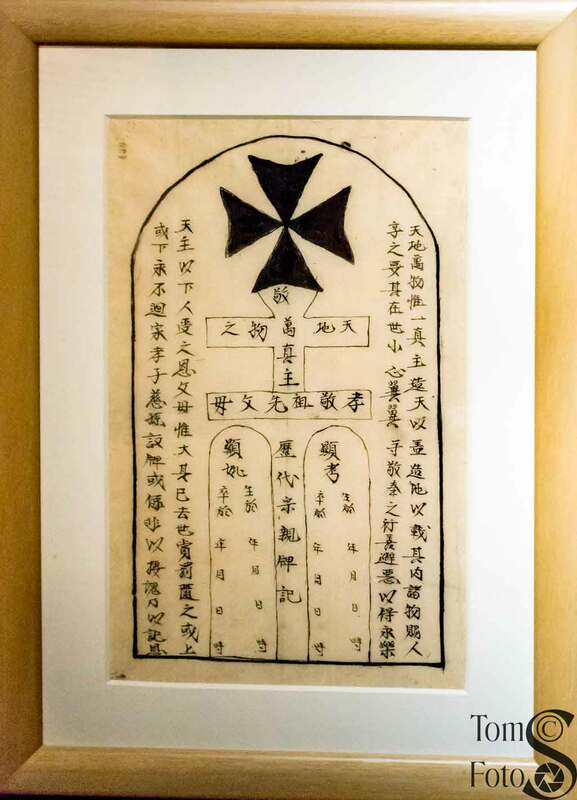 Pope Clement XI, in 1704, prohibited Chinese Christians from taking part in rites to Confusius and people’s dead ancestors. The household was just permitted tablets marked only with the ancestor name, a declaration to the departed, and an expression of Piety by children toward parents. 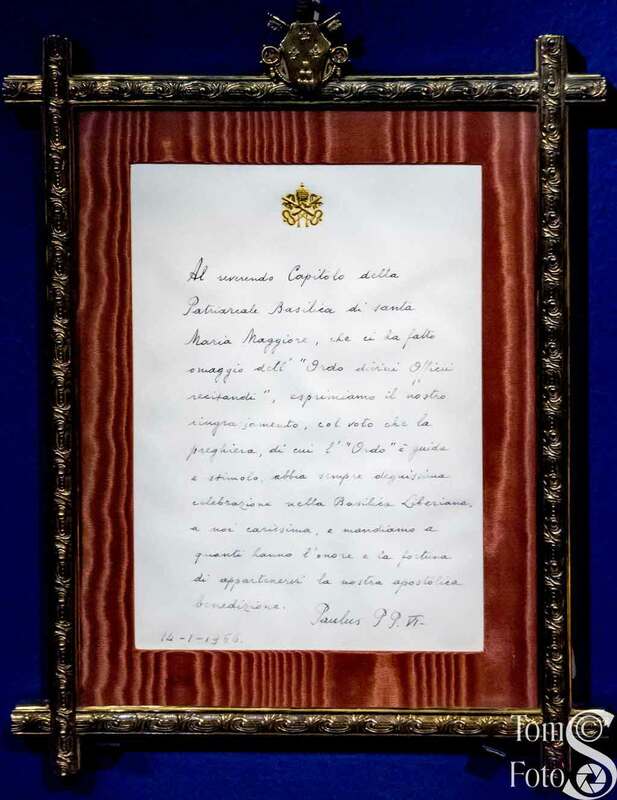 On the other side of the coin, to the right we see an 1847 letter to Blessed Pius IX asking for resolution of a local dispute. It’s on red silk, traditionally used for correspondence with the emperor. This pair of photos show Christian funerals in southern Vietnam (left) in 1840 and a Chinese funeral (right) from 1791. Some missionaries judged these rites to be superstitious; others saw them as a teaching opportunity. The photo here is of a blue cloth drape with Tokugawa shogun heraldry dating from some time between 1603 and 1868 when the Tokugawa shoguns ruled in Japan. It decorated the main gate in a Buddhist temple. 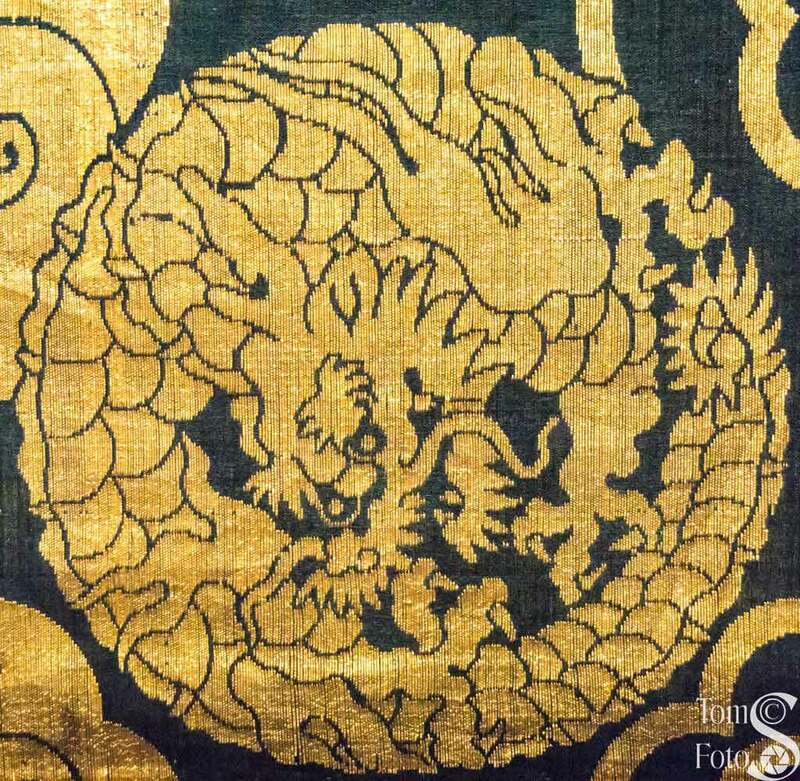 The dragons on the cloth are symbols of Zen Buddhism with rising and descending dragons mirroring the cycle of the seasons. Next come two Chinese hanging scrolls from the 19th century. 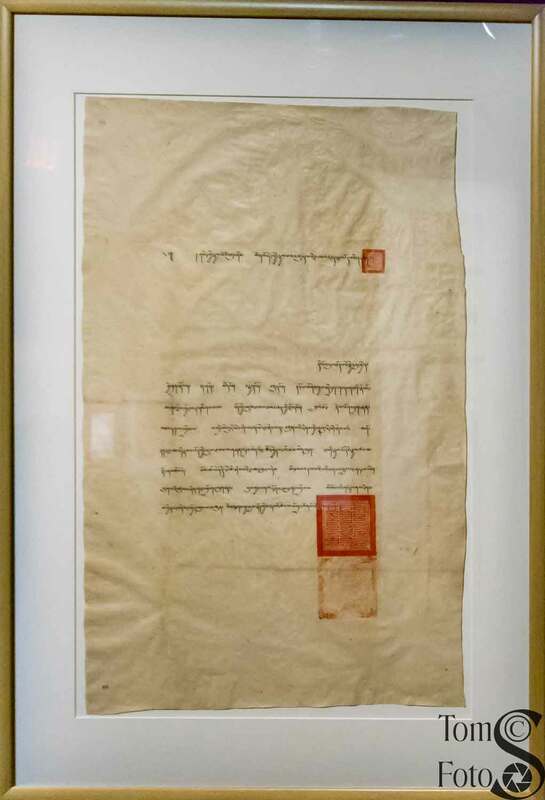 The message to the left is: “Granted your fervent wish, you left human knowledge behind to espouse supernatural wisdom.” To the right the scroll says: “A spirit stemming from the principle of the world is destined to reign supreme over all things.” Both of these messages were able to be interpreted by both Buddhists and Christians alike. Two tempera on silk pictures from the 1930s end the section of this gallery dedicated to the orient. 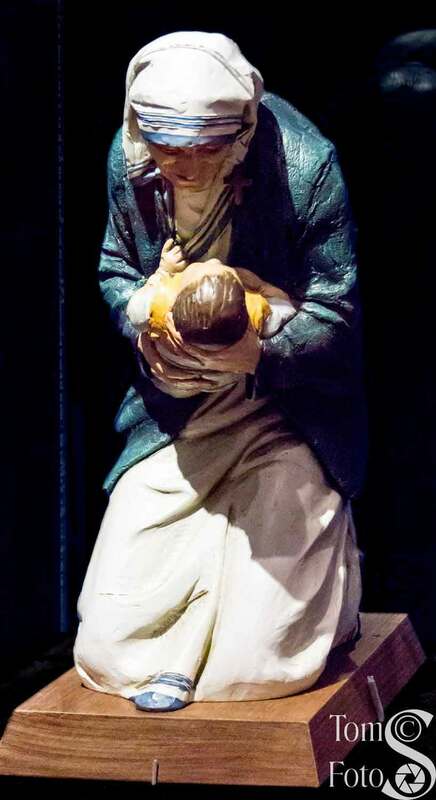 To the left painter Teresa Kimiko Koseki, a graduate of the Imperial Art School and Catholic convert produced sensitive renderings of religious subjects such as this Christian Woman Standing with Child. 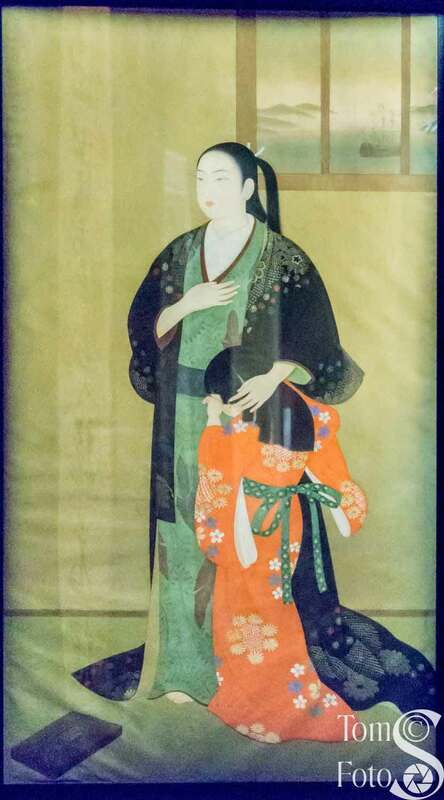 On the right the same artist shows Blessed Gracia, Princess Hosokawa, a Catholic convert from the late 1500s. 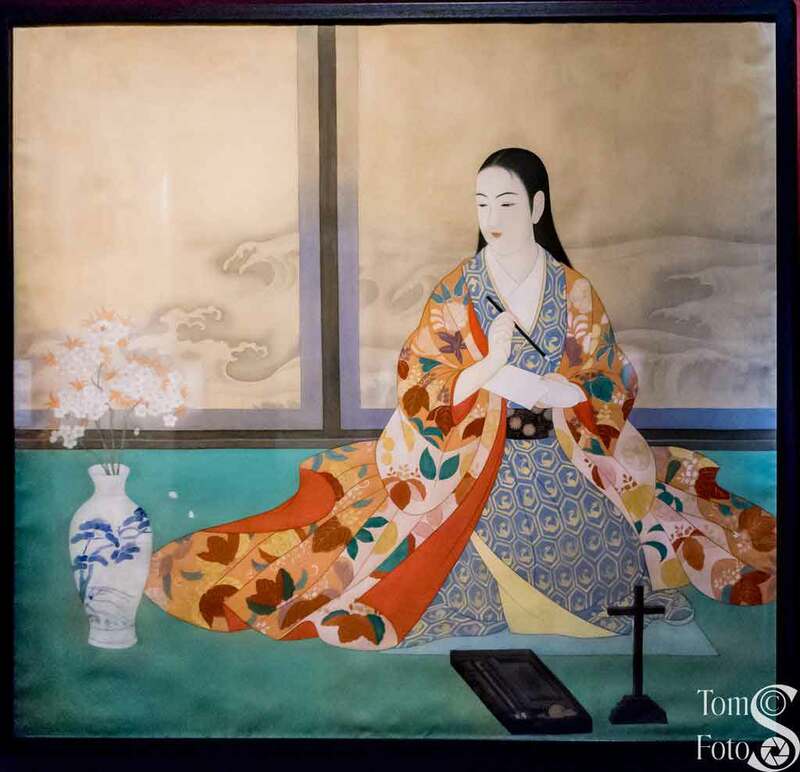 She is celebrated in novels, plays, at an annual festival in Kyoto and, more recently, has become an anime heroine. In 431 C.E., at the Ecumenical Council of Ephesus, Mary was declared to be the Mother of God. Portraits of Mary were first crowned during the Middle Ages. In the 16th century papal approval was required for the crown and in the 17th century a liturgy marked the occasion. Several crowned images appear in the gallery. To the left is the crowned Madonna, Our Lady of Mercy; patron saint of Peru. 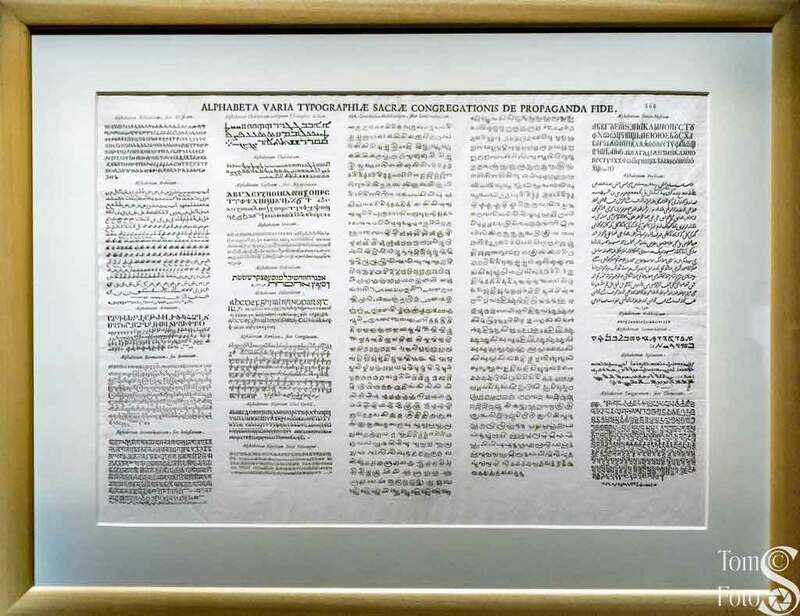 The image was crowned 24 September 1921 to commemorate the centenary of Peruvian independence from Spain. At the same time Our Lady of Mercy was declared Grand Marshal of the Peruvian army. On the right is the crowned Madonna, Our Lady of the Valley; patron saint of pearl divers, fishermen, and all seafarers. 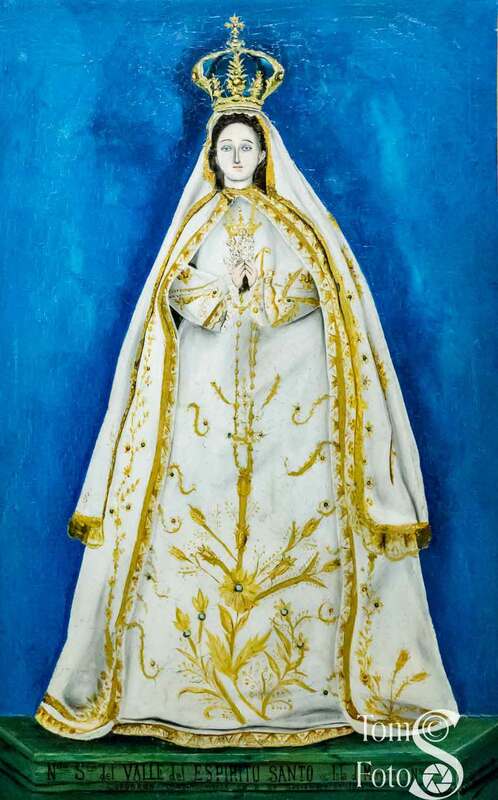 The Madonna was crowned in Venezuela 8 September 1911, the Feast of the Nativity of Mary. 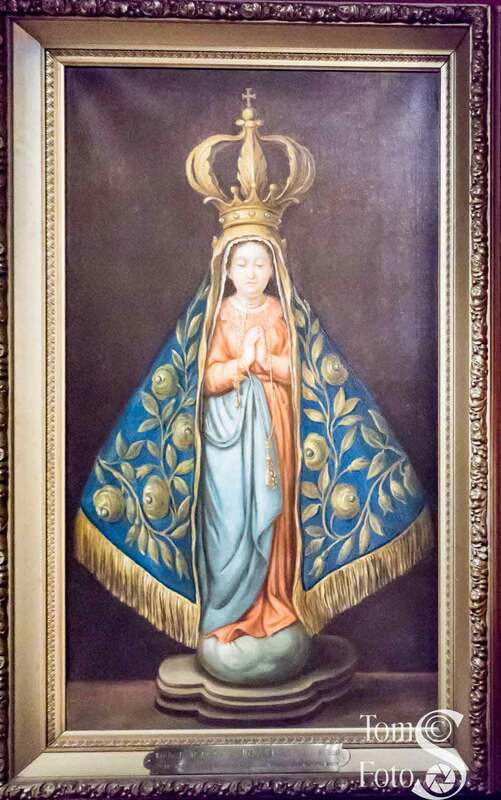 The third crowned Madonna is Our Lady of Aparecida; beloved patron saint of Brazil. 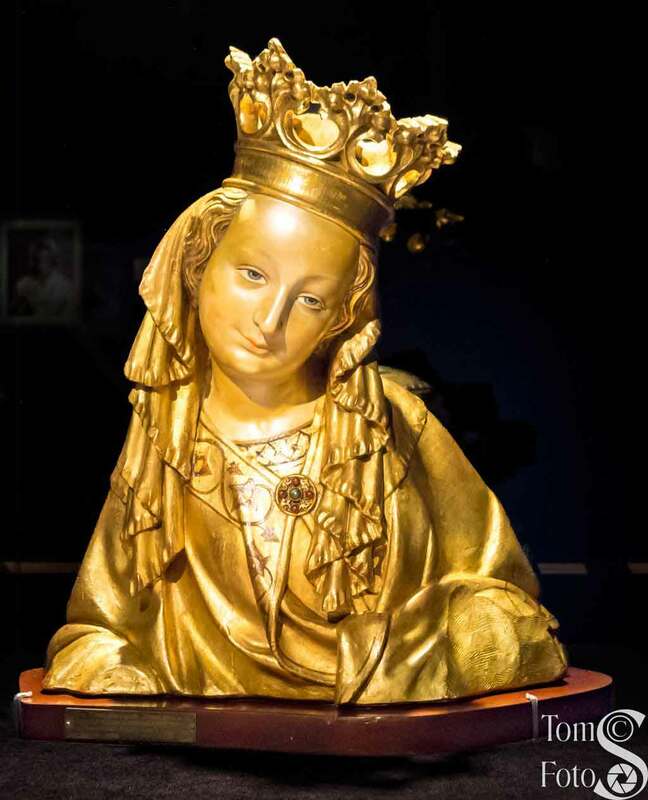 The Madonna was originally crowned in 1904 at the request of Saint Pius X. The blue robe was added at this time as well. 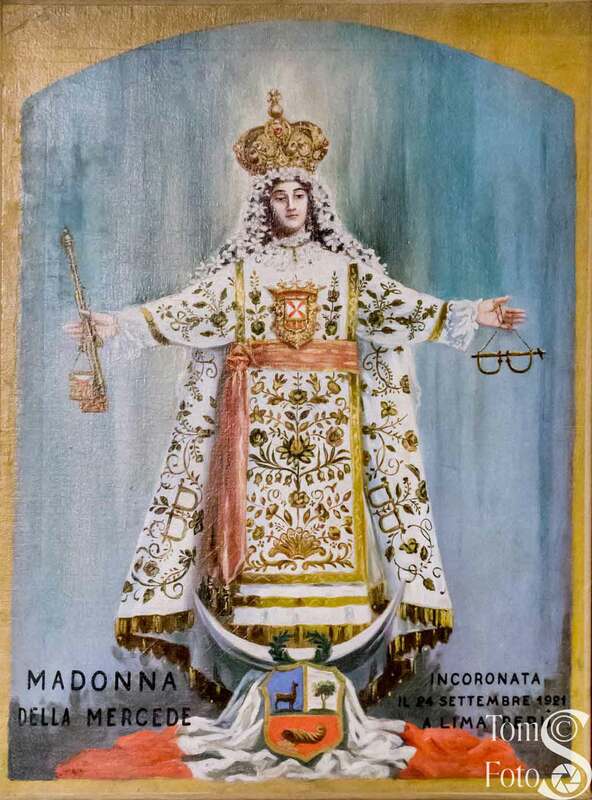 Pope Pius XI made the Madonna’s shrine a minor basilica in 1921 and Saint John Paul II reiterated the blessing in 1980 as the first pope to visit Brazil. 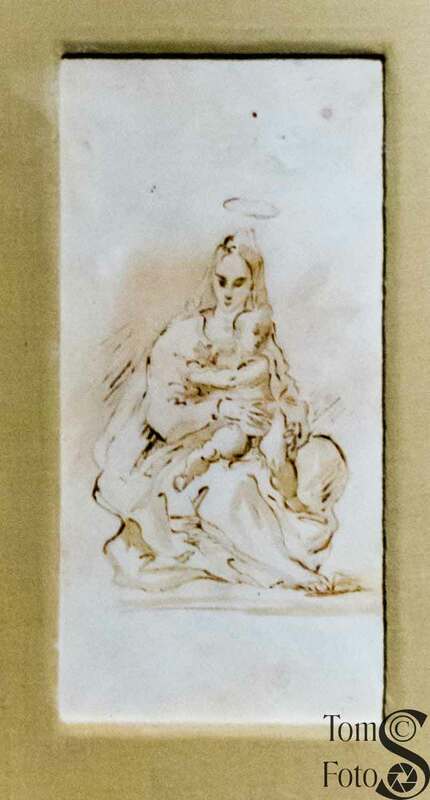 A fourth 1849 oil on wood Madonna depicts the Virgin Mary with Infant Jesus and a Gospel in Arabic. The figures are a darker skin. No information is given on who the painter might have been. 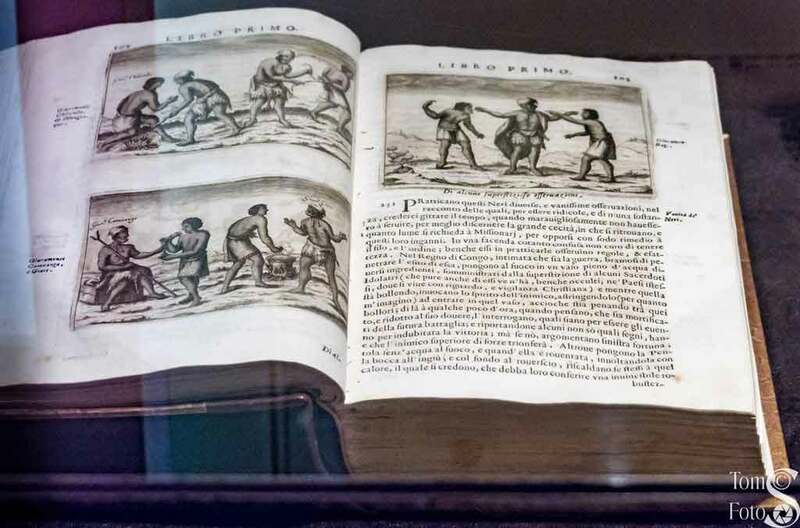 The book seen here is a Guaraní Grammar and Dictionary; the language of indigenous inhabitants of present-day Paraguay. 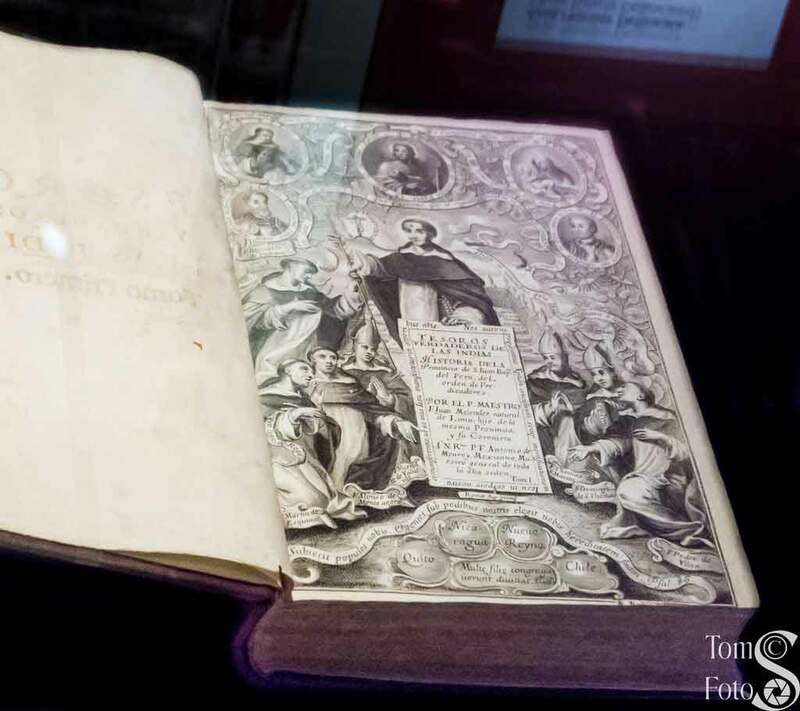 It was authored by Antonio Ruiz de Montoya, a Jesuit born in Lima, Peru and dates from 1640. 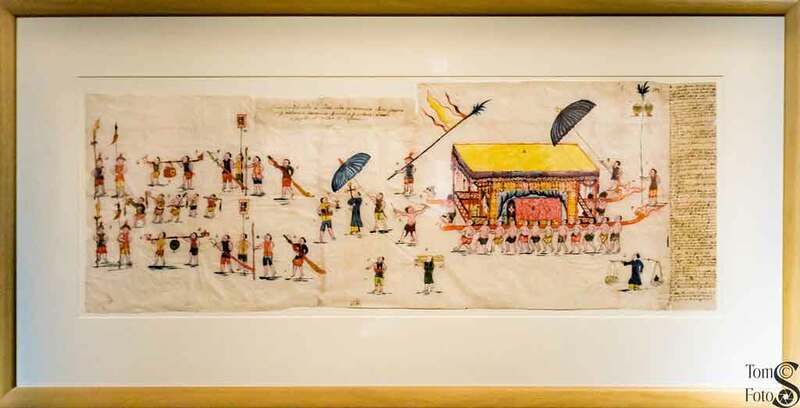 The next exhibit is perhaps one of the most unusual to be seen: a book from the 17th century written in Tamil on palm leaves and then bound accordion fashion and enclosed in bamboo. Ignacimuthu Mudaliyar, a missionary in southern India, made the book which describes Saint Francis Xavier, patron saint of missionaries. A series of maps are on display next in line. 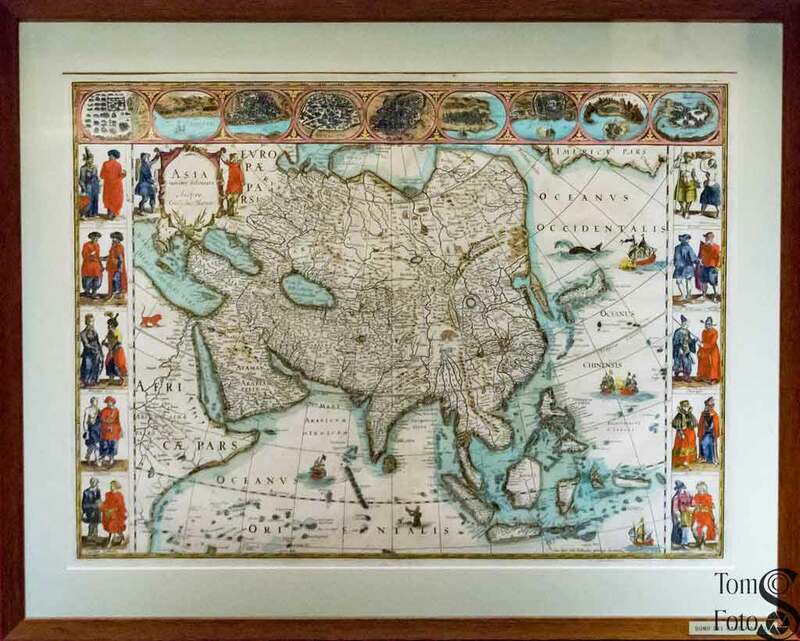 The first (left) is a map from Jerusalem to Aleppo prepared by local monk Arsenio Diab and dating from 1778. The next two maps are particularly interesting. 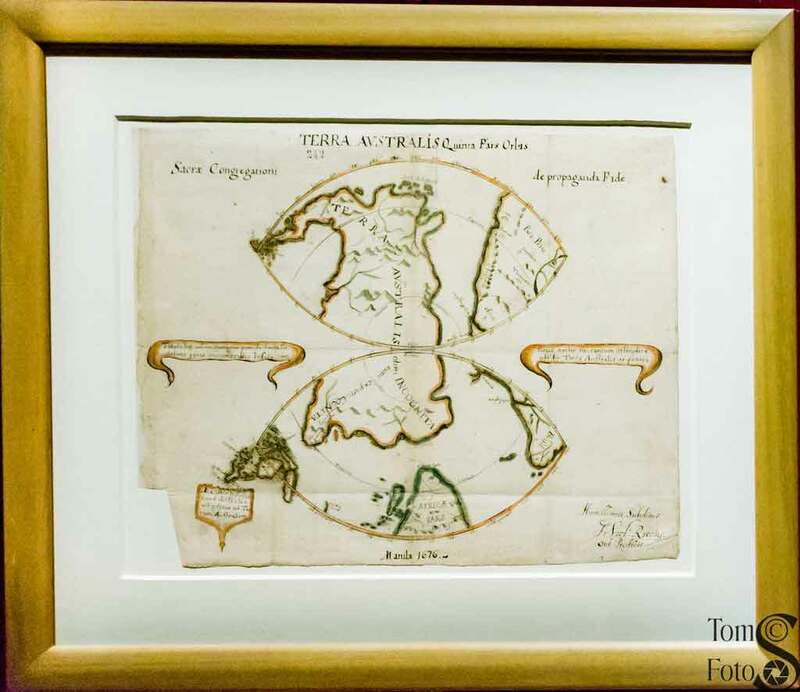 They are maps taken from Theatrum Orbis Terrarum (Theater of the World), said to be the first modern atlas. 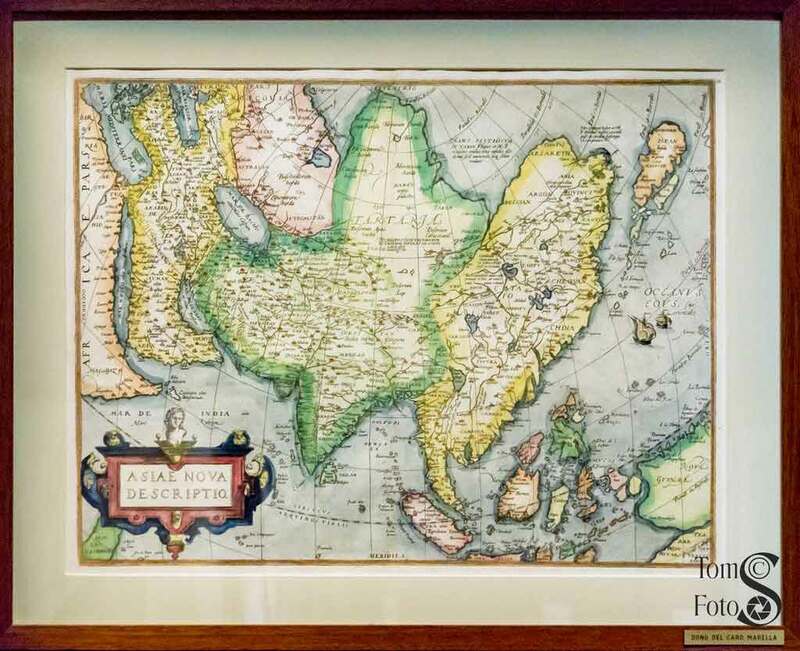 Flemish cartographer Abraham Ortel (Ortelius) created a work that started with 70 maps and became 167 maps. 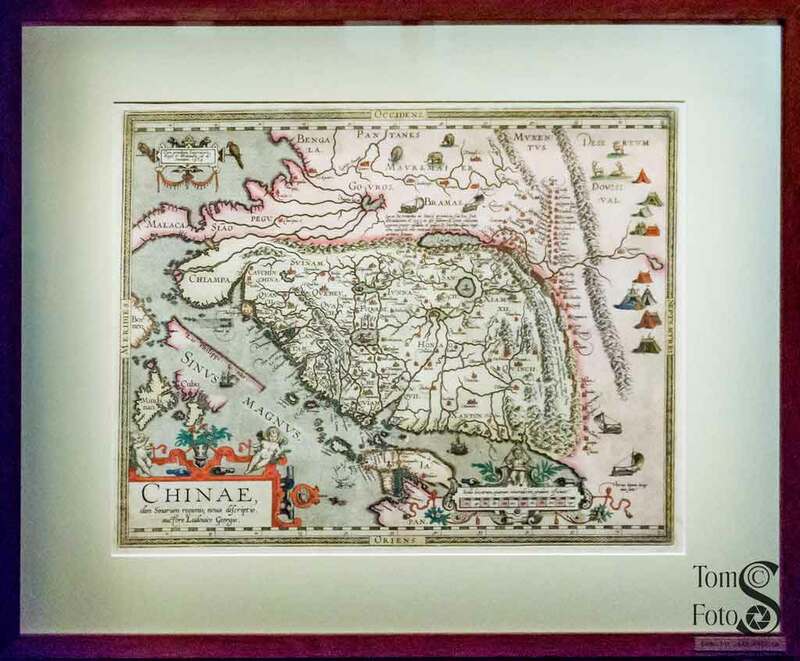 To the left you see a new description of Asia dated 1573 and to the right a new map of China dating to 1584 is shown. A large display of another 1584 object, the Nomenclator Ptolemaicus, is next in line. Produced by Abraham Ortelius, this book lists all the place names that occur in Ptolemy’s Geographia. Two interesting books follow. 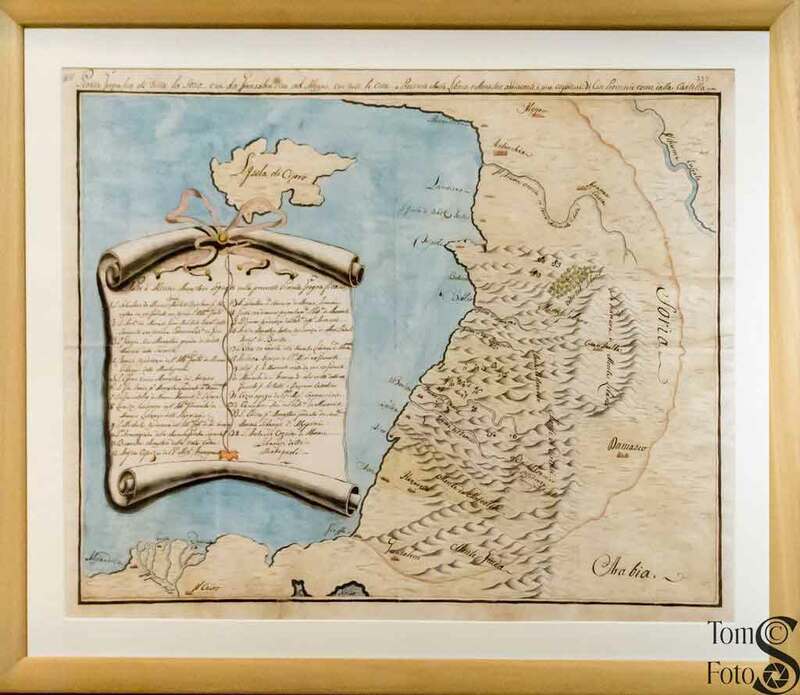 To the left is a photo of a “Historical Description of the Three Kingdoms of Congo, Matamba, and Angola” by Capuchin missionary Giovanni Cavazzi. The book dates from 1687. The photo the right shows the book “Souvenirs of Africa” by Jean Simon dating from 1924. The book is handwritten and contains watercolors of South African missions. 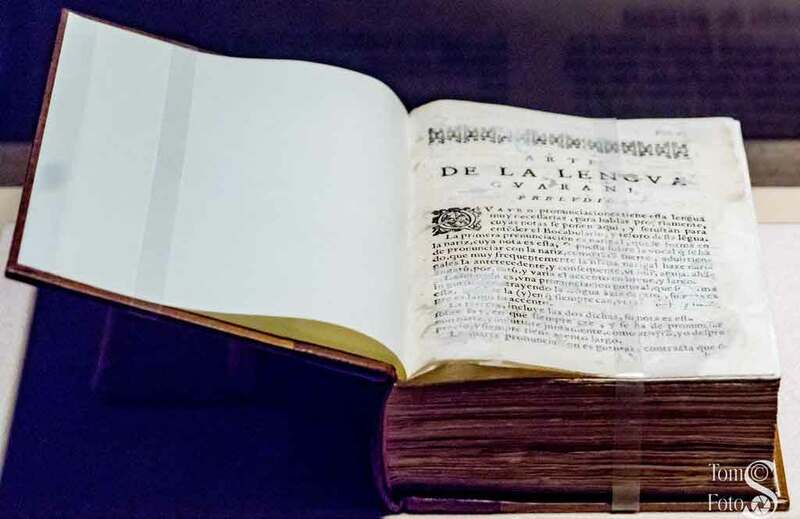 A large book, “True Treasures of the Indies,” is rather famous for being a chronicle of the history of the Dominican missions in Peru. Written by Dominican Padre Juan Meléndez it dates from 1681-1682. 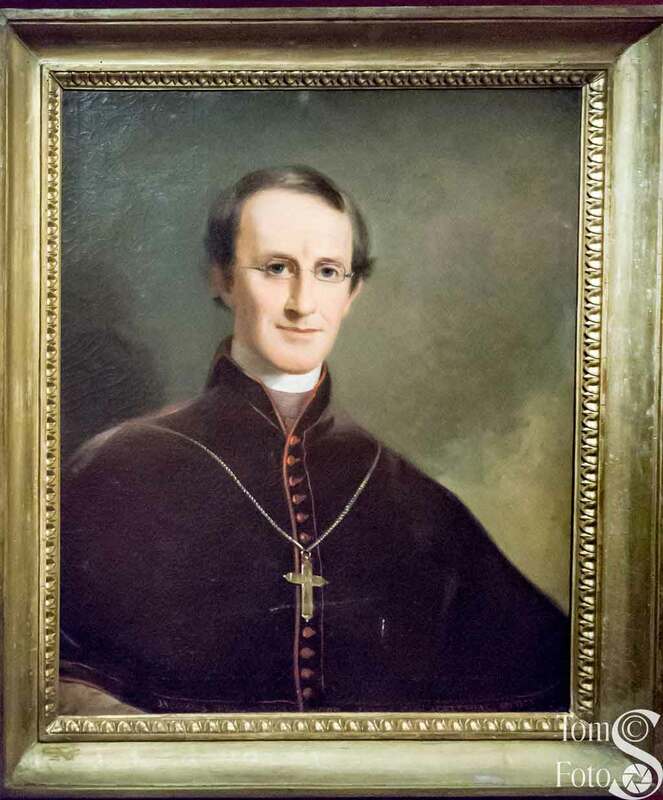 Across from that display is a curious oil on canvas of native Philadelphian James Wood who was appointed Coadjutor Bishop of Philadelphia in 1857. In 1875 he became the first Archbishop of Philadelphia. Why curious? The Bishop was appointed as a missionary. Until the early 20th century, the Church considered the United States a missionary territory. 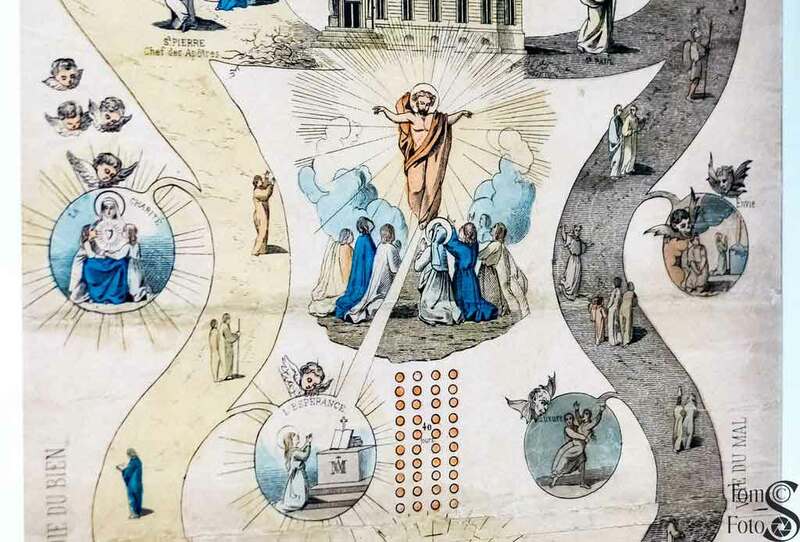 Toward the end of the gallery is a beautiful, 19th century illustrated catechism produced by Albert Lacombe, a missionary in western Canada. This catechism was designed for the Cree and illustrates the entire Bible using two paths. The path on the left is a righteous path leading to Heaven. The path on the right is an evil path leading to Hell. 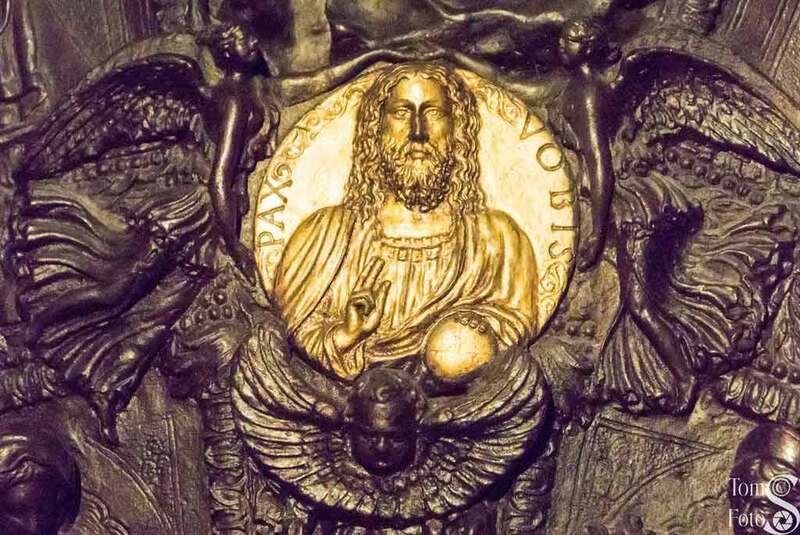 The detail photo to the right shows Jesus ascending into Heaven. 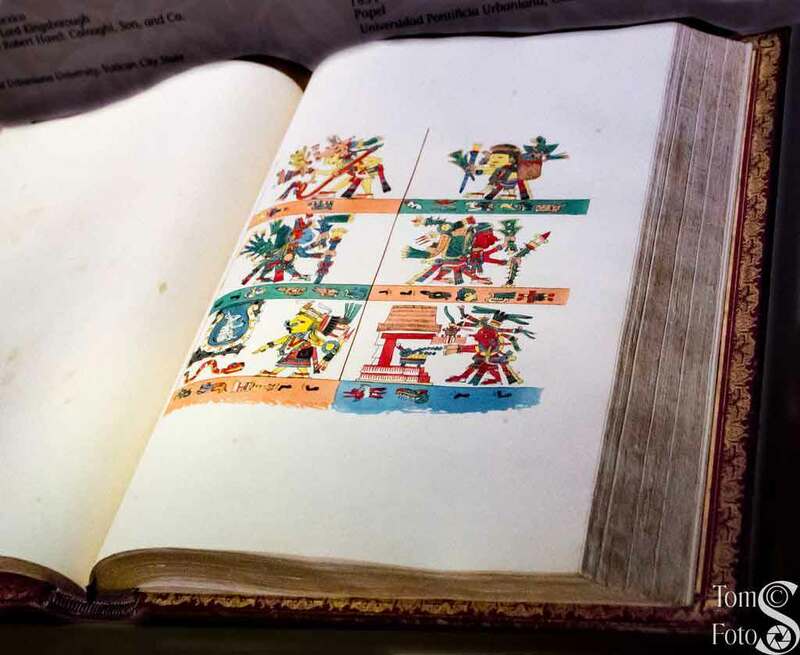 The gallery ends with the book “Antiquities of Mexico” by Edward King, Lord Kingsborough from data gathered by Agostino Aglio and published in 1831. 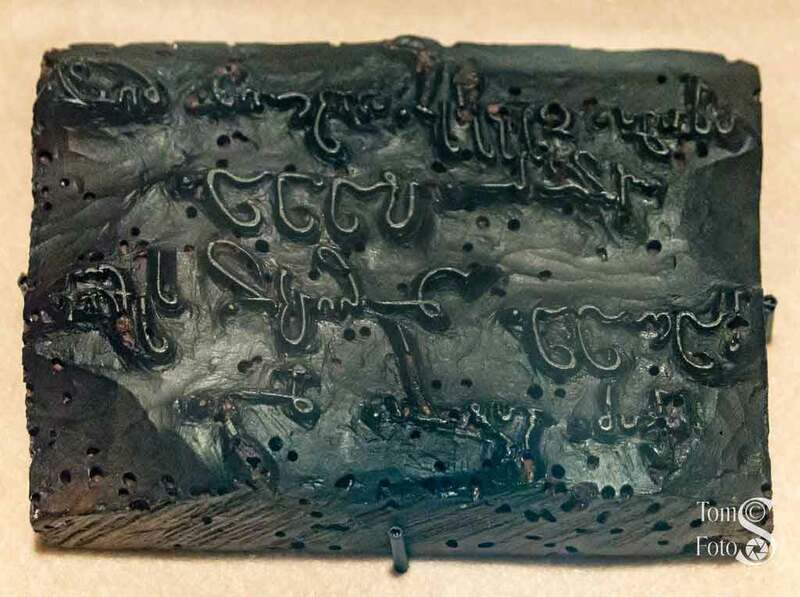 Kingsborough commissioned Aglio to go through the archives of Europe and reproduce all the pre-Columbian manuscripts and artifacts and views of ruins so they cold be made available for study by others. 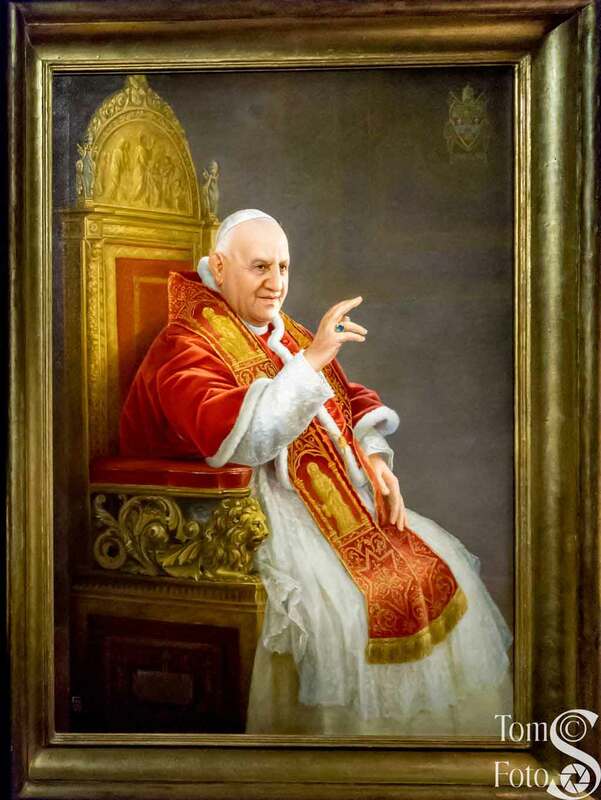 Many papal portraits in many different formats and media have been produced over the 2000 years of the papacy. Such images help people understand the lineage from Saint Peter and help Christians better know and understand their current and past popes. This gallery presents some of those images. 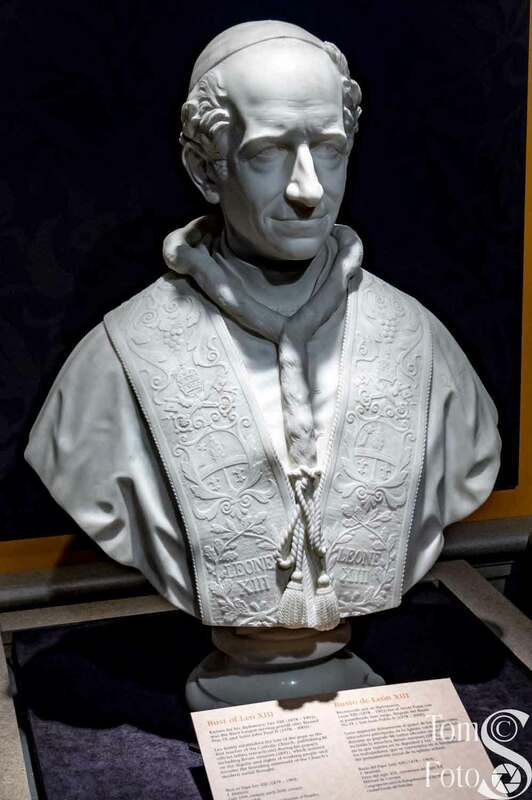 We first show a bust of Pope Leo XIII (1878-1903), the third longest serving pope after Blessed Pius IX and Saint John Paul II. He was quite prolific, publishing 86 encyclicals on various subjects during his papacy. The Carrara marble bust dates from the late 19th or early 20th century and was carved by F. Matteini. Two oil on canvas portraits follow. To the left we see Saint Pius X (1903-1914). He was canonized in 1954. 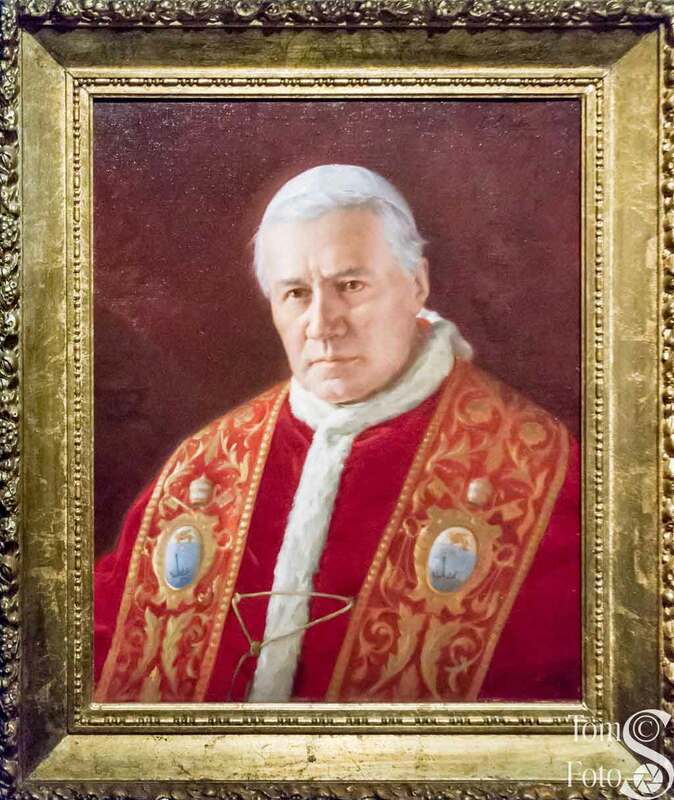 The portrait dates to 1912 and was painted by T. Senatori. 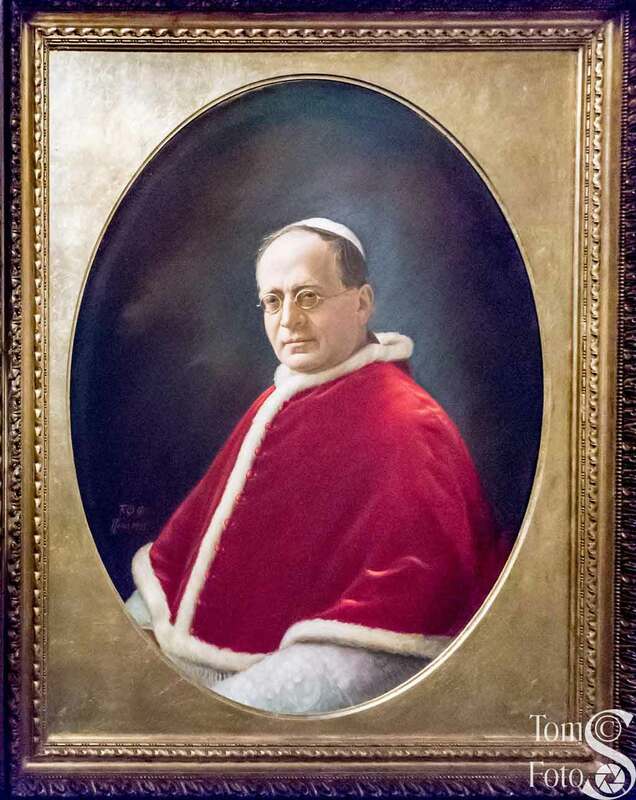 On the right is Pius XI (1922-1939) who presided at the 1929 signing of the Lateran Treaty with the government of Mussolini. This treaty made the Vatican an independent city-state within Rome and Italy. 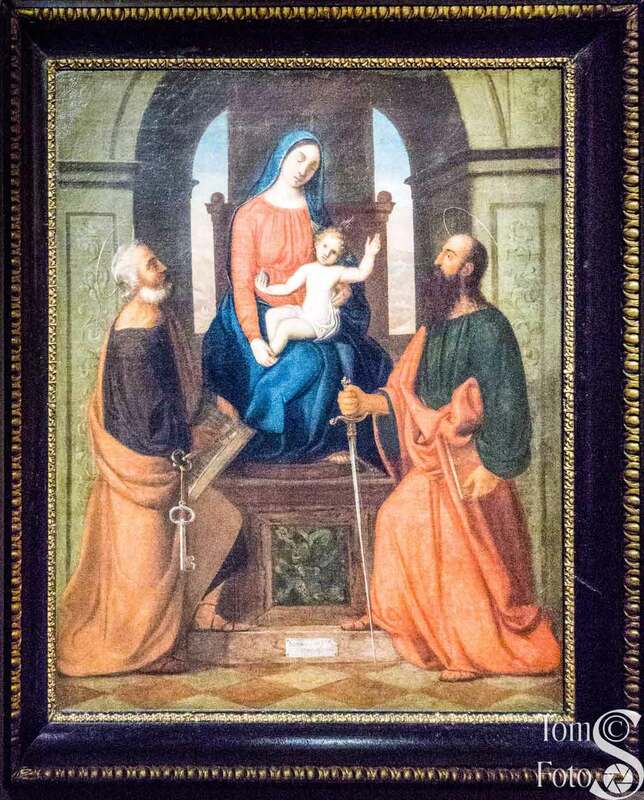 The portraits is dated 1925 by the Franciscan Missionary Order of Mary. Many portraits of early popes were lost when the Basilica of Saint Paul Outside the Walls burned to the ground the night of 15 June 1823. 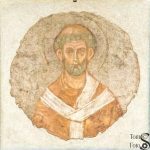 The walls of the basilica (built in the 4th and 5th centuries) were covered with frescoes representing some 250 popes back to Saint Peter. A carpenter left some candles burning which started a fire that destroyed the building. 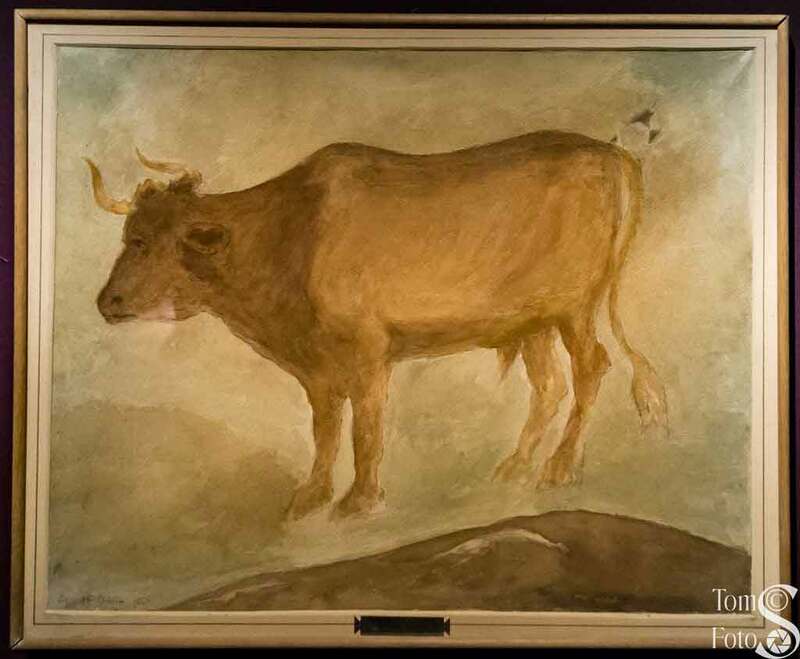 Some 42 of the frescoes survived and you will see four of them shortly. 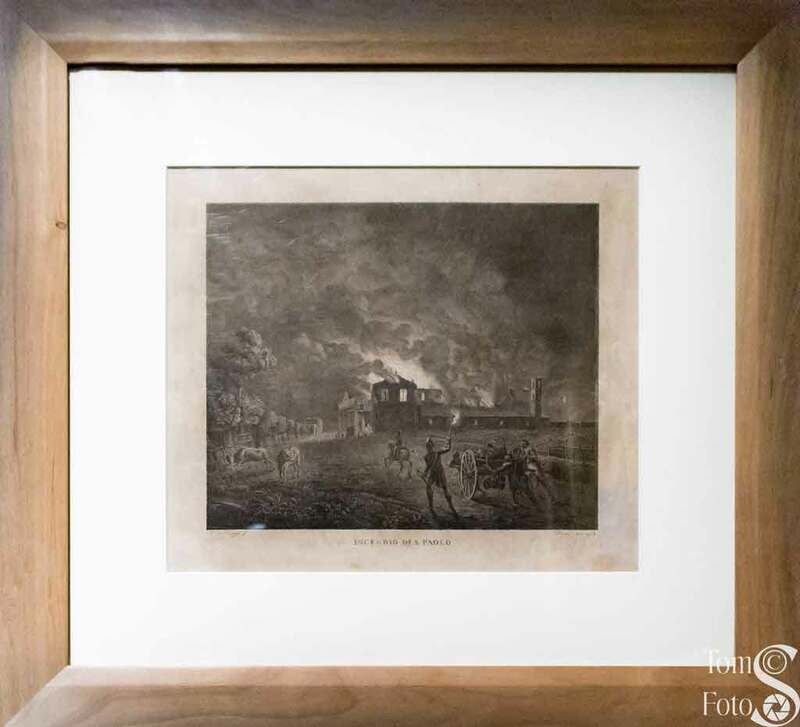 To the left is an 1823 lithograph of the fire by Ascanio di Brianza. 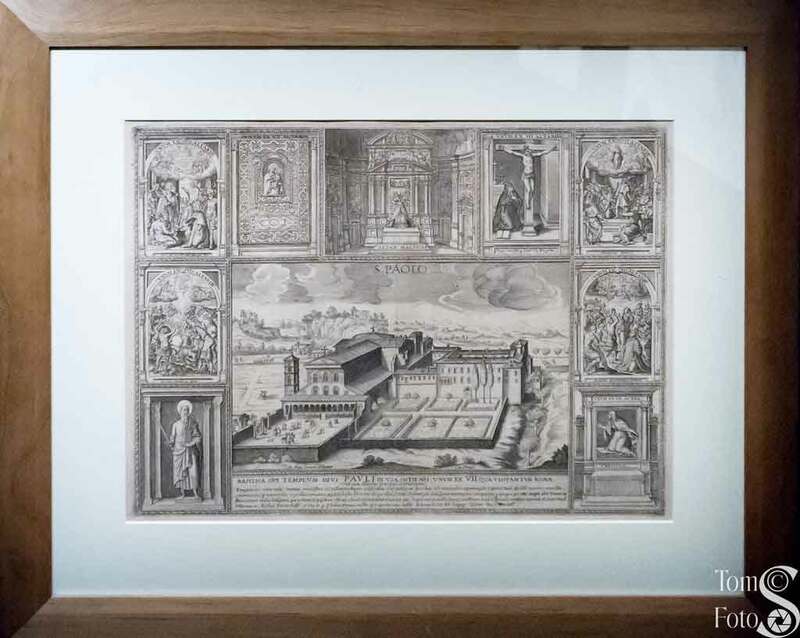 To the right is a 1618 Burin etching by Giovanni Maggi showing central images of the Basilica with small images around showing devotional objects. A large display showing three mosaic cartoons and four of the saved frescoes is along one wall. The three larger images are cartoons painted as models for mosaics in the rebuilt Basilica. To the far left is Saint Sylvester (314-335). The image is based on a medieval original and so is not an exact likeness. The center large image is of Saint Peter. If you look closely you can see grout lines in the paintings to guide the person making the mosaic. The third large painting on the far right is Pope Sixtus IV (1474-1481). He was the founder of the Sistine Chapel. Saint Hyginus (136-140) and Saint Telesphorus (125-136). 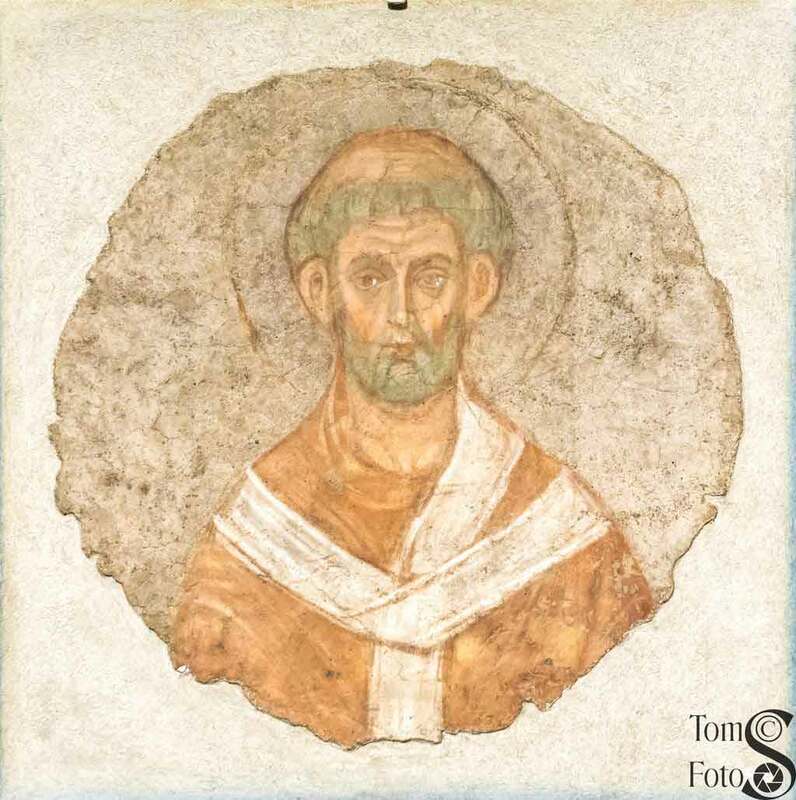 Saint Sixtus I (115-125) and Saint Anacletus (76-88). 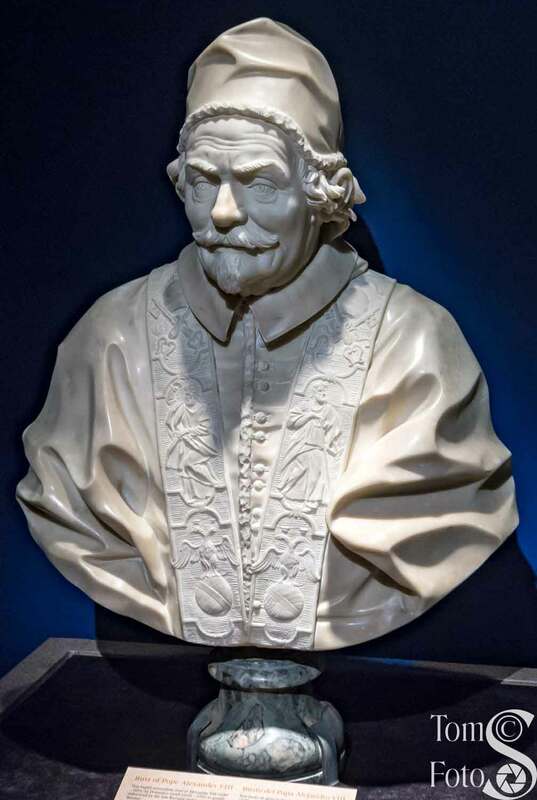 Carrara marble busts of several popes now follow, starting with Pope Alexander VIII (1689-1691) who feuded with the French king, Louis XIV about his claim that the French Catholic Church was independent from Rome in certain matters. The bust is attributed to Domenico Guidi circa 1691. To the right is a bust of Blessed Innocent XI (1676-1689) by Paulus Morellus in 1692. 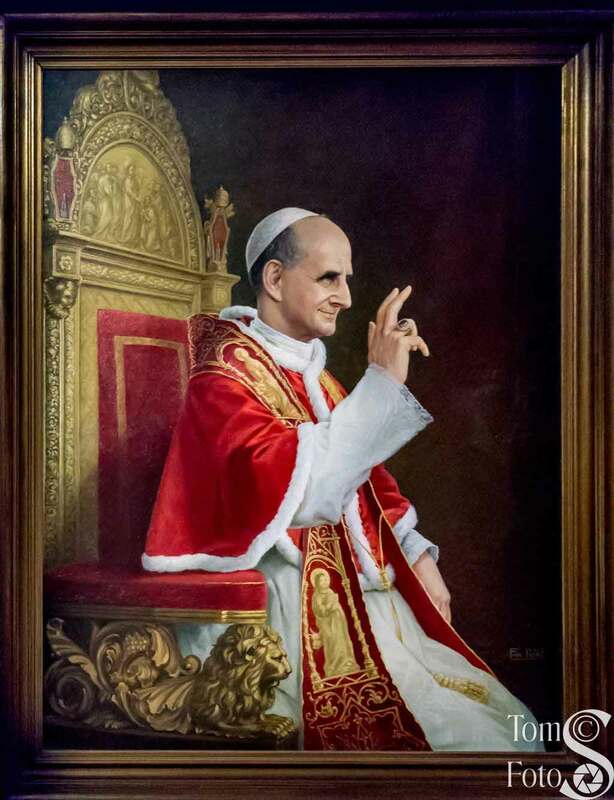 Innocent XI was important for “cleaning up” many of the church’s moral failures of the time (e.g., nepotism among cardinals, making clergy live up to their moral vows, encouraged financial help to the poor, etc.). 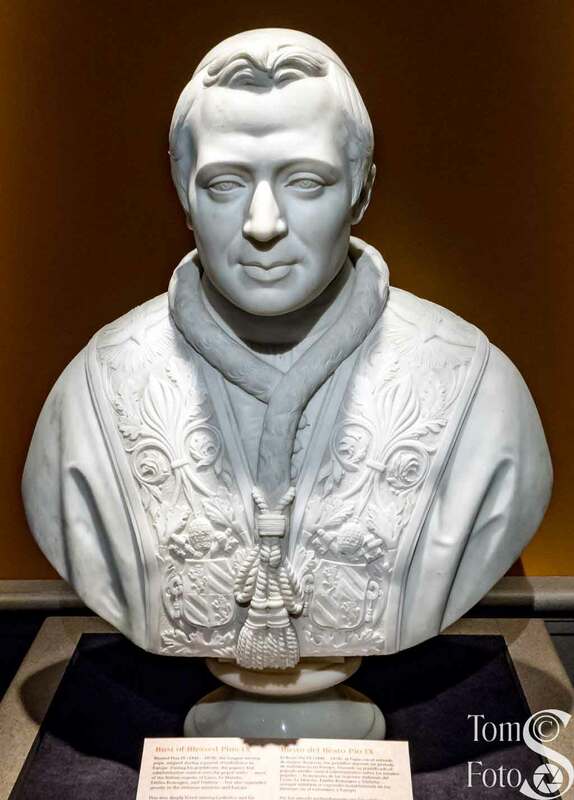 Finally, we see a bust of Blessed Pius IX (1846-1878) by C. Guidi and dating from the last quarter of the 19th century. Pius IX was loved by Catholics and his image was frequently found in households. Benedict XV (1914-1922) was a skilled diplomat during a time of world war. While staying neutral, he spent time and money for relief work for wounded and refugees. We see here a wood coat of arms and oil on canvas portrait by A. Zoffoli. 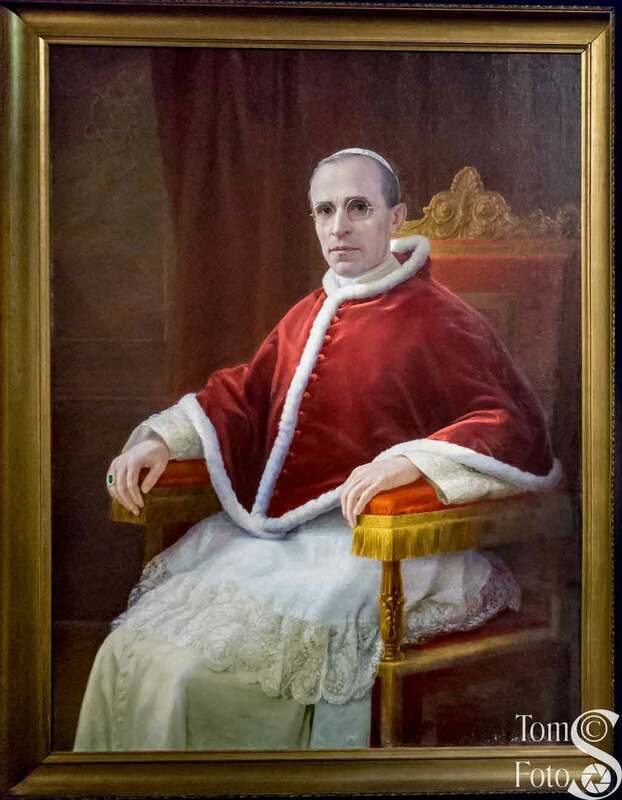 Two images of Pope Pius XII (1939-1958) are presented. 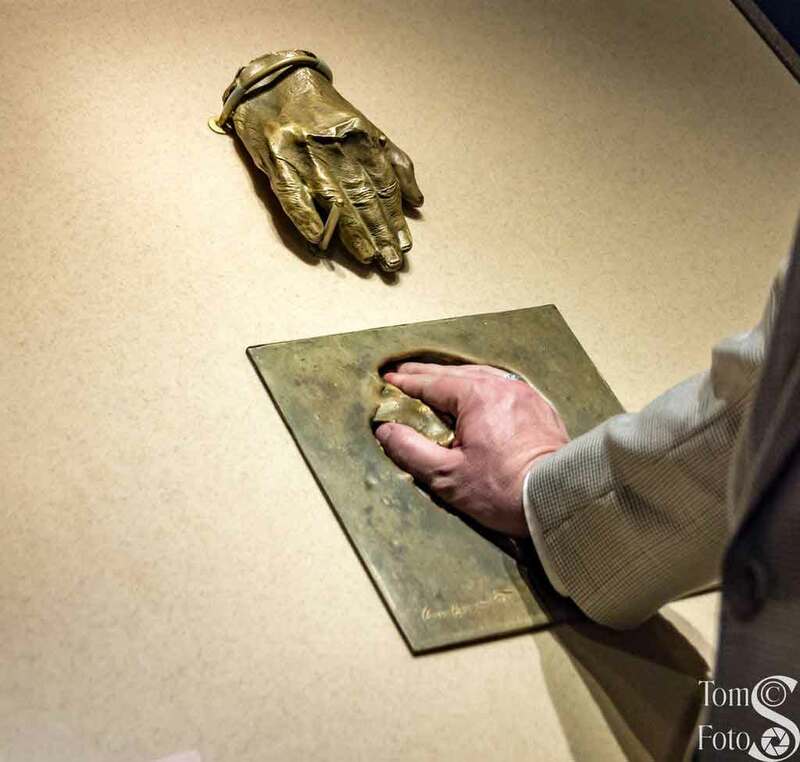 The first is a small scale bronze (maquette) study for the larger statue in Saint Peter’s Basilica. This is one of 18 made in different poses. The bronze was made by Francesco Messina and dates to 1962-1963. 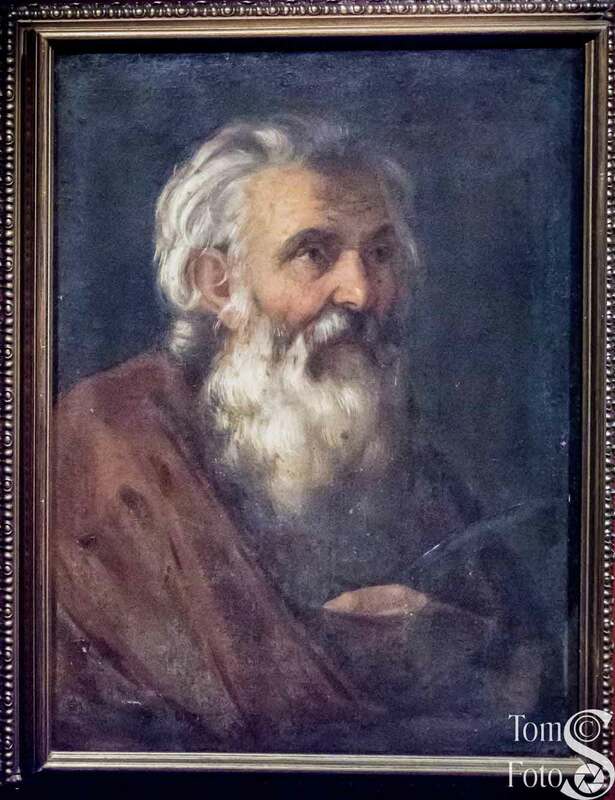 The oil on canvas portrait is by the Franciscan Missionary Sisters of Mary (the order produced many portraits but signed them in the name of the order instead of the individual artists). 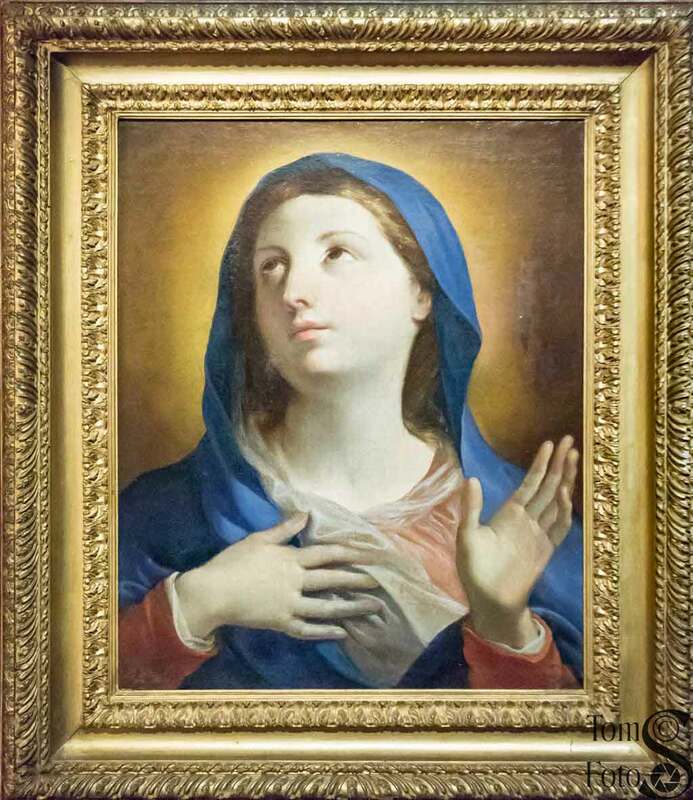 This gallery ends with a plaster bust of the Virgin Mary by an unknown artist and dated 1939. 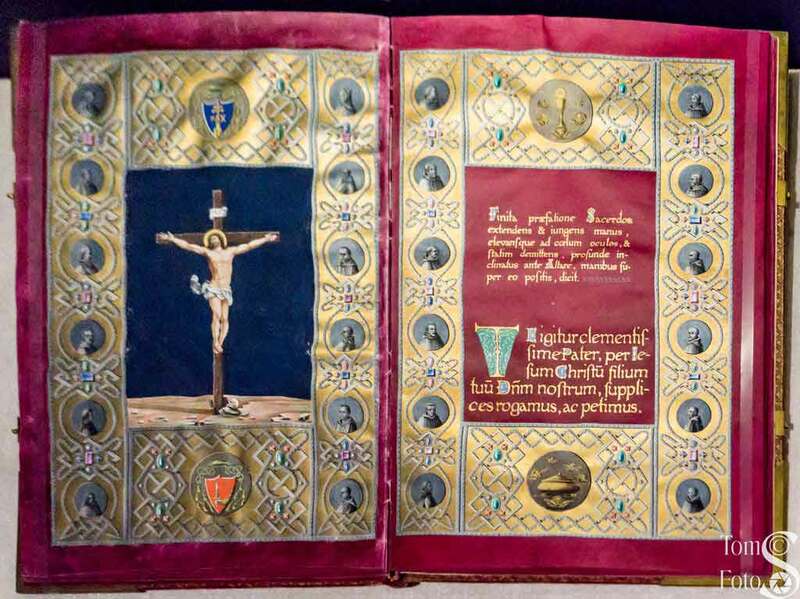 It was a gift to Pius XII who kept it in his study possibly as a reminder of his years as papal nuncio in Germany. Every genuine art form in its own way is a path to the inmost reality of man and of the world. It is therefore a wholly valid approach to the realm of faith, which gives human experience its ultimate meaning. 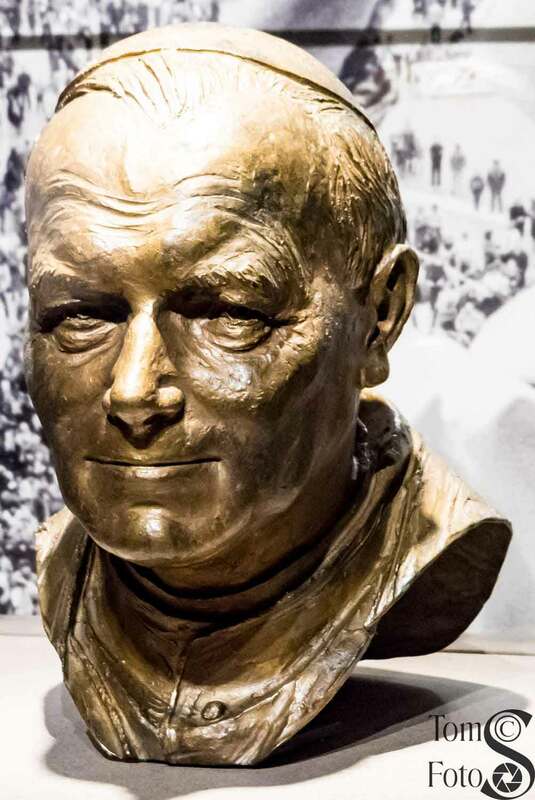 This bronze bust of Saint John Paul II (1978-2005) was produced by Enrico Manfrini. Saint John XXIII (1958-1963) was, on election, expected to be a caretaker pope; but, he became very influential. In 1962 he convened the second Vatican Council which saw almost 3,000 bishops come to Rome to discuss the Church and its position in a changing world. 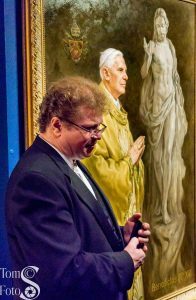 The portrait shown here is by the Franciscan Missionary Sisters of Mary. 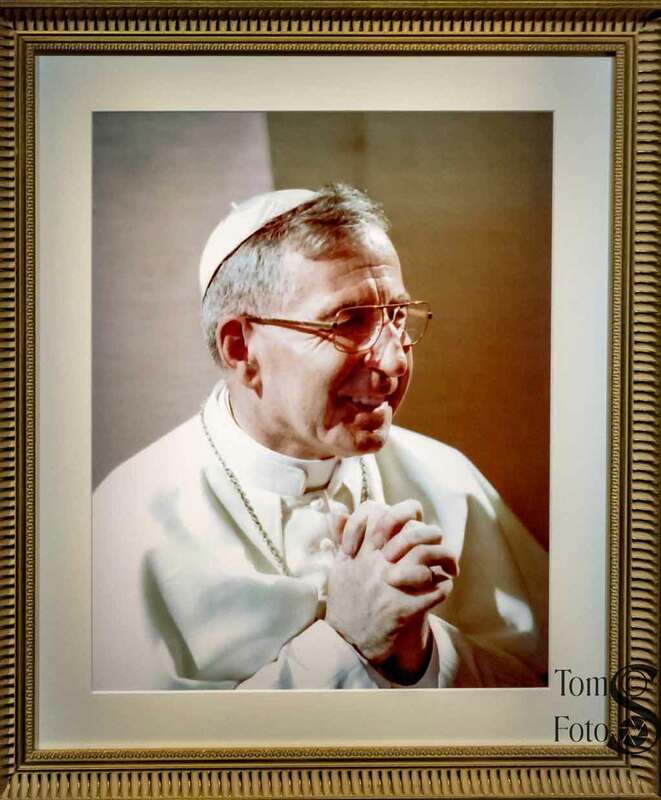 A photograph by Arturo Mari, who served under six pontiffs, shows off the “smiling pope,” John Paul I (1978-1978). Sadly, John Paul I died after only 33 days in office. John Paul I’s passing led to the election of the second-longest serving pope and first non-Italian since 1523: John Paul II (1978-2005). 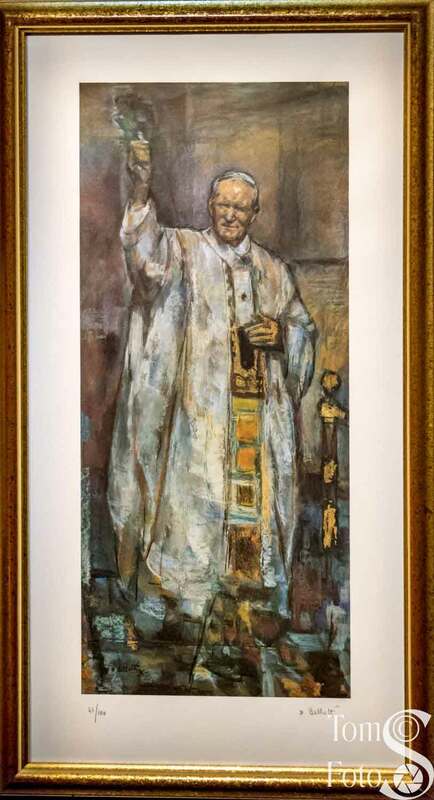 John Paul II was influential and spiritual and was beloved by Catholics the world over. At his funeral Mass, crowds were shouting “Santo subito!” (Canonization now!). As a result, the five year waiting period was lifted and after a second miracle attributed to him, his canonization took place 27 April 2014. This print on paper is by Dina Bellotti. A lamp is kept lit in front of the Salus Populi Romani (Protector of the Roman People) icon of the Virgin Mary at the Basilica of Saint Mary Major. 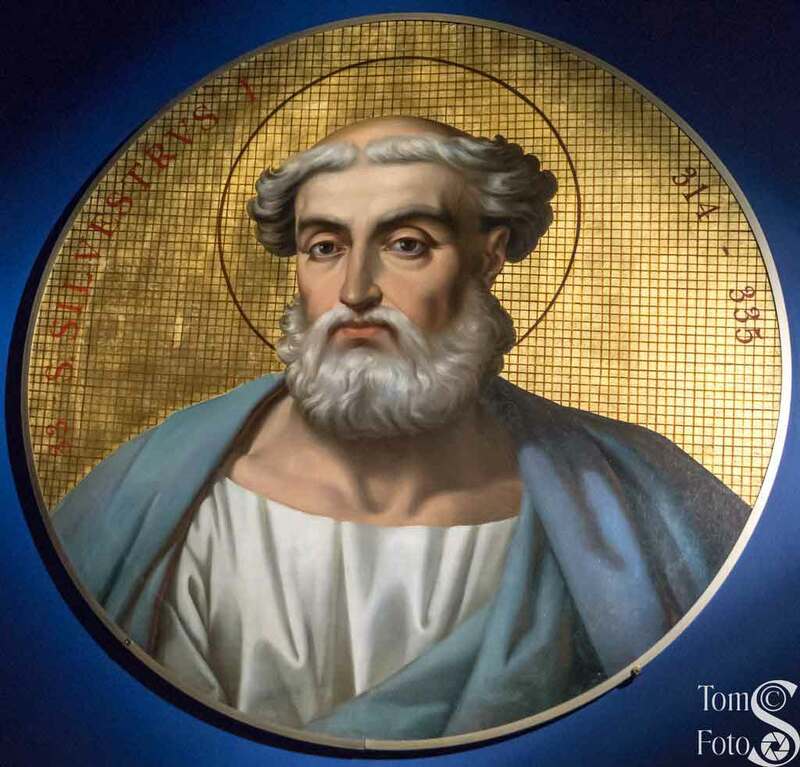 It’s said the icon was painted by Saint Luke the Evangelist (third Gospel and Acts of the Apostles author). 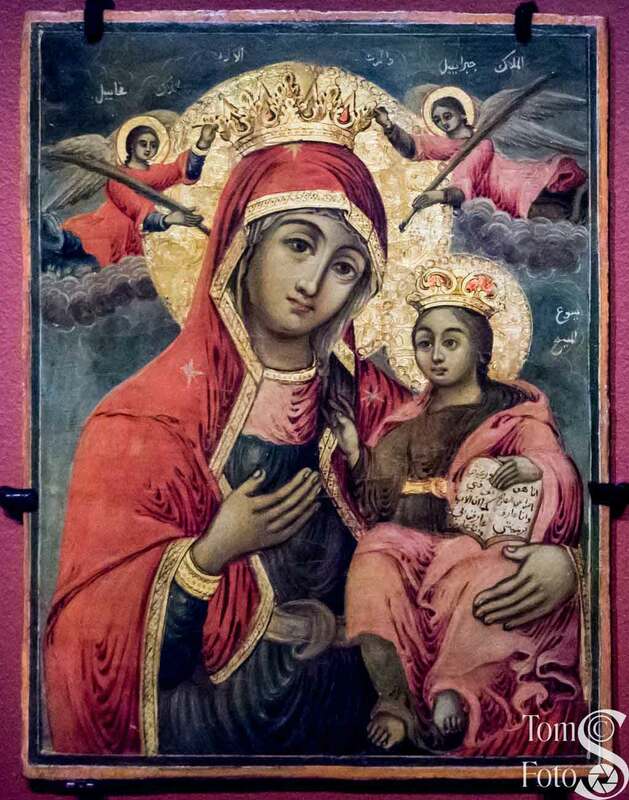 It’s a Byzantine icon and has been venerated continuously since at least the 12th century. 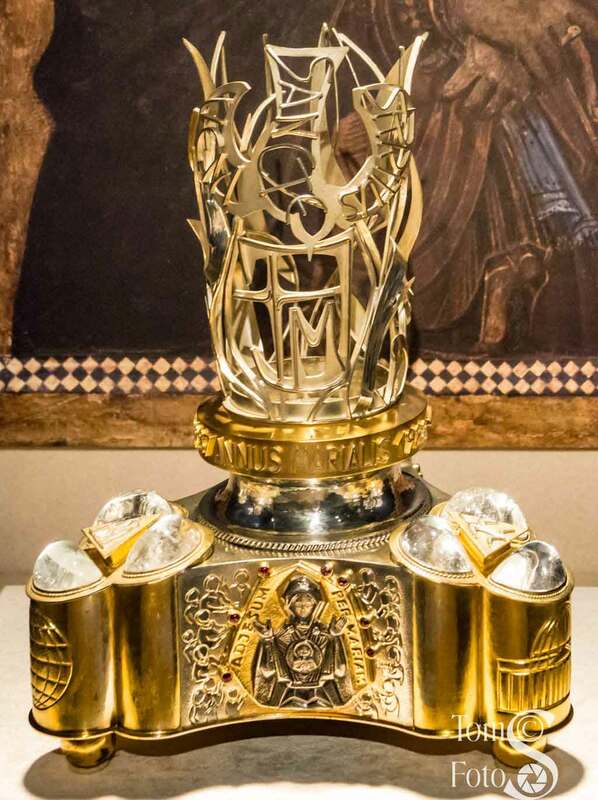 Saint John Paul II donated the beautiful votive lamp made of gilt silver shown here for that purpose. 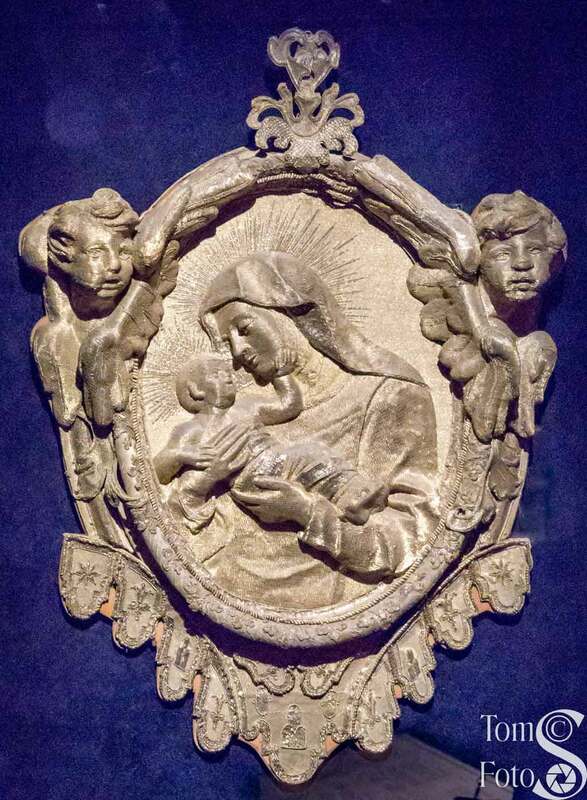 One of the gifts to Saint John Paul II is this painted pottery relief called Madonna of the Angels by the ceramists of Faenza. 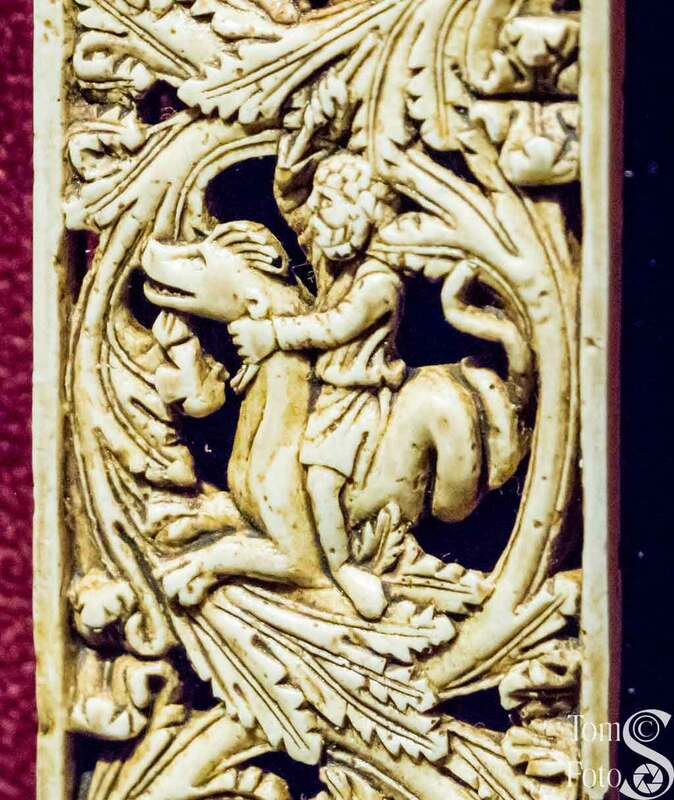 It represents a story in Dante’s Divine Comedy where angels took a 10th century Byzantine bas relief to Ravenna, a city often regarded as a link between eastern and western devotional traditions. Blessed Mother Teresa of Calcutta was devoted to the poor and worked tirelessly on behalf of the neglected. She was awarded a Nobel Peace Prize in 1979 and the Missionaries of Charity is active in over 130 countries. Saint John Paul II and Mother Teresa enjoyed a close spiritual friendship. 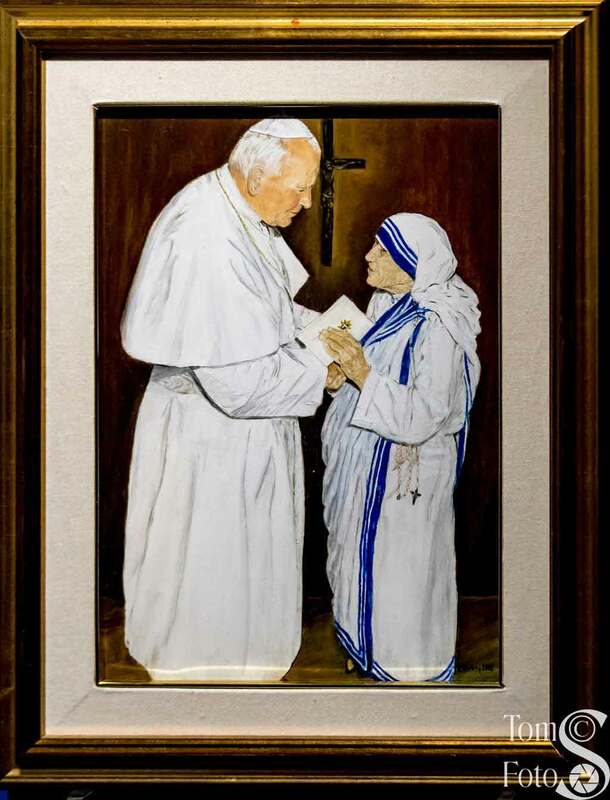 The 2002 portrait to the left by B. Alesky shows the pope with Mother Teresa. 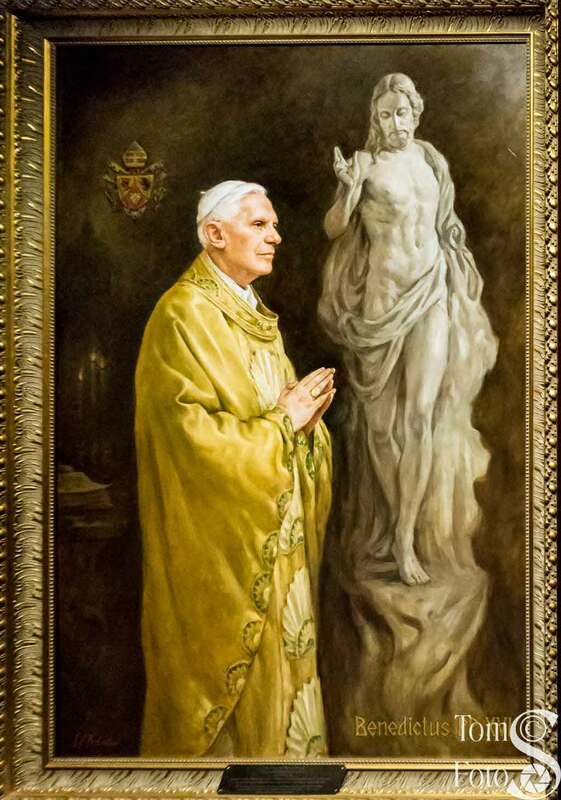 The statue shown to the right was given to Saint John Paul II in her memory on 5 September 2000, the third anniversary of her death. Upon the death of Saint John Paul II, Benedict XVI (2005-2013) was elected. He was the first German pope since Victor II in 1055 and at 78 when elected, he was the oldest to become pope since Clement XII in 1730. And, to continue the series, on 28 February 2013 he became the first pope since Gregory XII in 1415 to resign the papacy. We see here a bronze coat of arms and a 2008 portrait by Igor V. Babailov. Less than a month from Benedict XVI’s resignation, on 13 March 2013, Francis became the 266th pontiff in a line extending back 20 centuries. He is the third non-Italian pope in succession having been born in Argentina. He has quickly become quite popular around the world. And, with his photo we end this page.